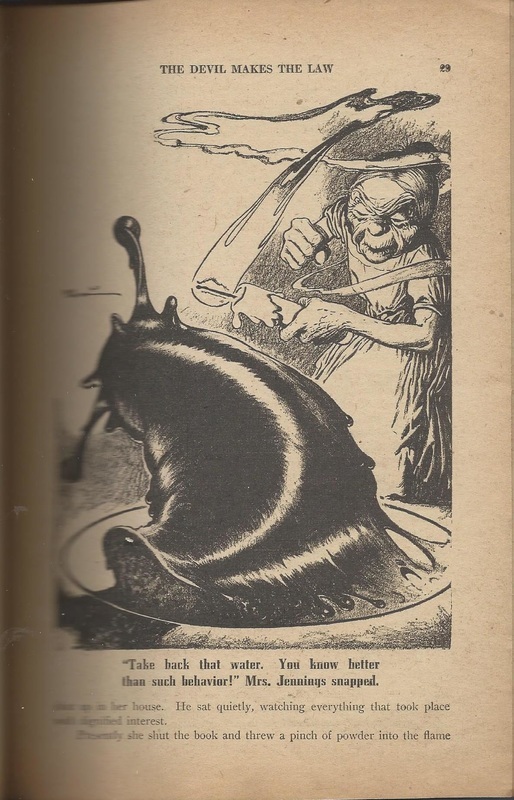 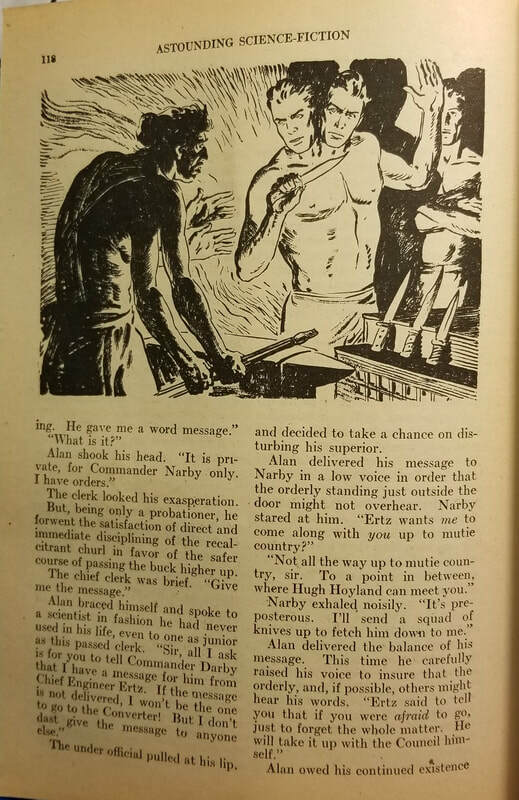 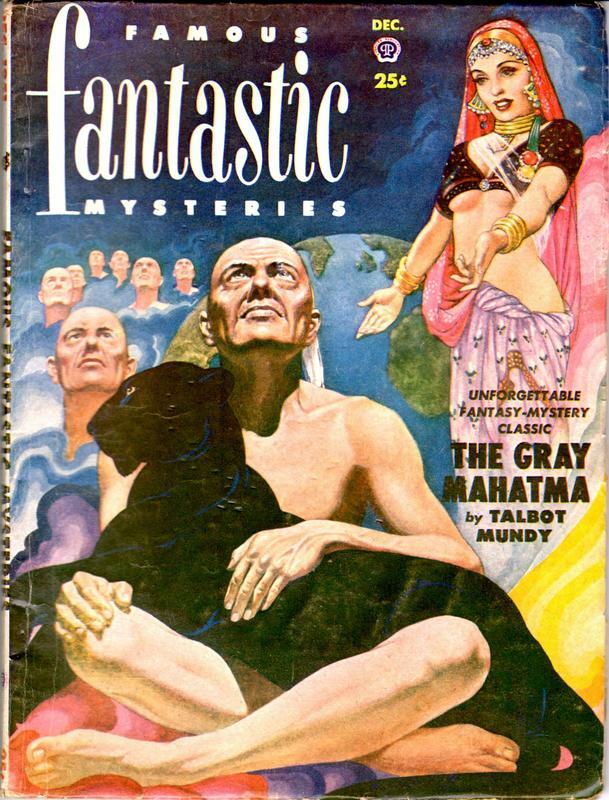 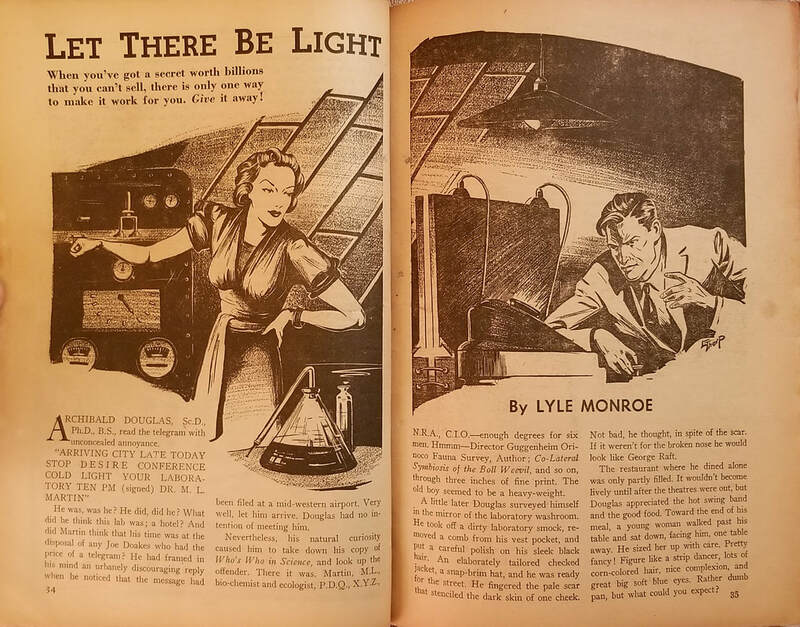 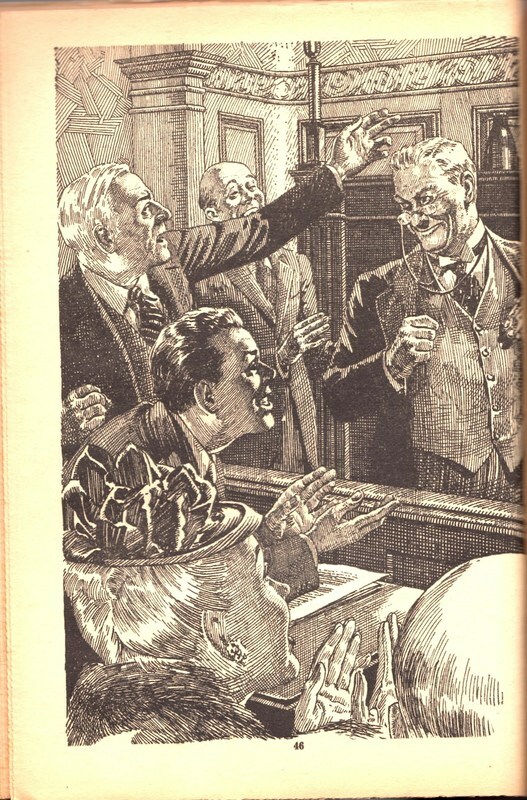 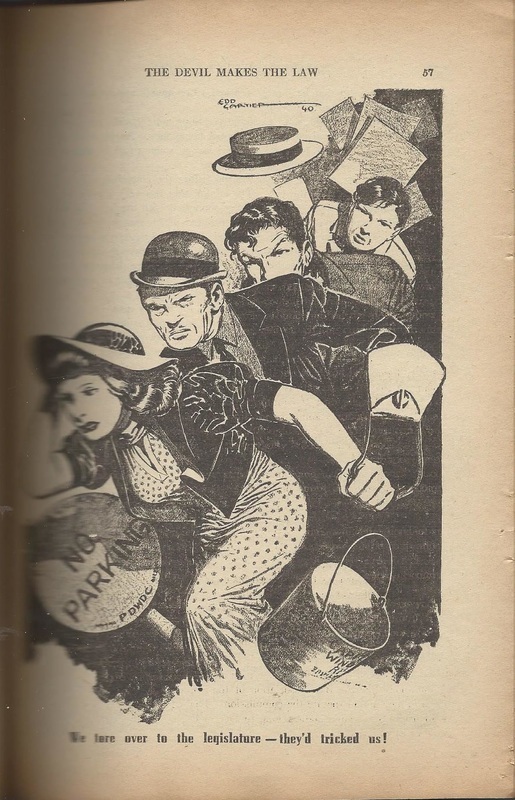 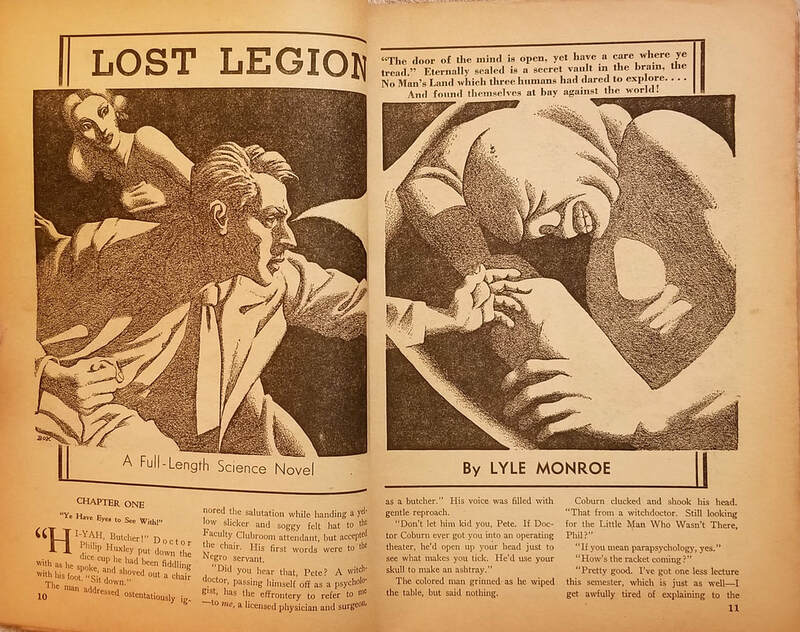 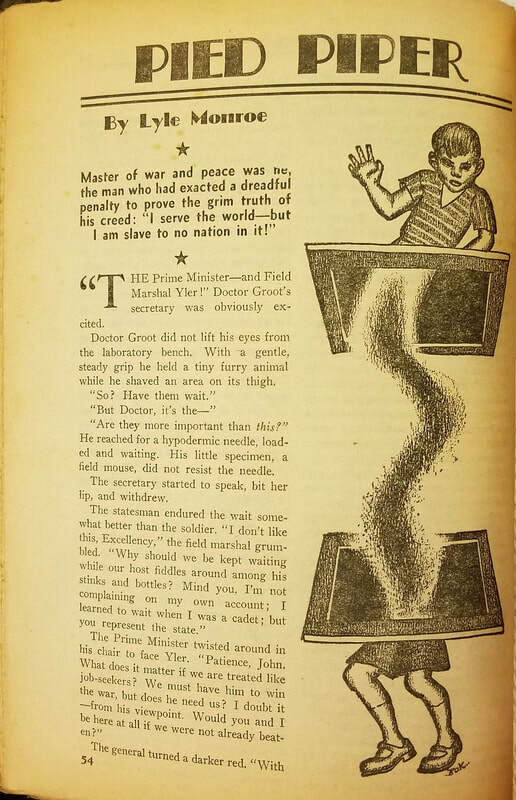 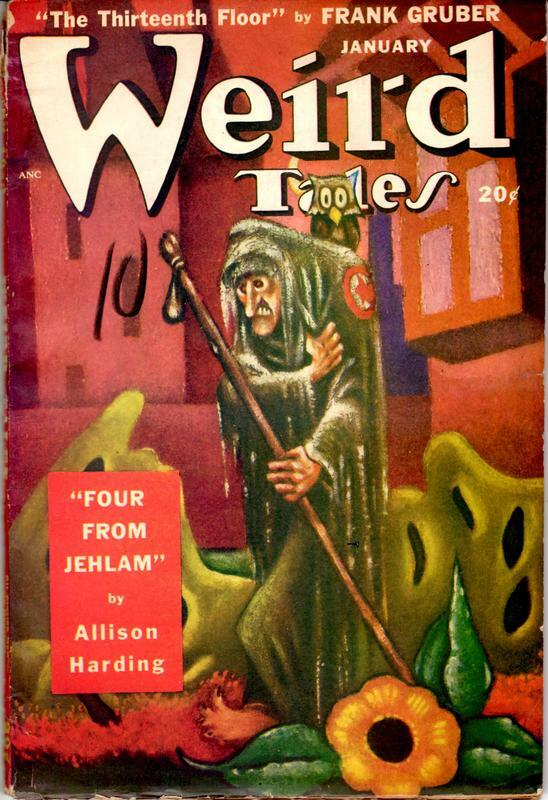 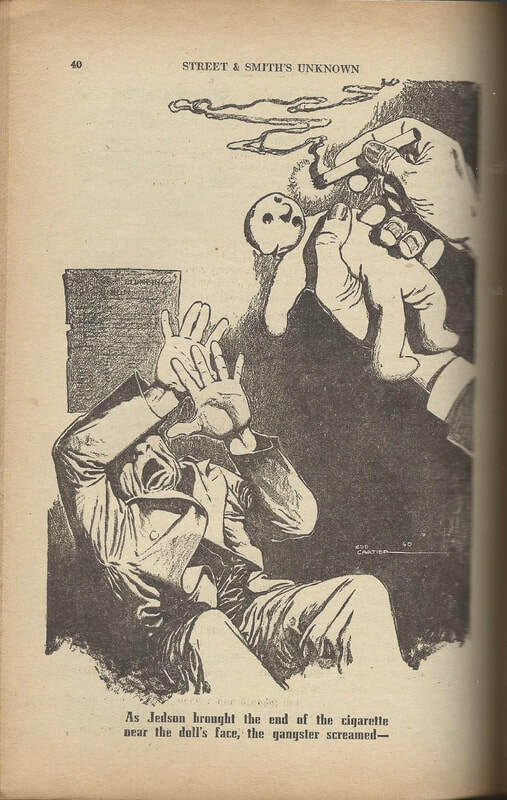 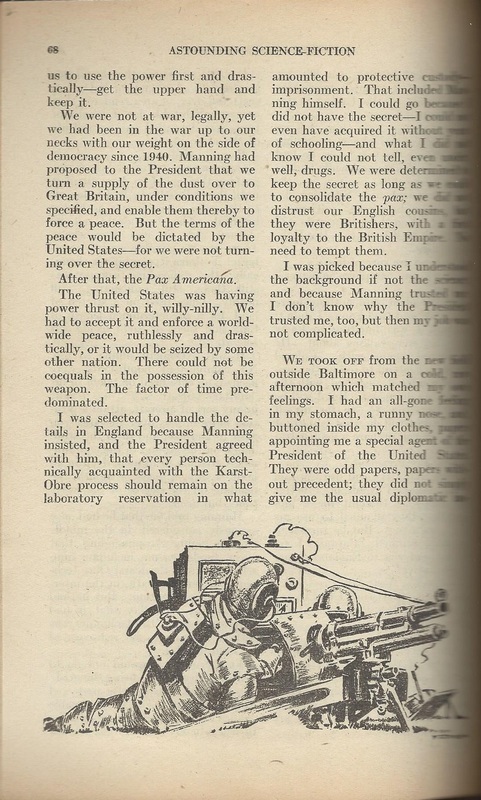 The pulp magazines of the 1930s and 1940s are a time machine to a colorful past-future of exuberance and, in some respects, innocence. 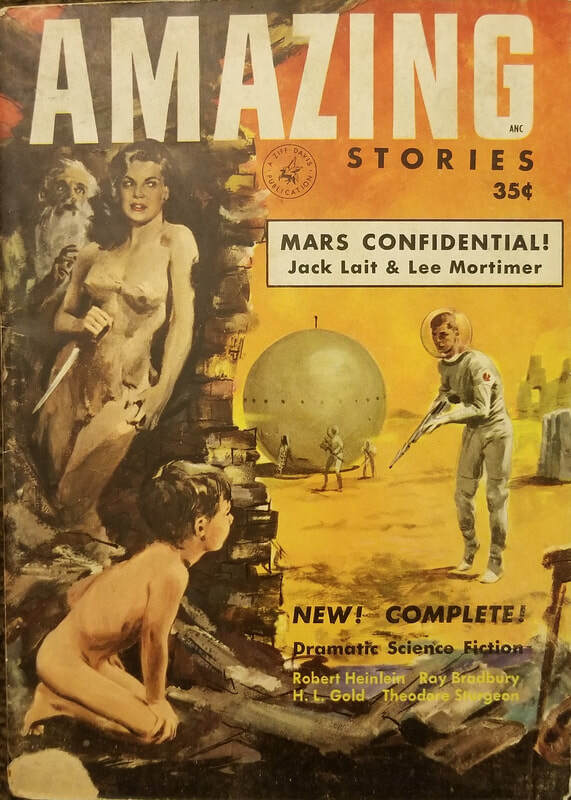 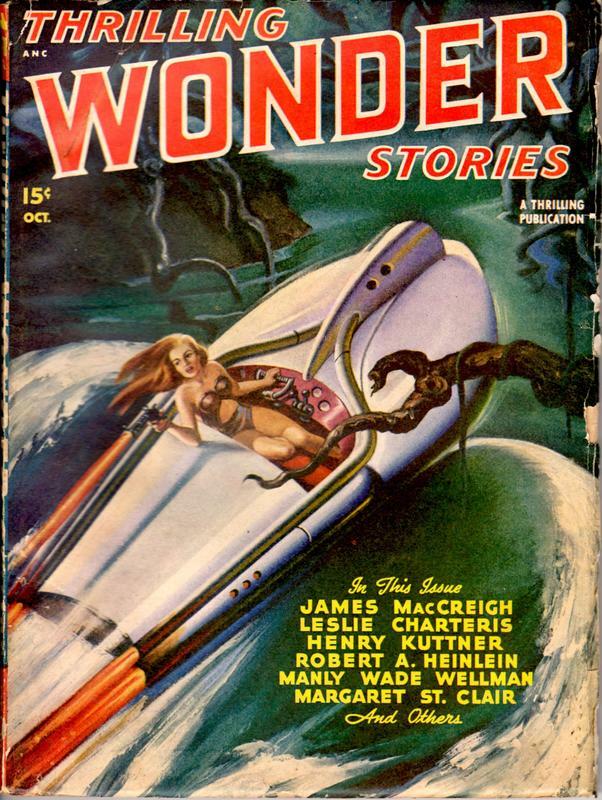 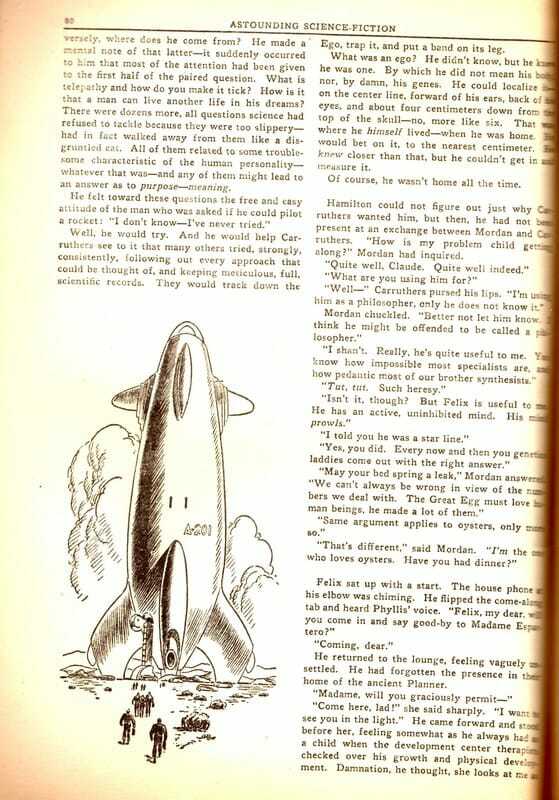 This is the era of Percival Lowell’s canal-girded Mars and of a cloud-shrouded Venus of swamp and jungle, visited by streamlined rocket ships carrying strong-jawed spacemen and, occasionally, shapely spacewomen in semi-transparent costumes. 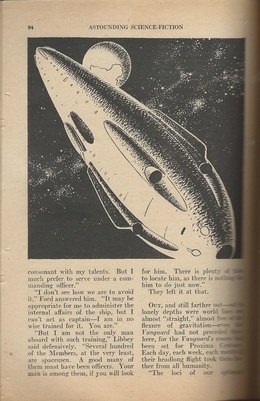 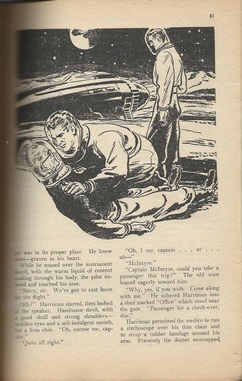 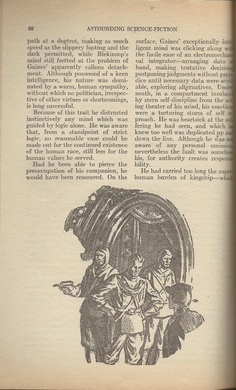 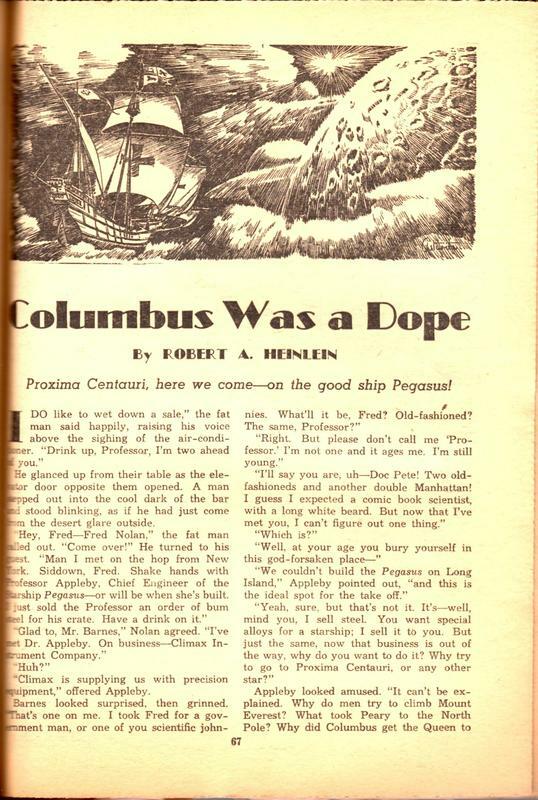 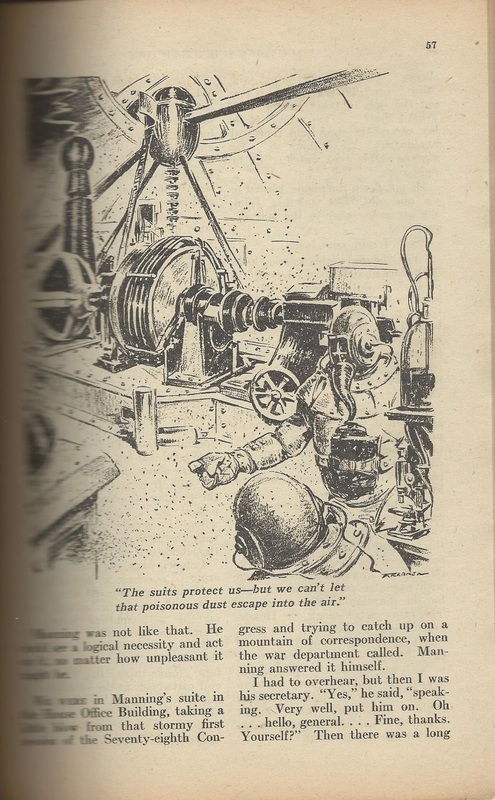 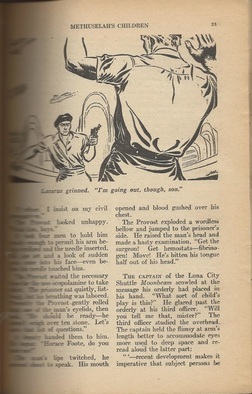 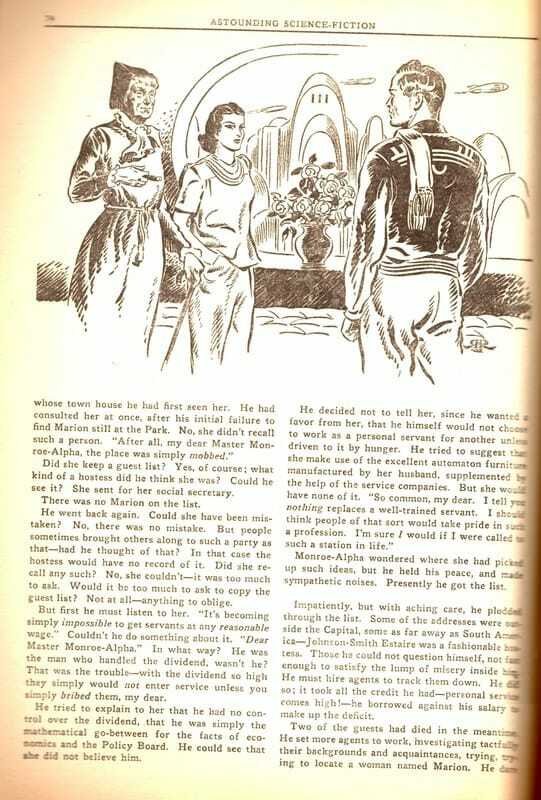 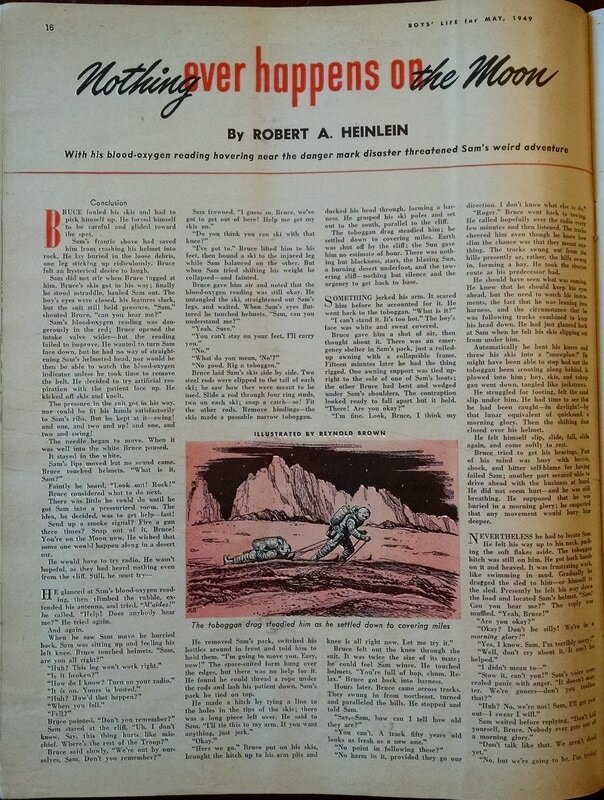 Of course, Heinlein’s works, it should be noted, are never simple space opera or cowboys-and-Indians in space. 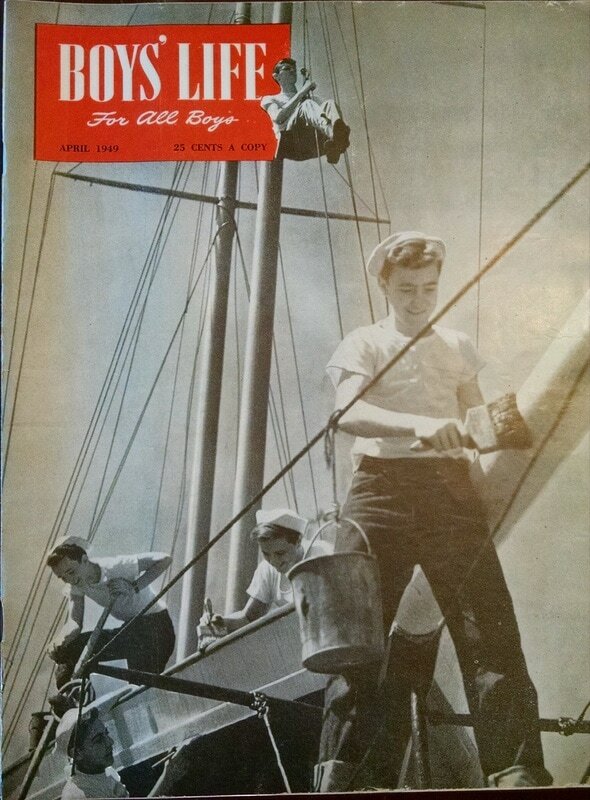 Back then, these magazines cost only a quarter. 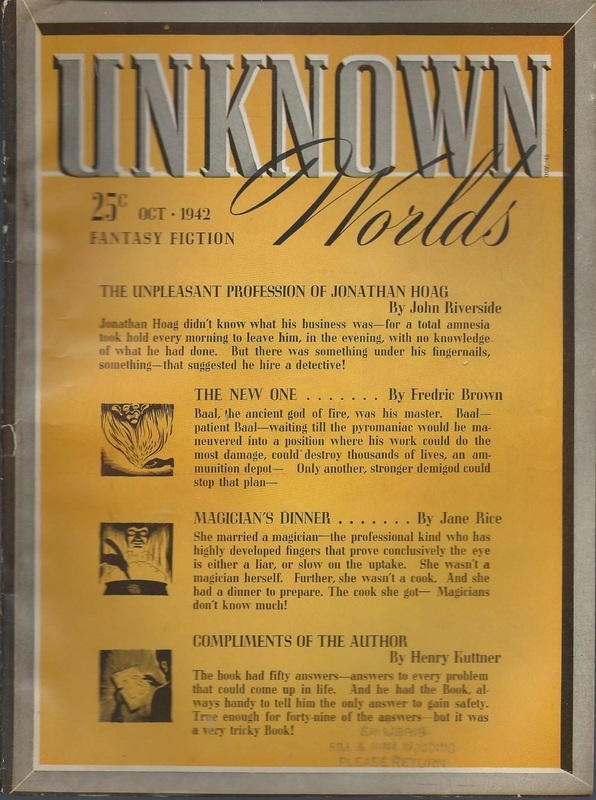 Nowadays, if you can get one for a hundred times that—if you even happen to stumble across one of these rare old babies in a shop somewhere—you’re doing pretty well. 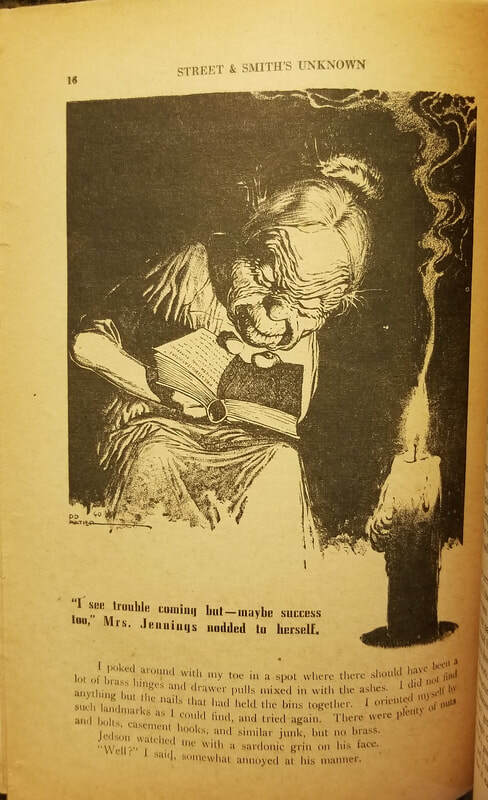 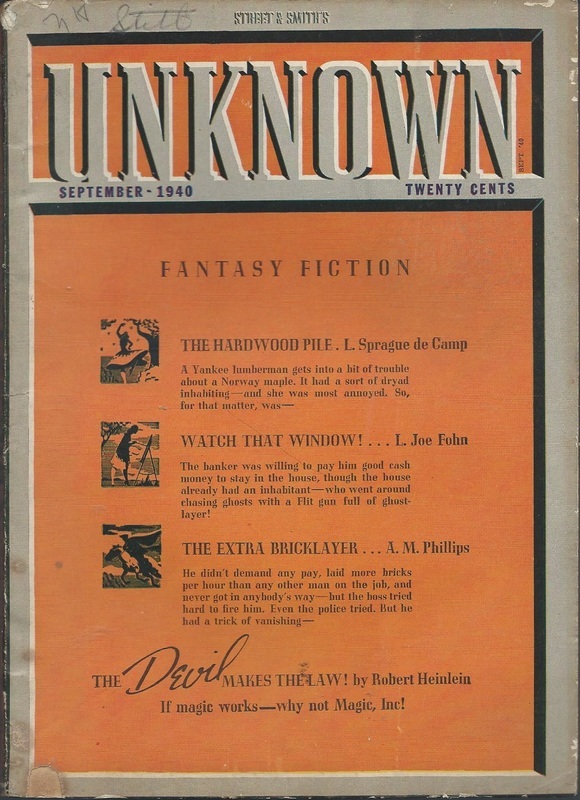 But when you pull such a periodical off the shelf, you are holding a piece of history...and smelling it, too, that soft, evocative scent of paper-fragile years now vanished. 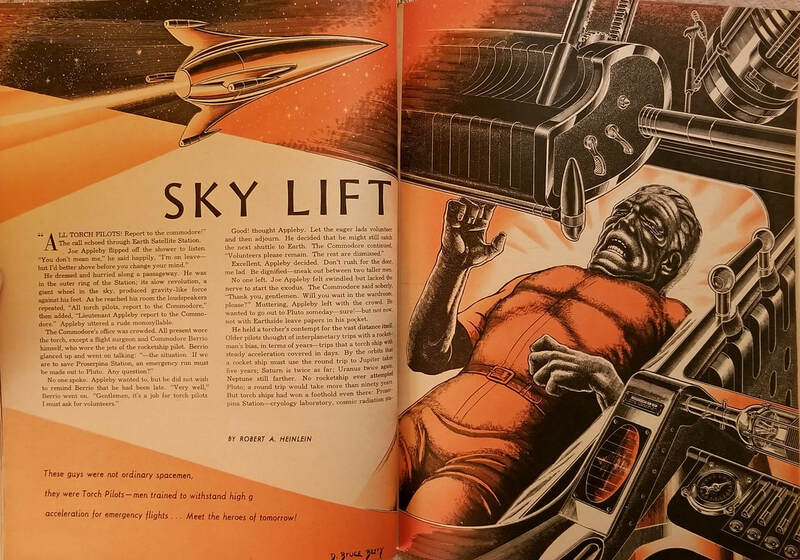 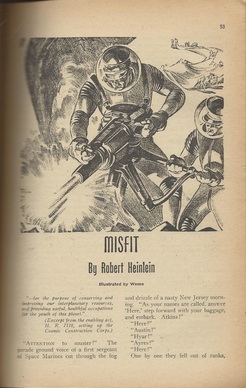 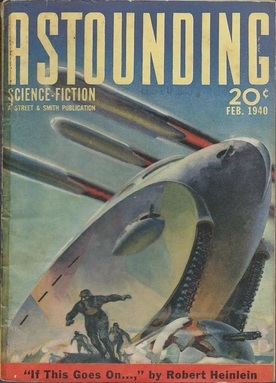 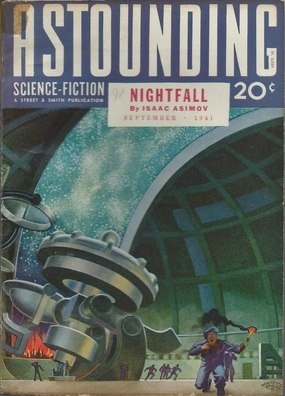 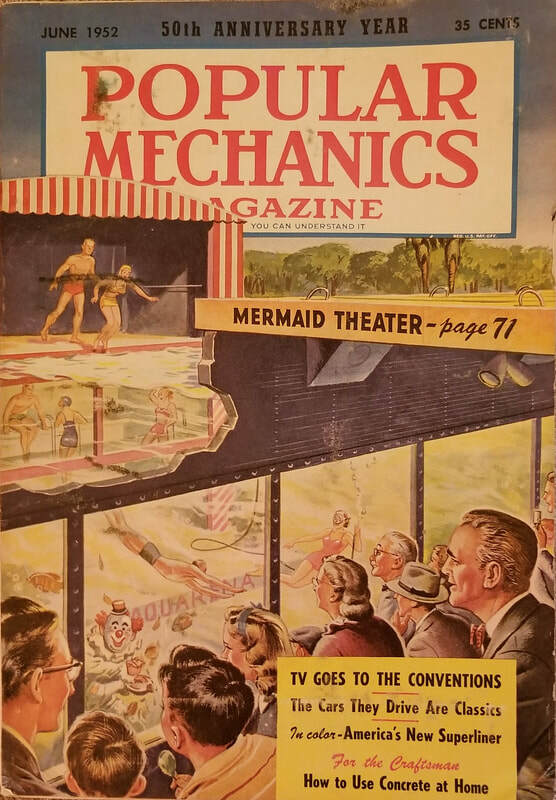 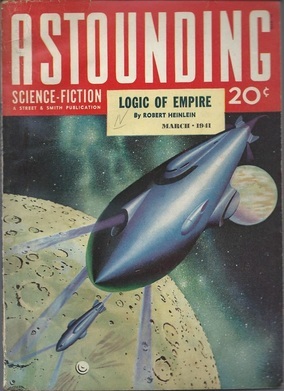 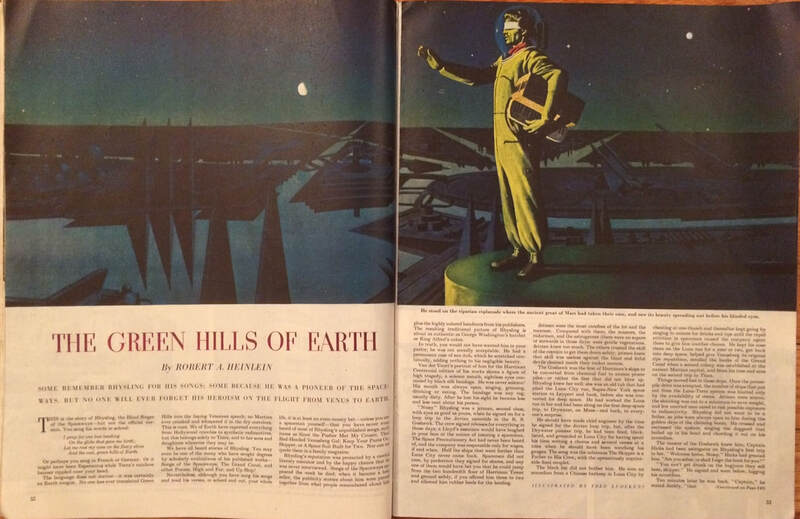 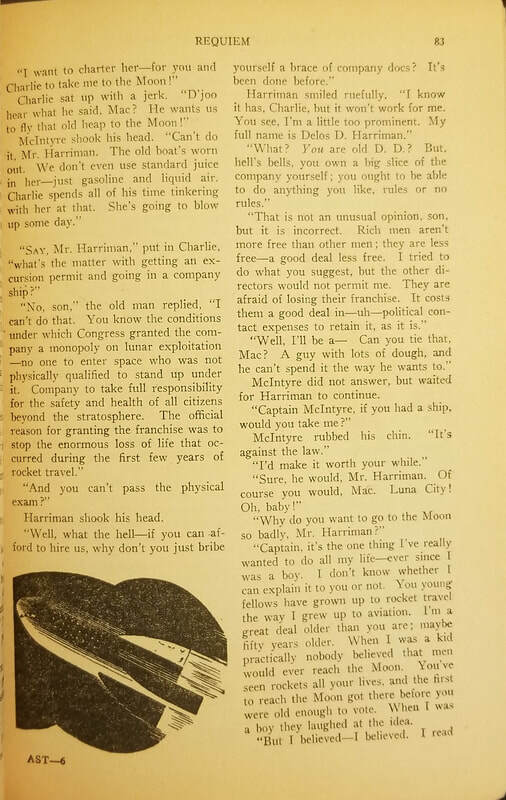 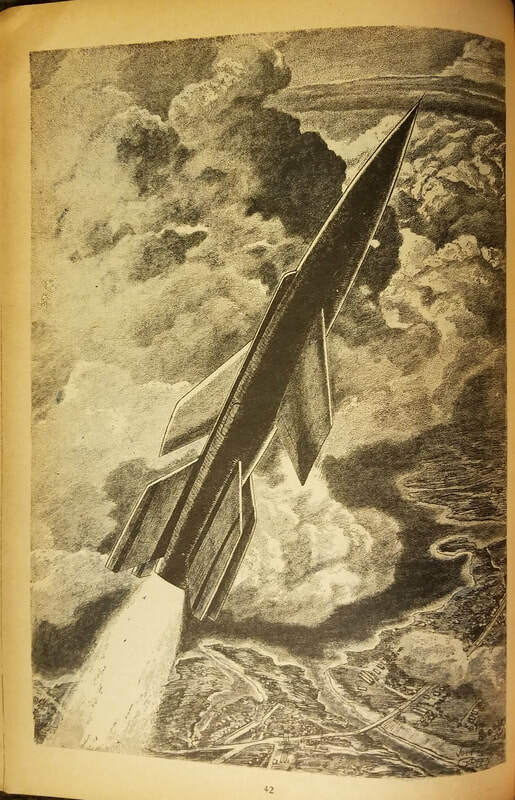 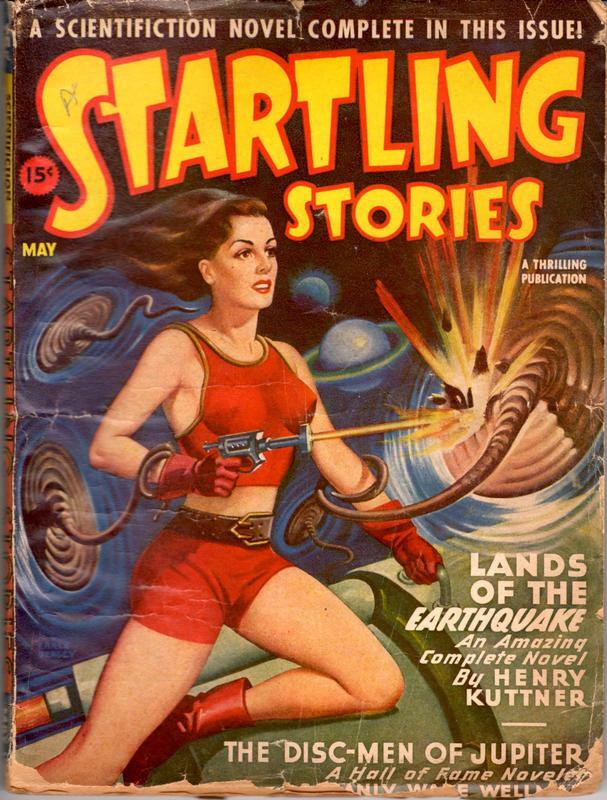 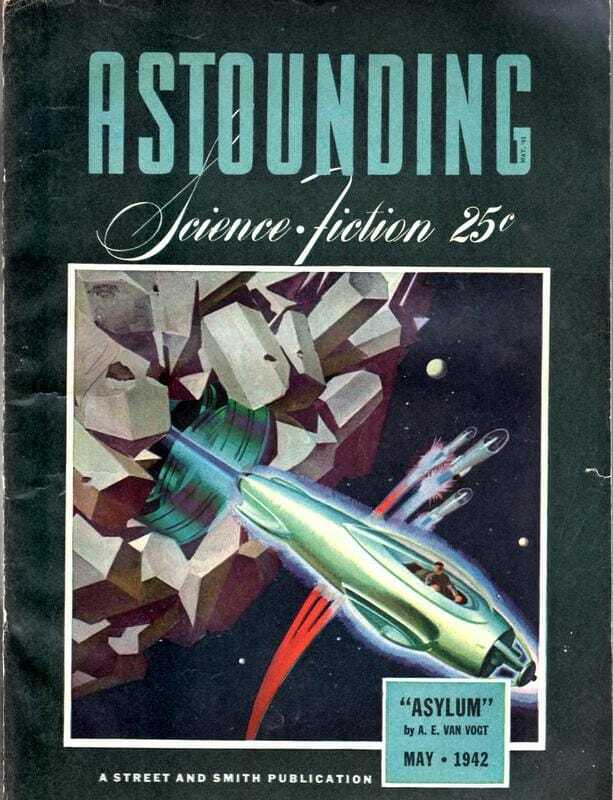 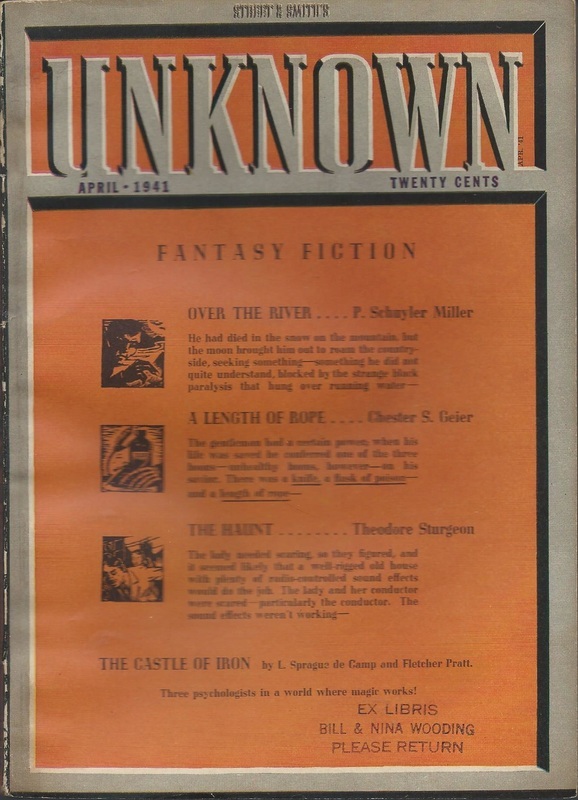 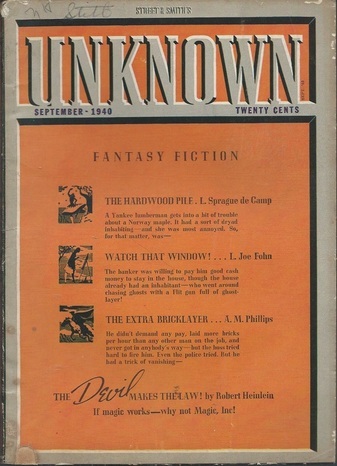 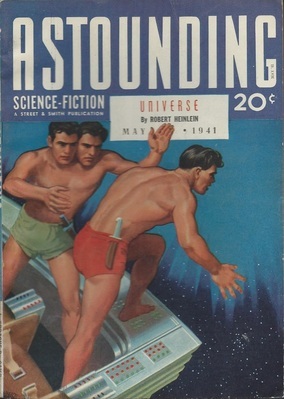 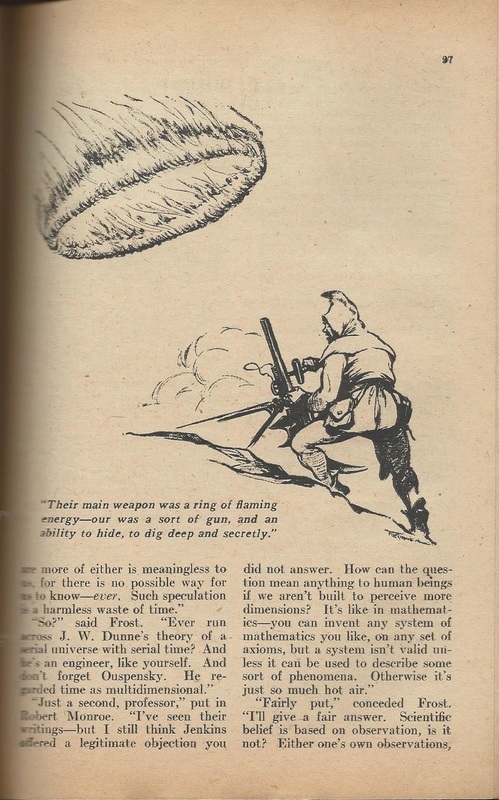 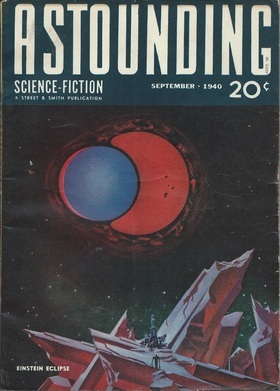 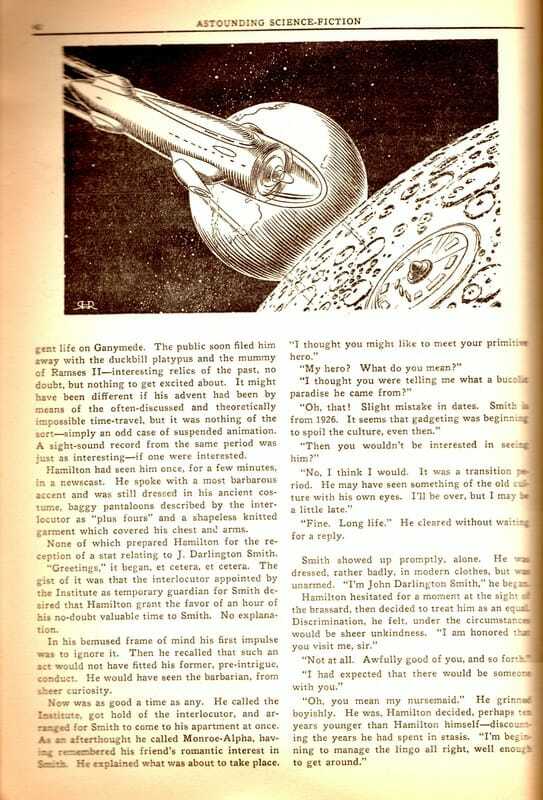 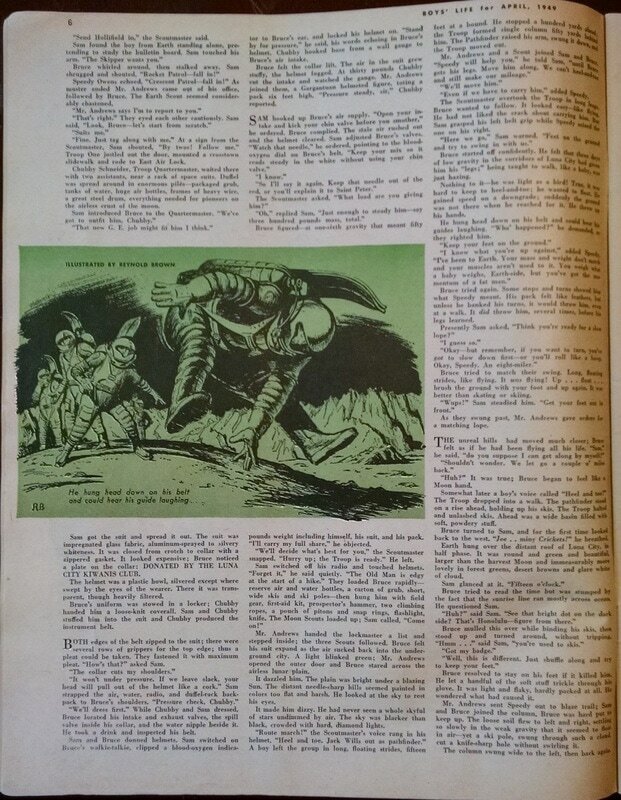 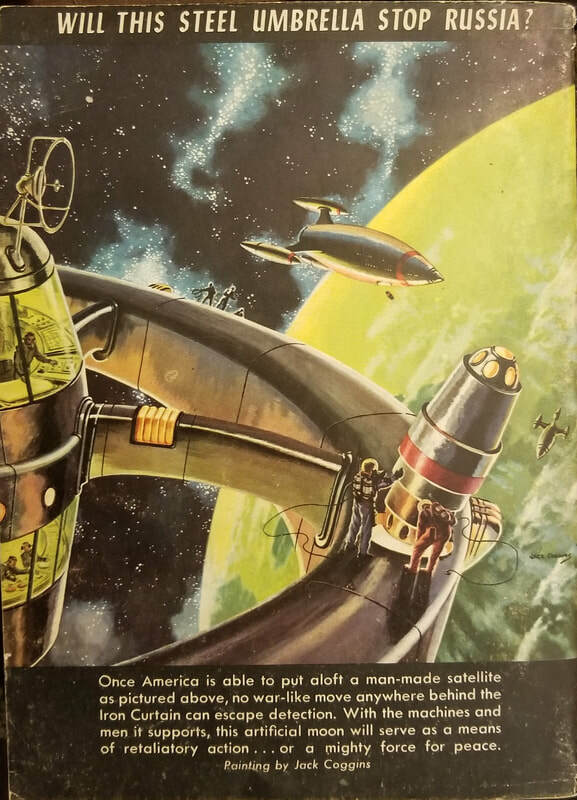 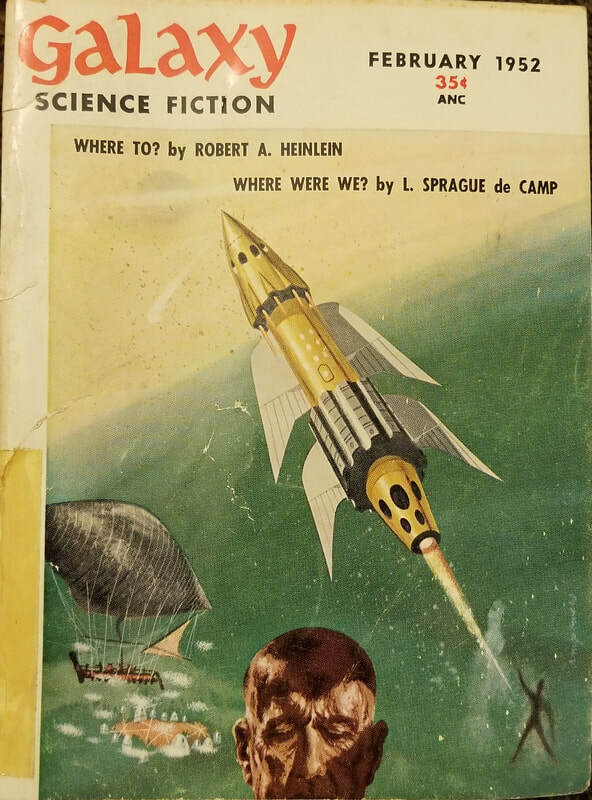 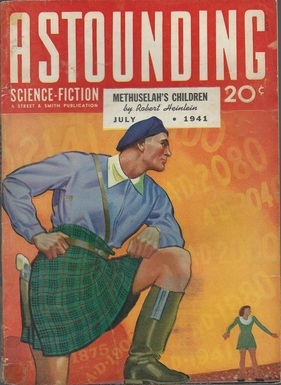 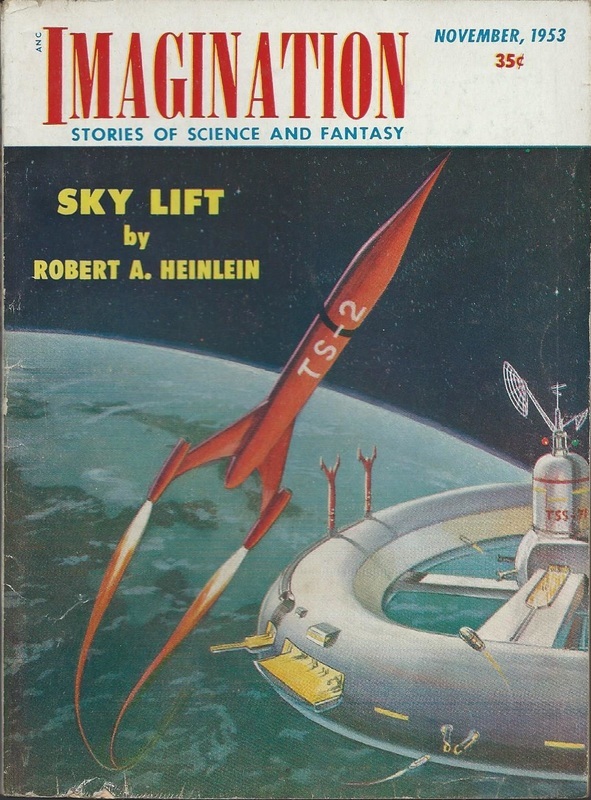 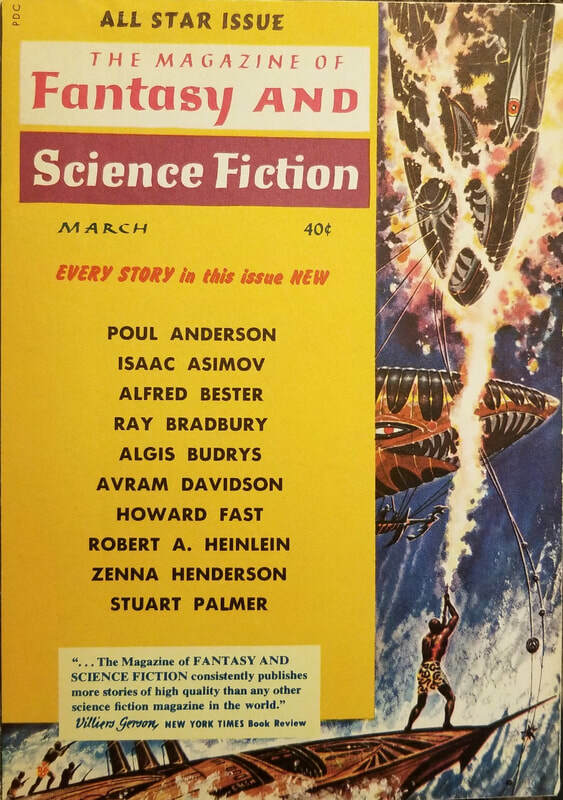 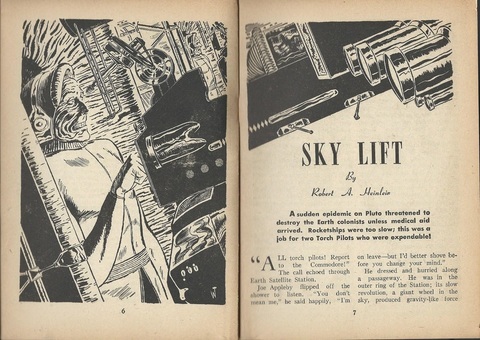 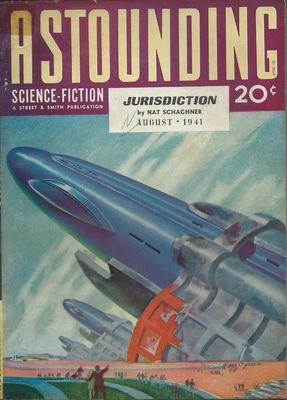 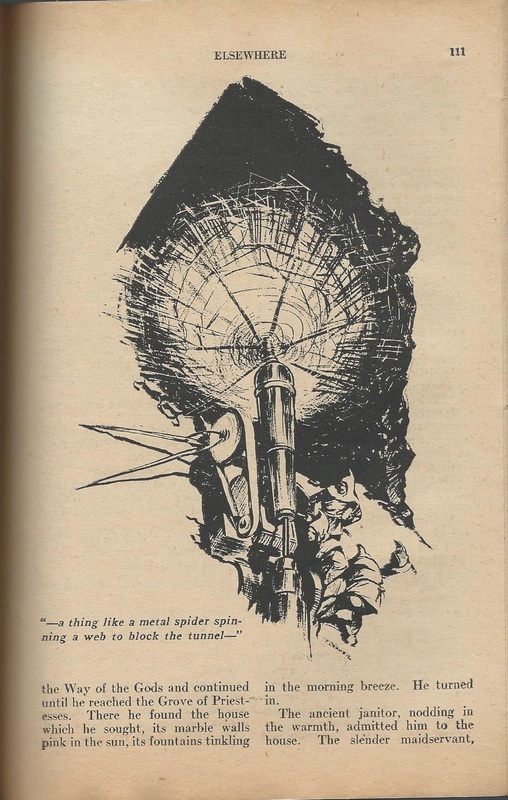 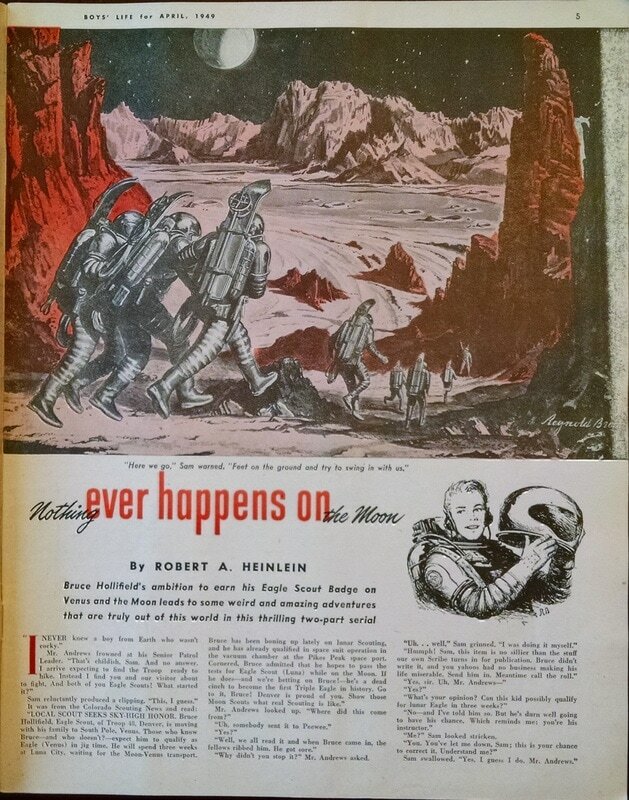 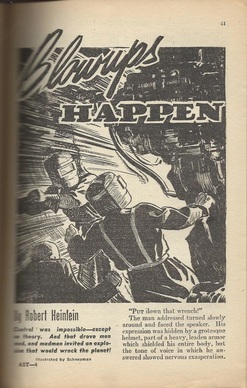 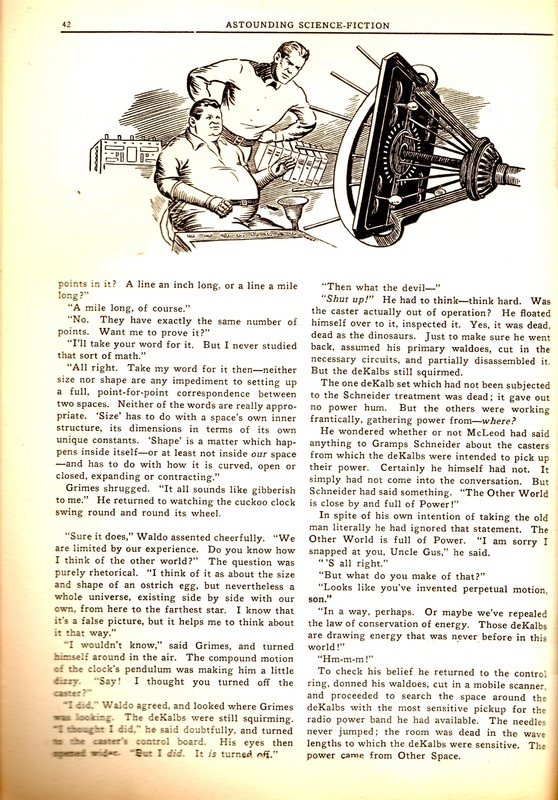 When the magazines below were published, after all, Heinlein was still at the beginning of his career, the outcome of the Second World War was by no means certain, and the first manned space shot was still a quarter-century away. One interesting difference between these magazine covers and those of books, by the way, is that these are beautifully big. 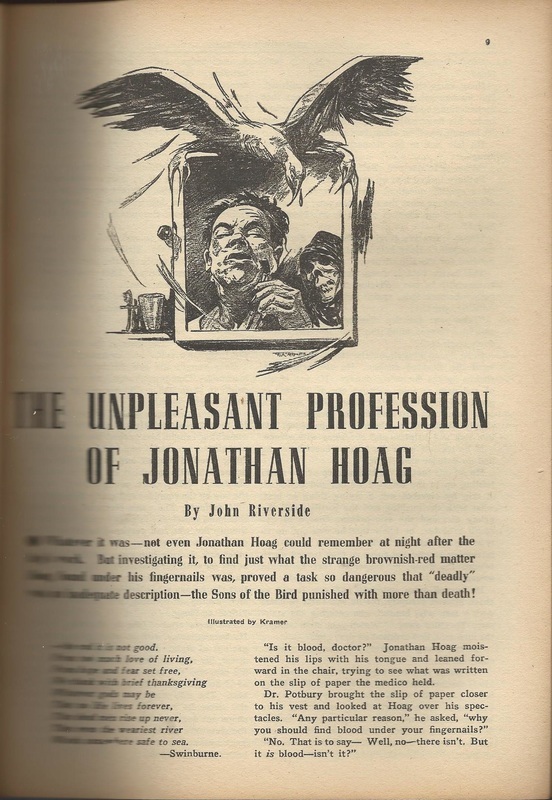 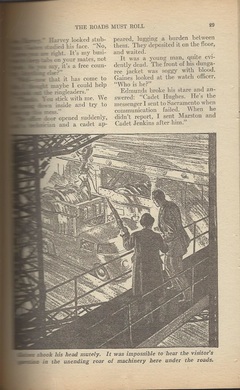 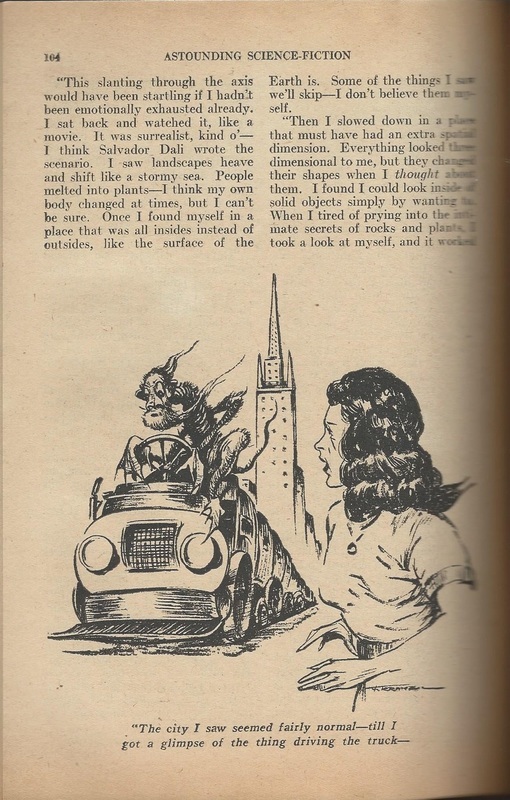 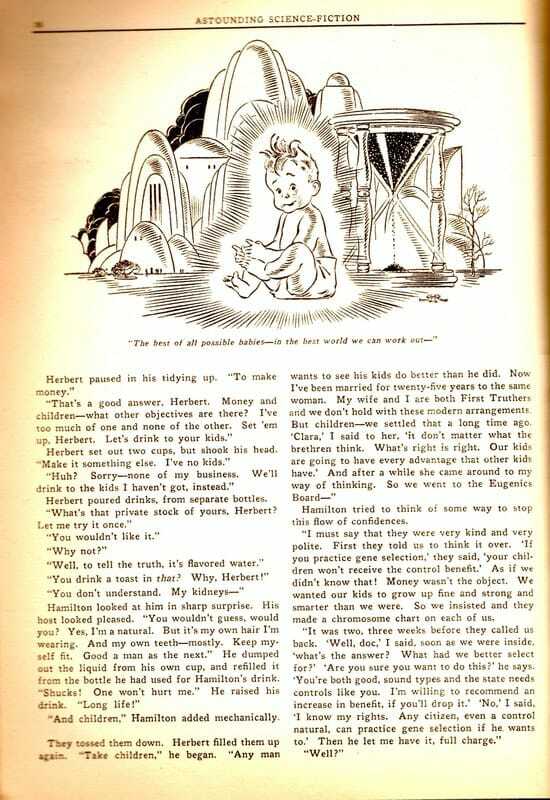 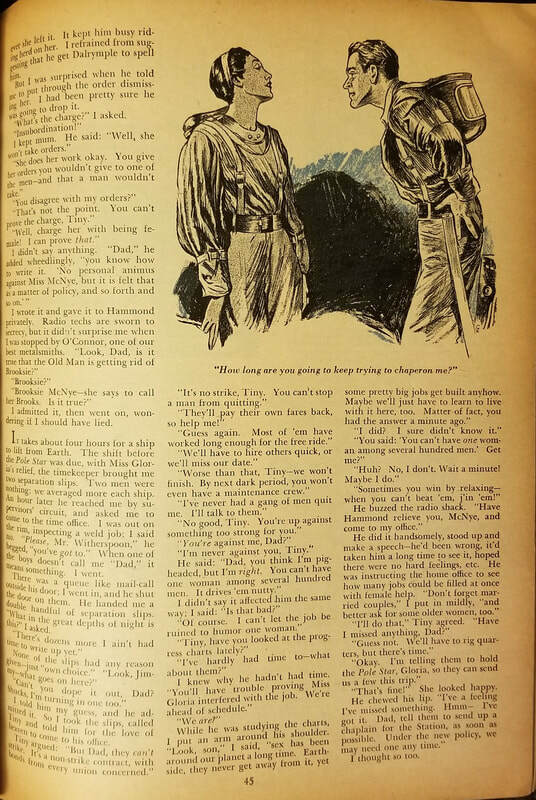 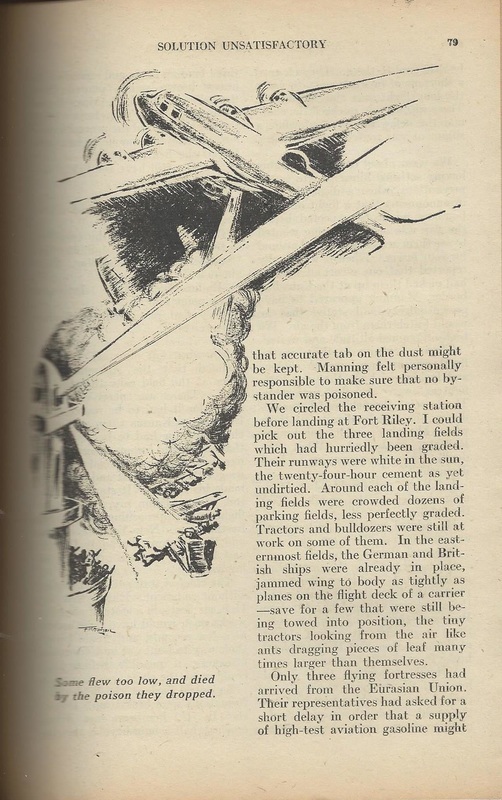 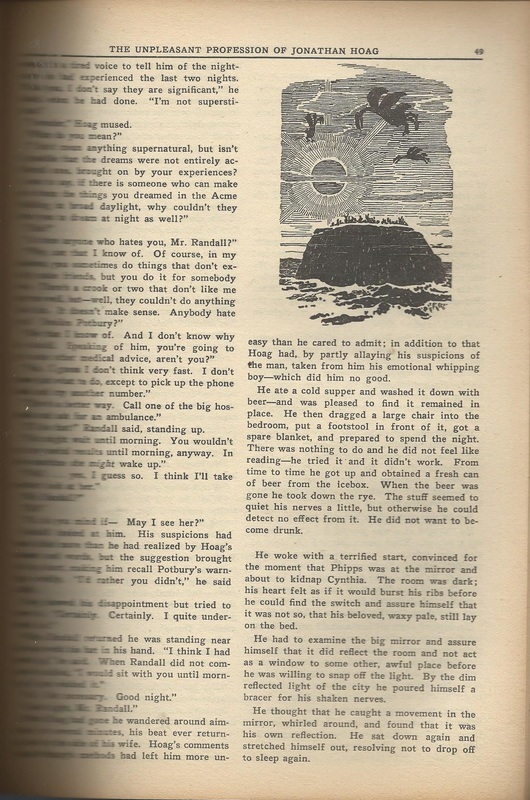 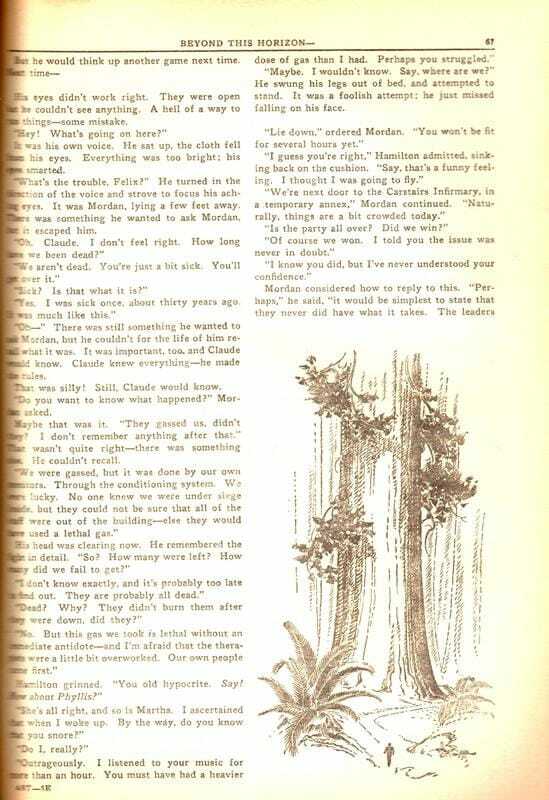 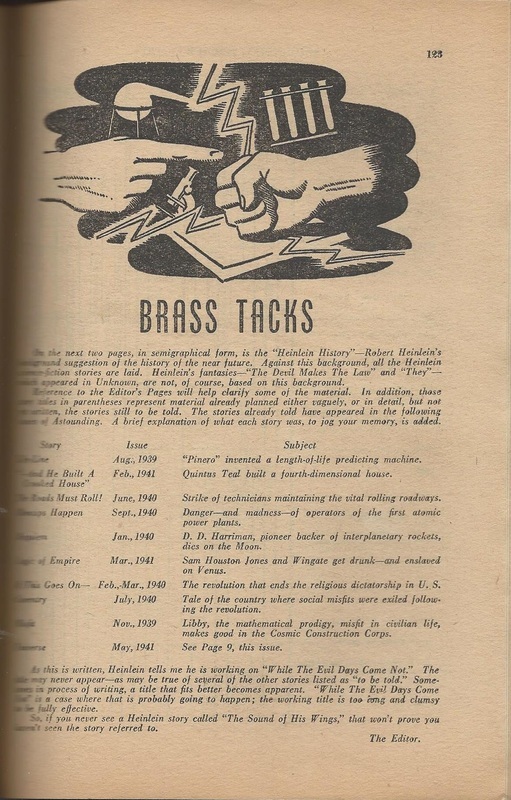 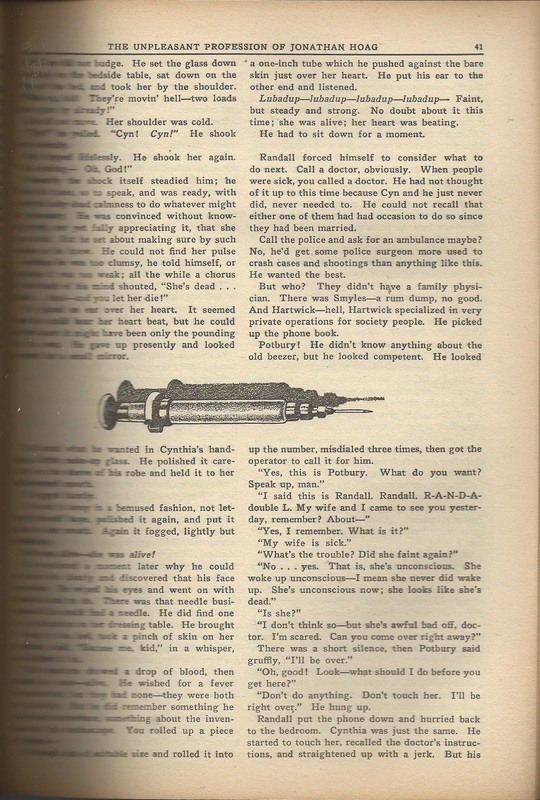 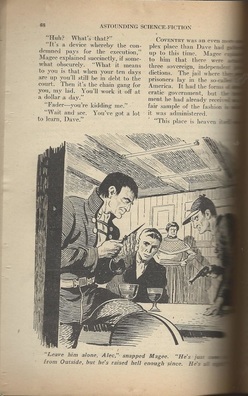 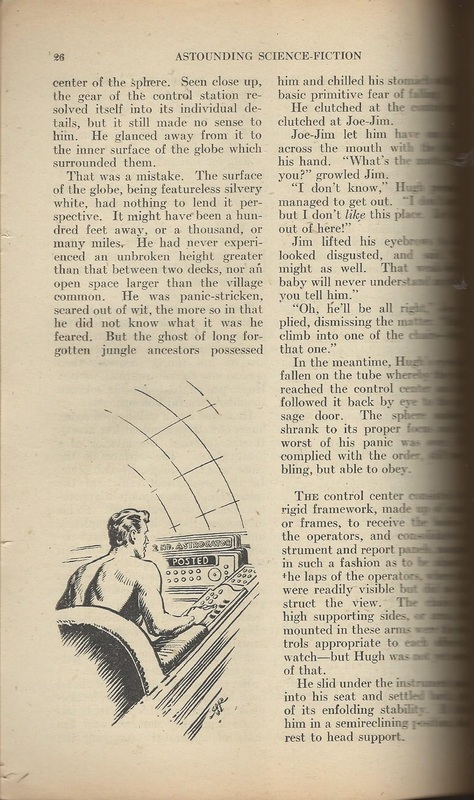 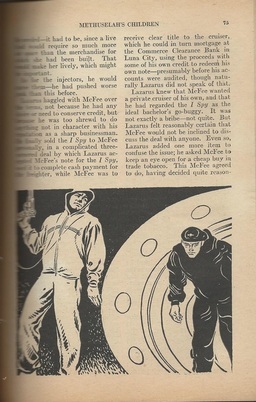 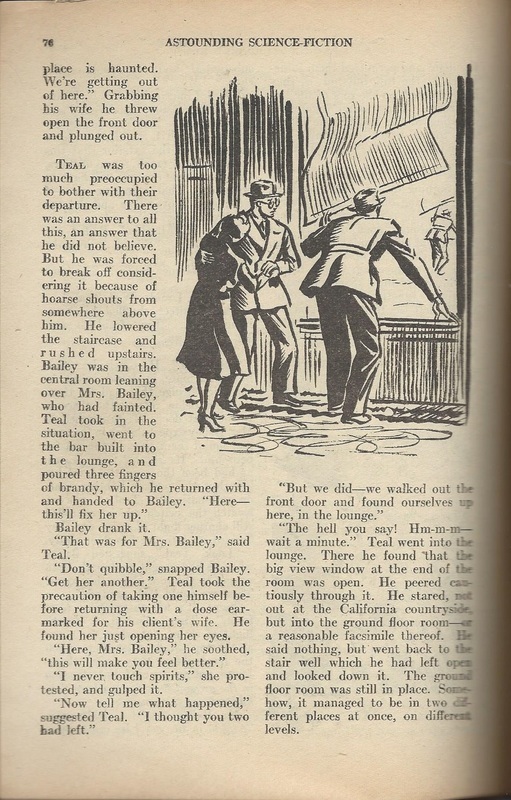 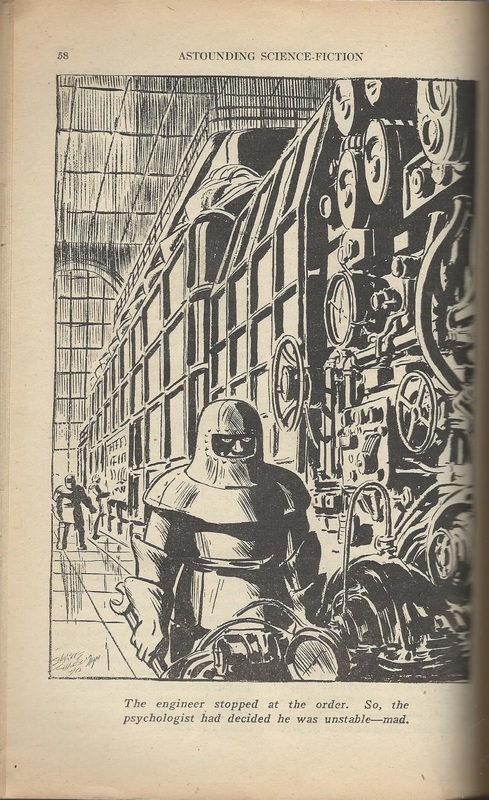 Even a small one, like the Imagination at the bottom of this page or some of the 1950s or 1960s magazines on my “Serializations” page are 7.5 x 5.5 inches, which is noticeably larger than a paperback. 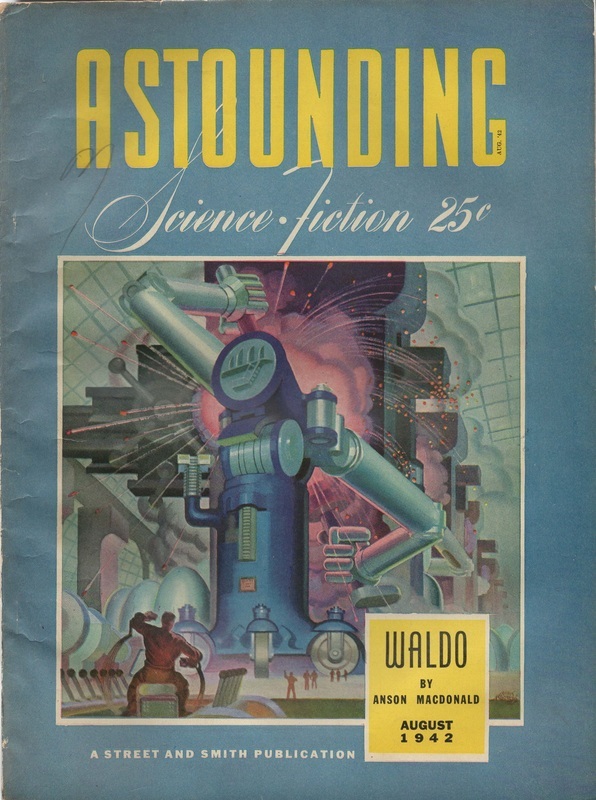 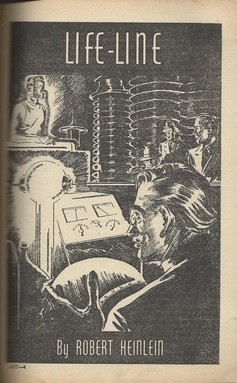 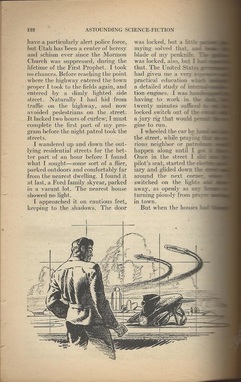 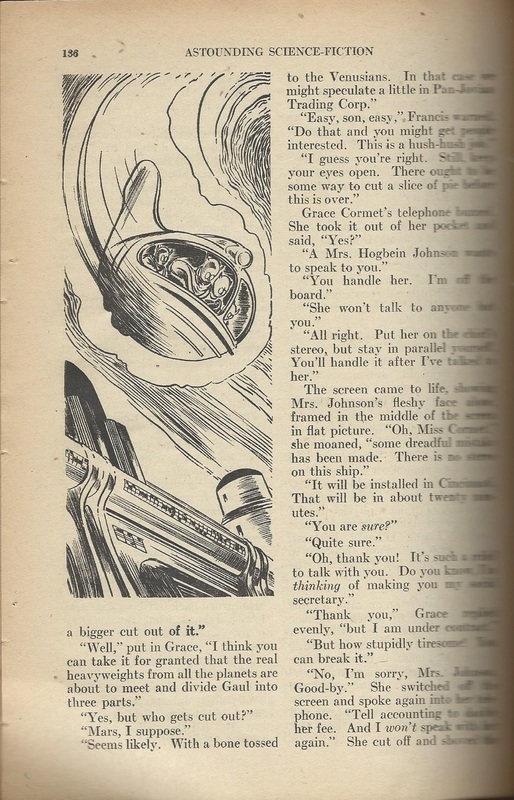 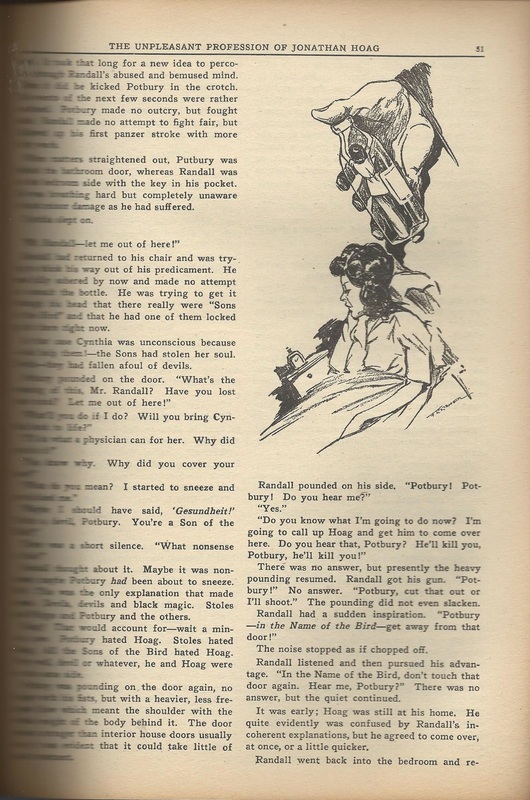 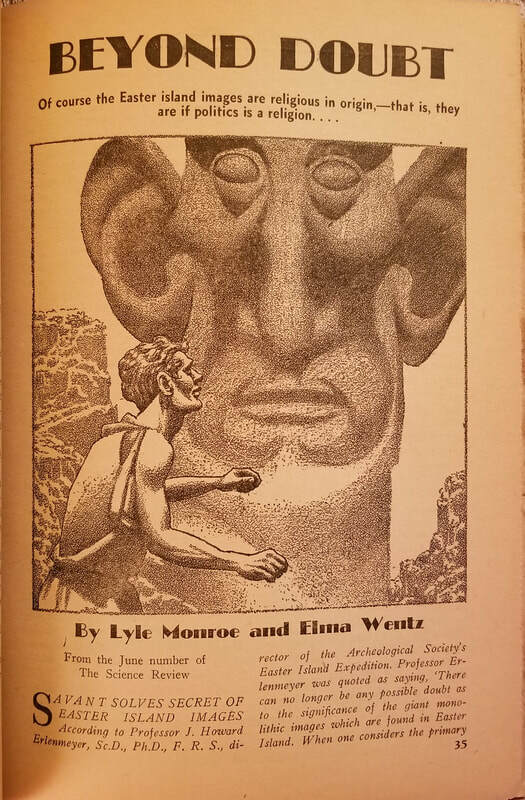 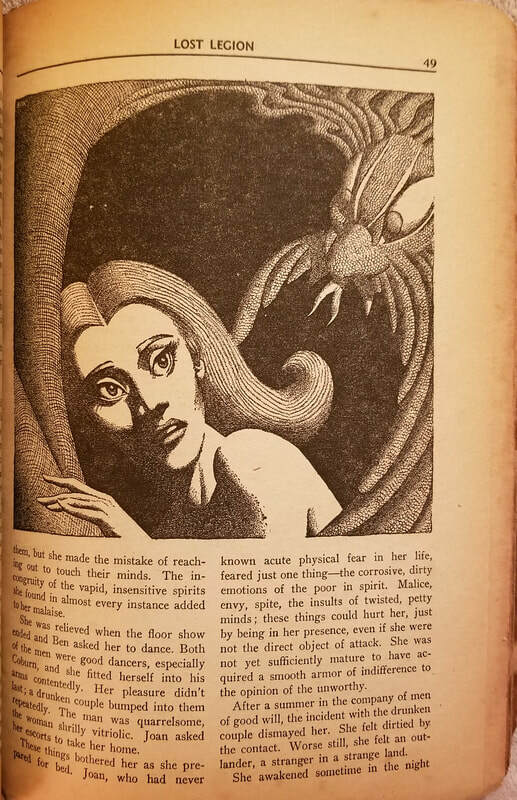 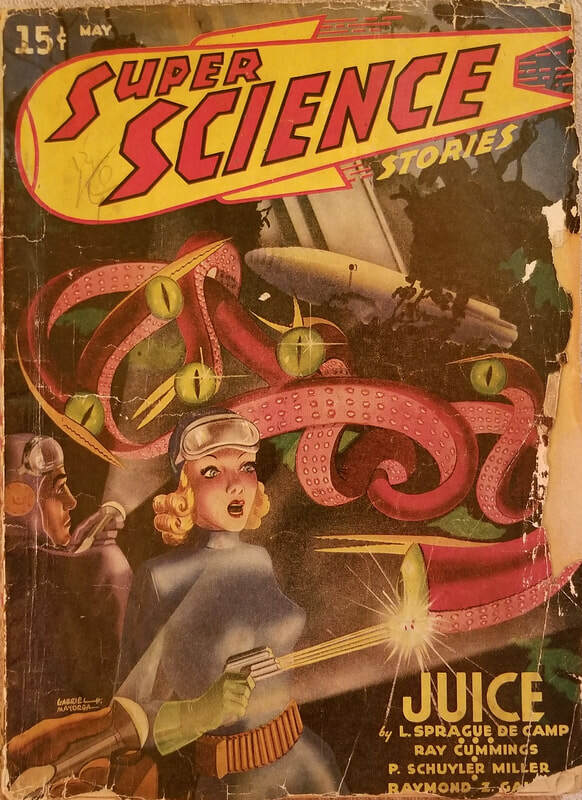 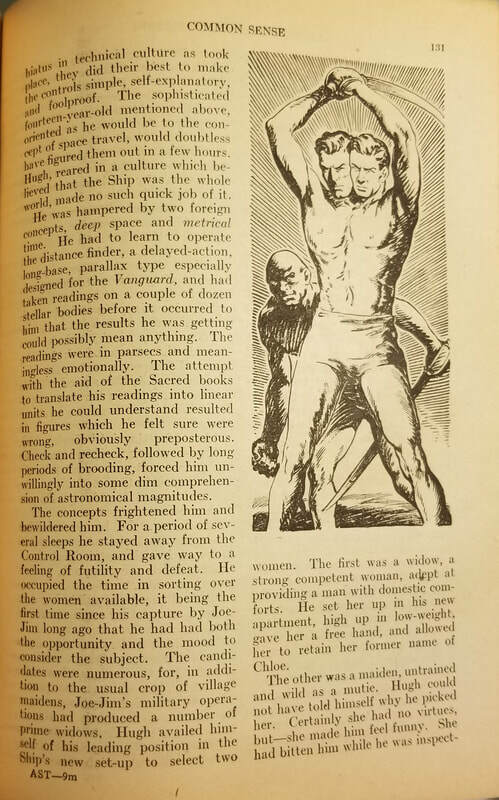 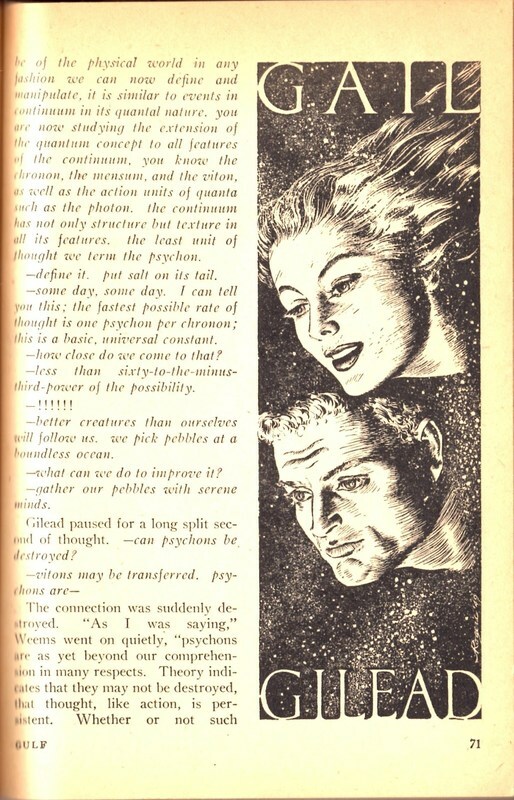 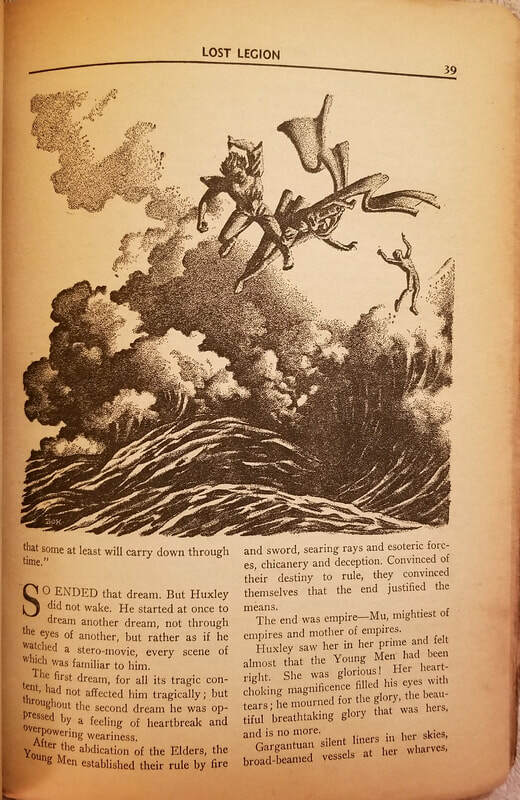 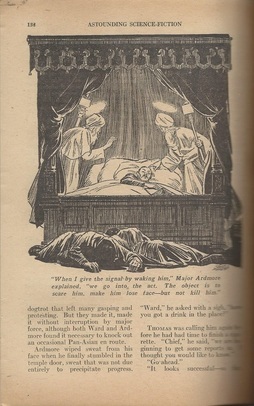 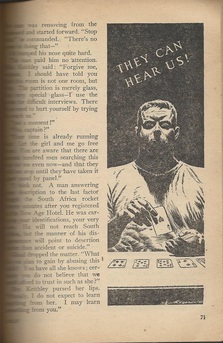 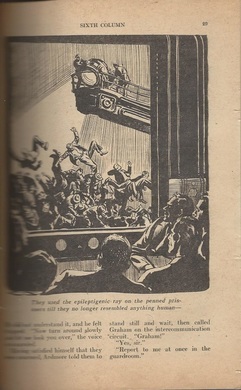 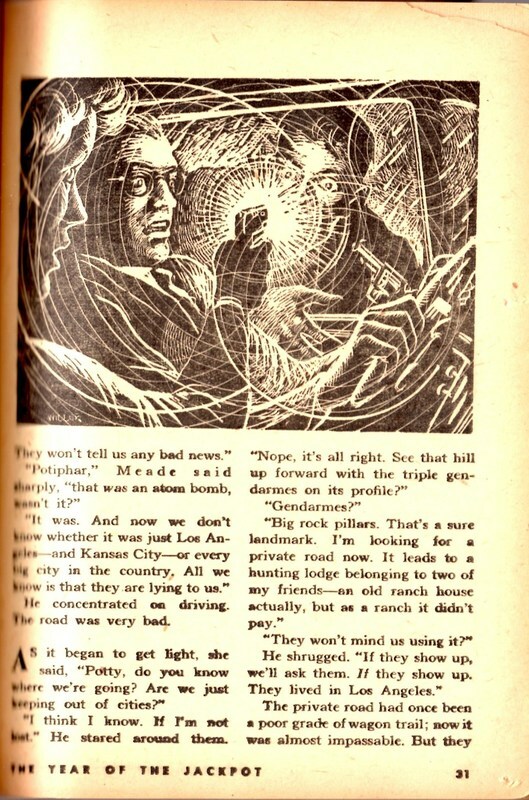 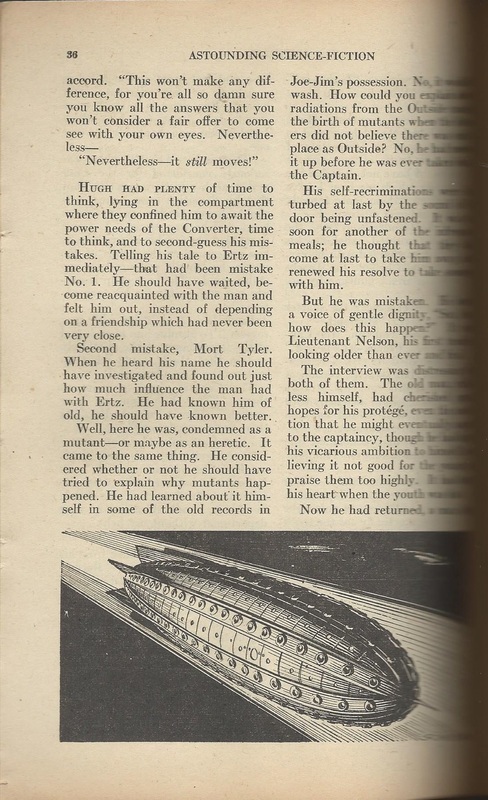 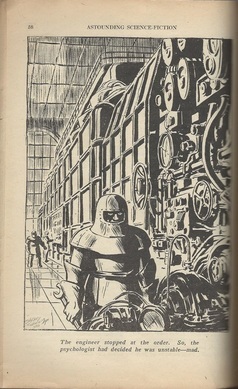 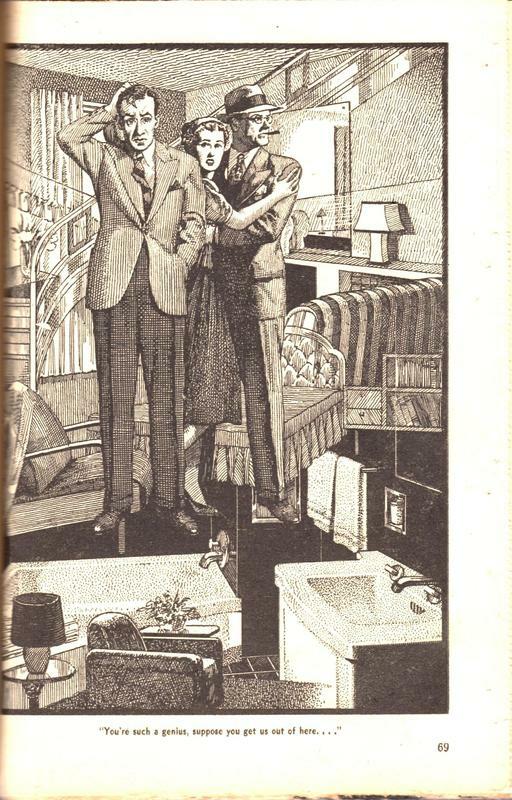 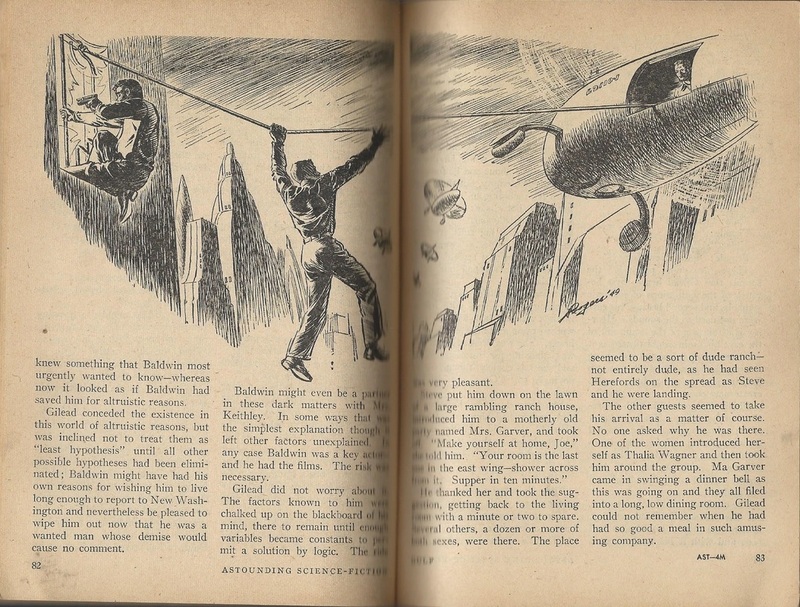 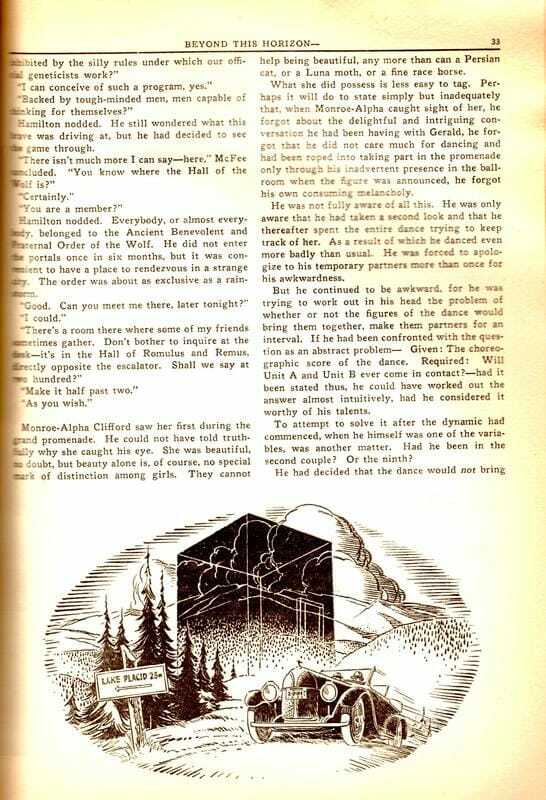 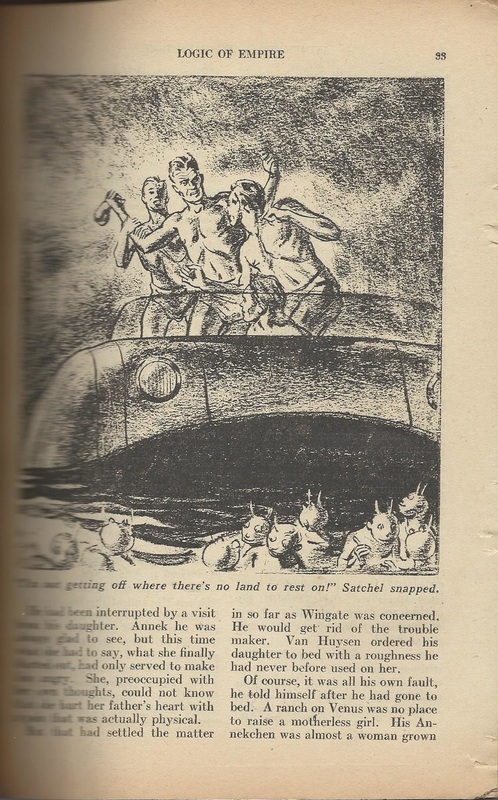 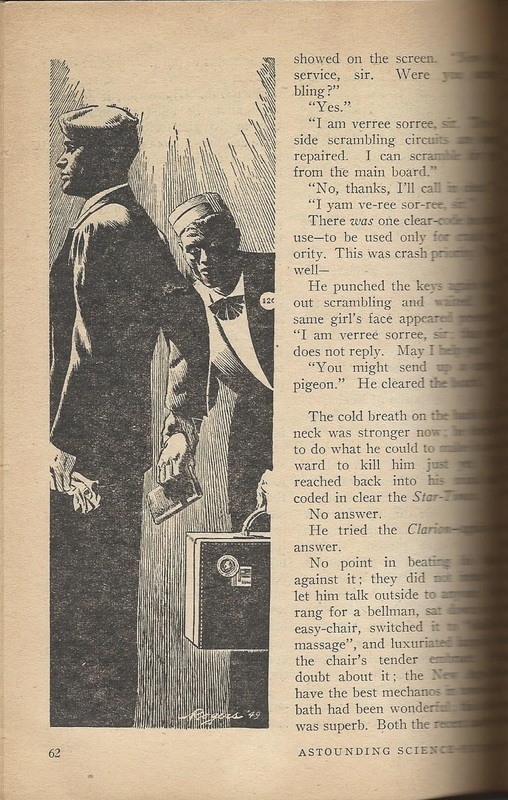 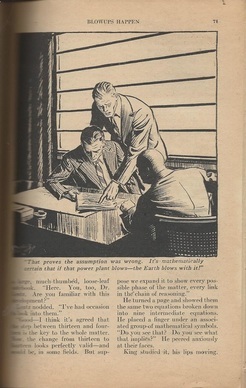 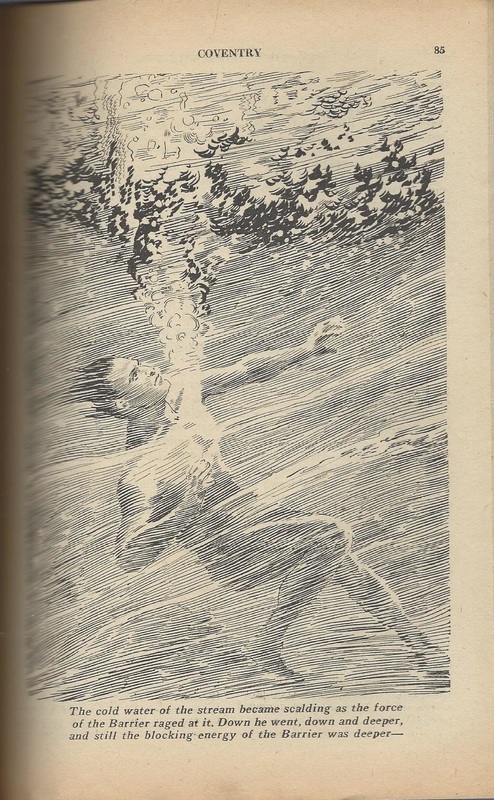 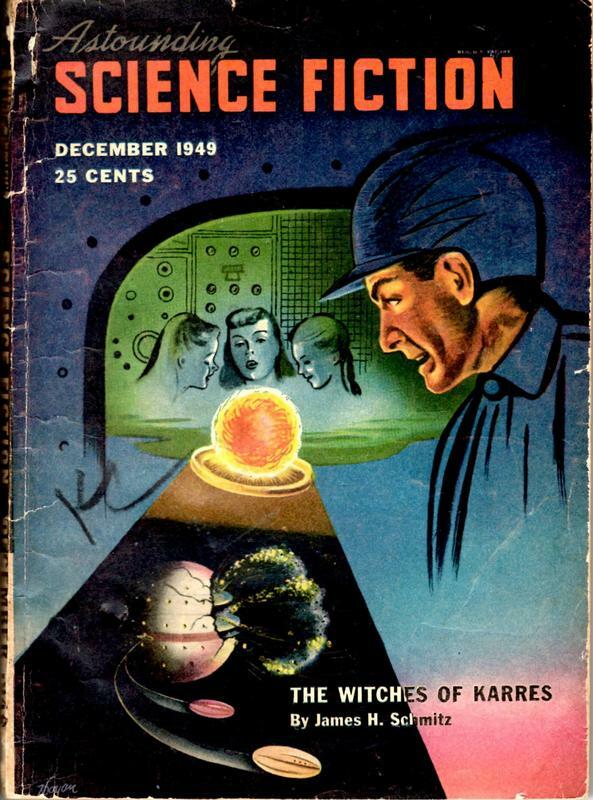 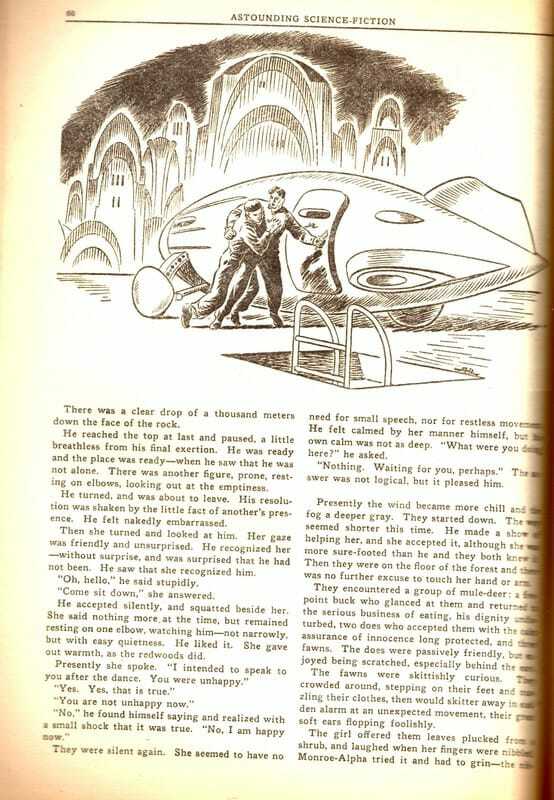 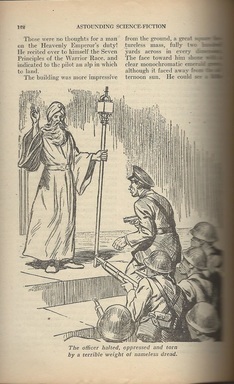 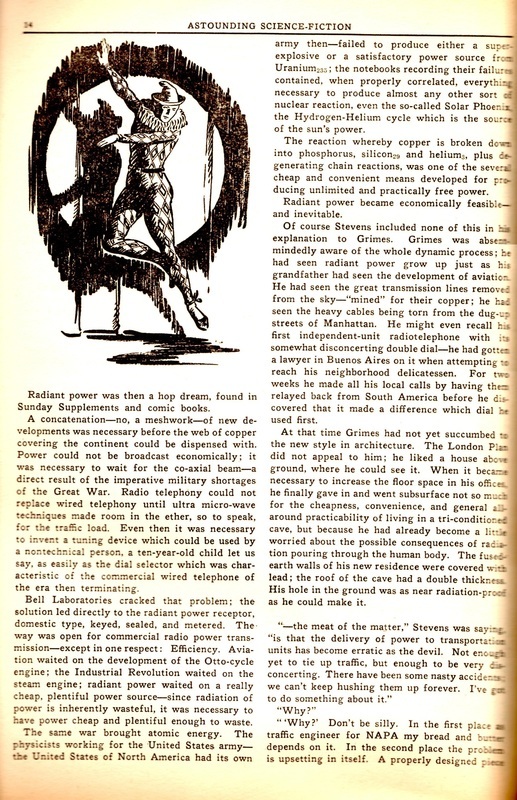 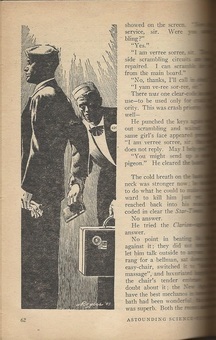 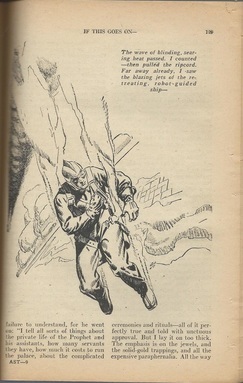 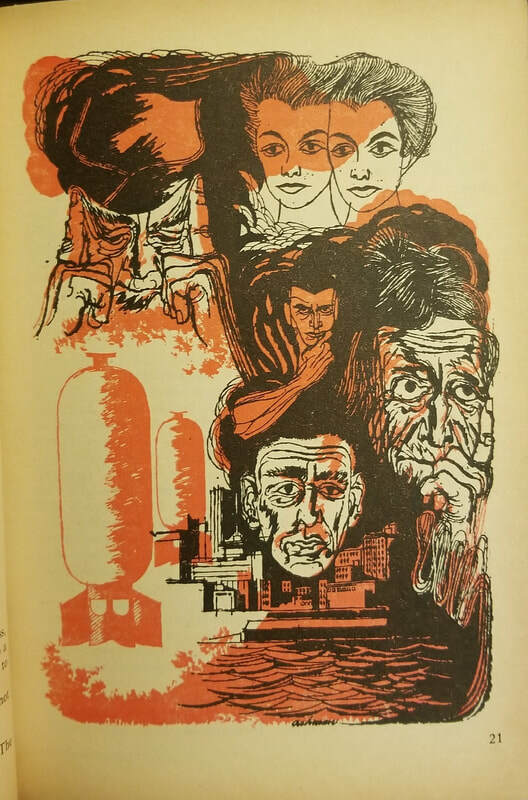 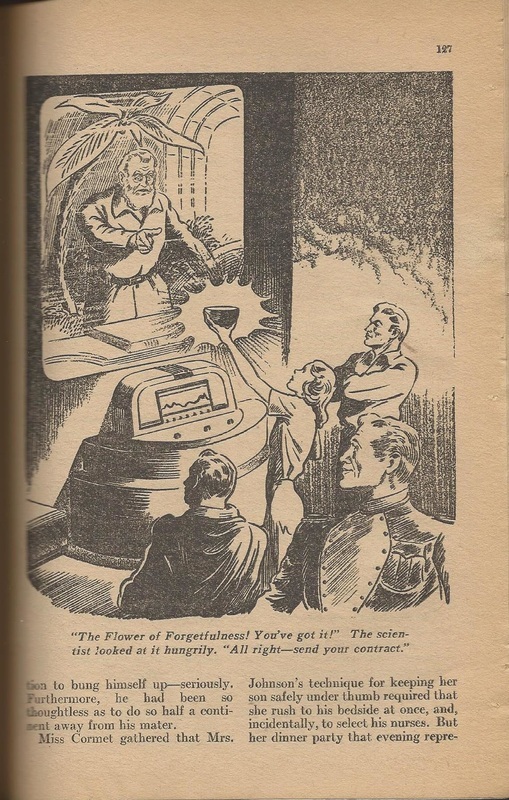 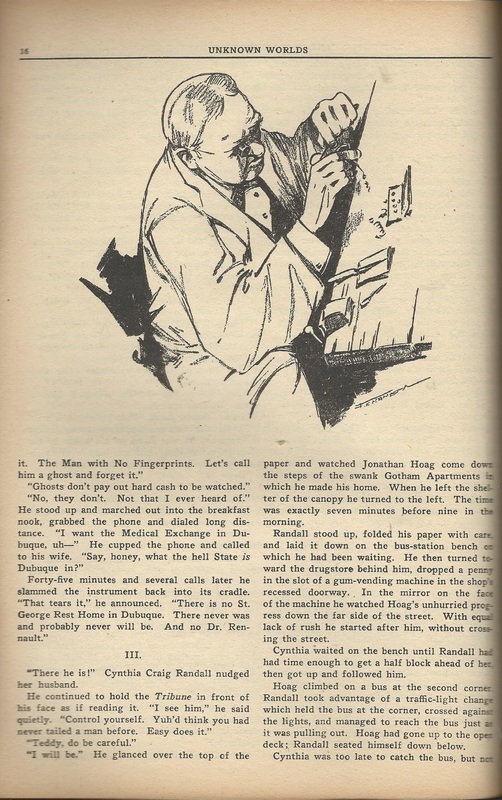 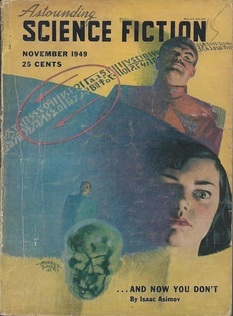 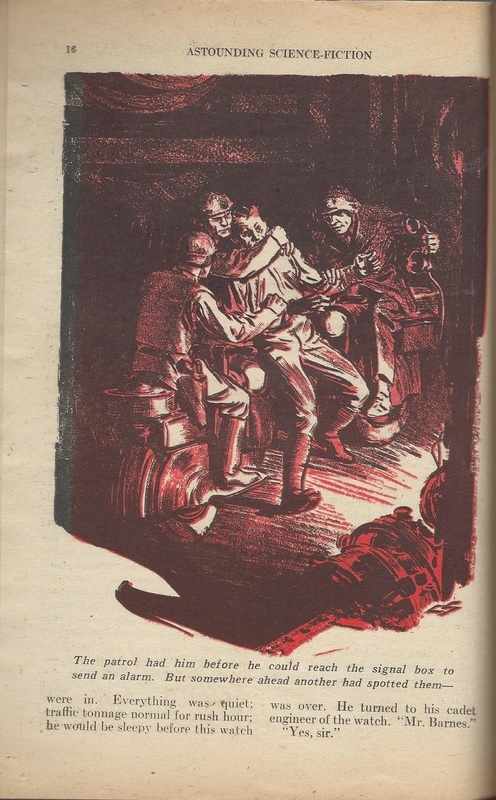 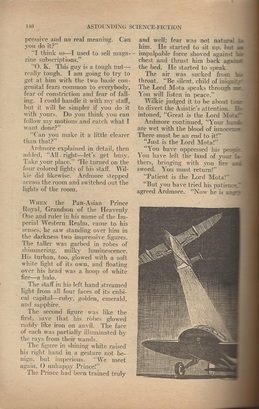 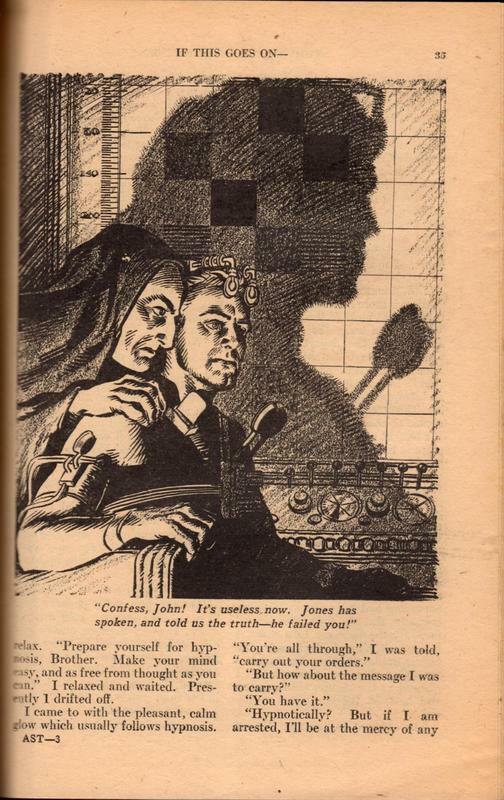 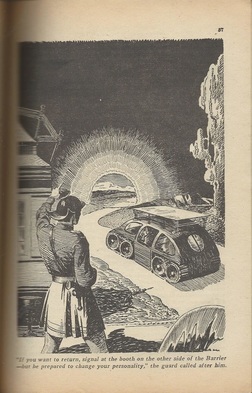 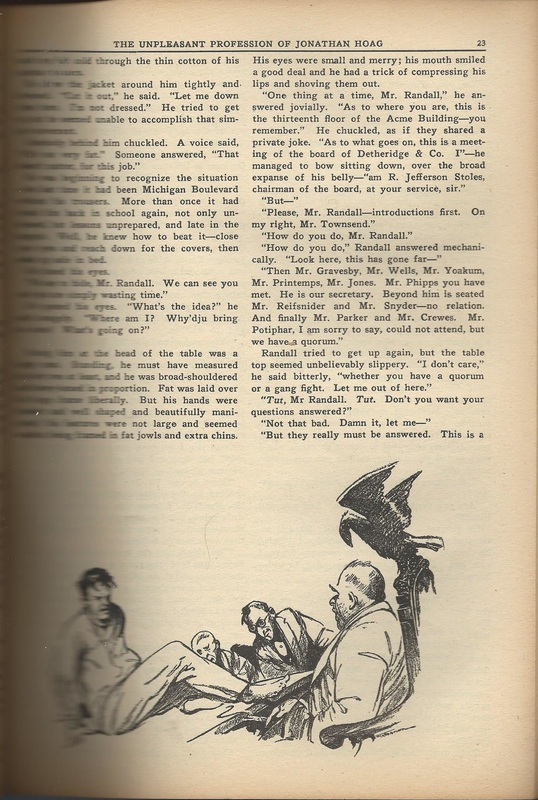 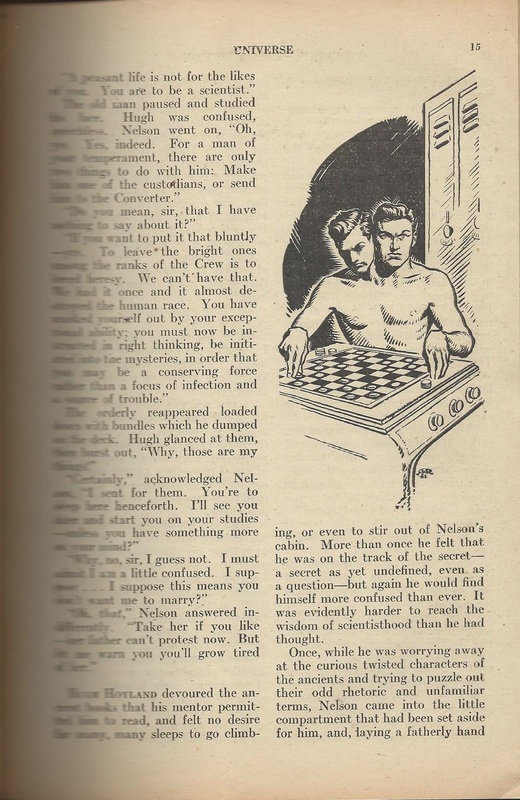 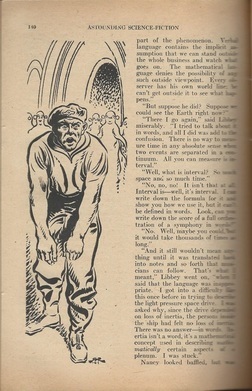 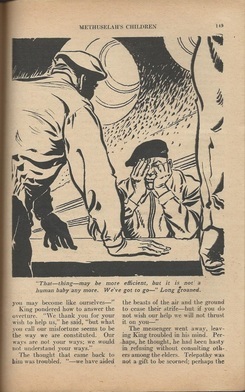 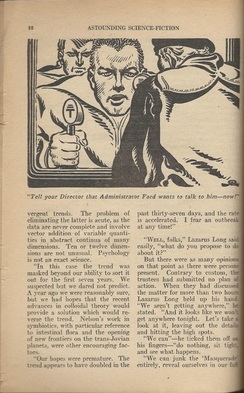 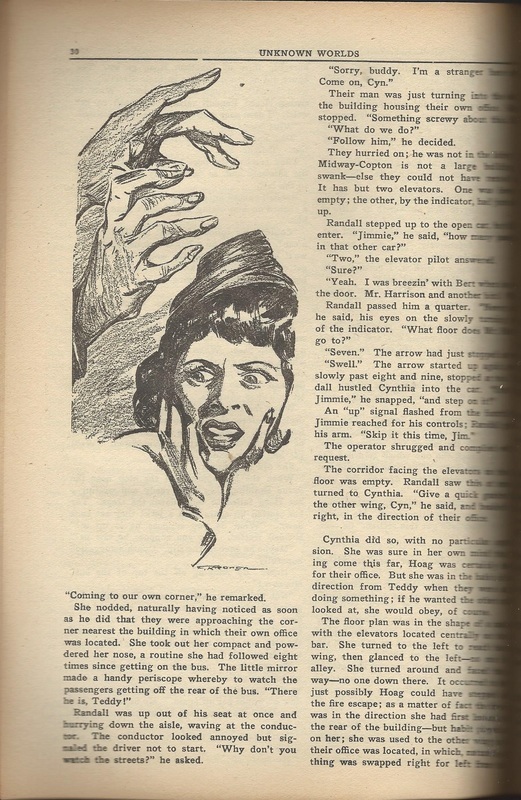 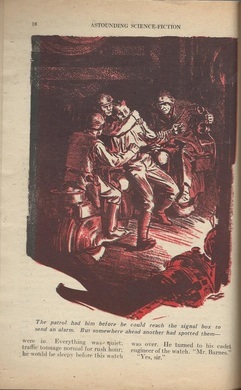 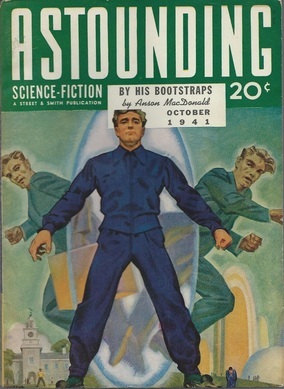 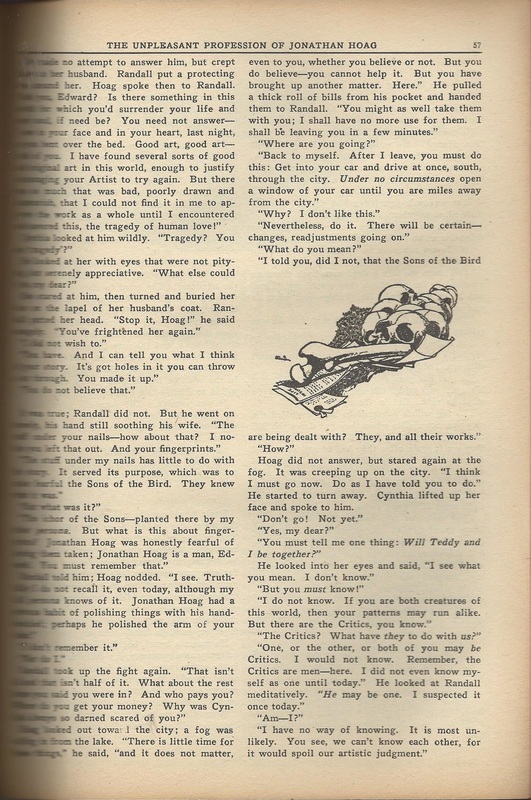 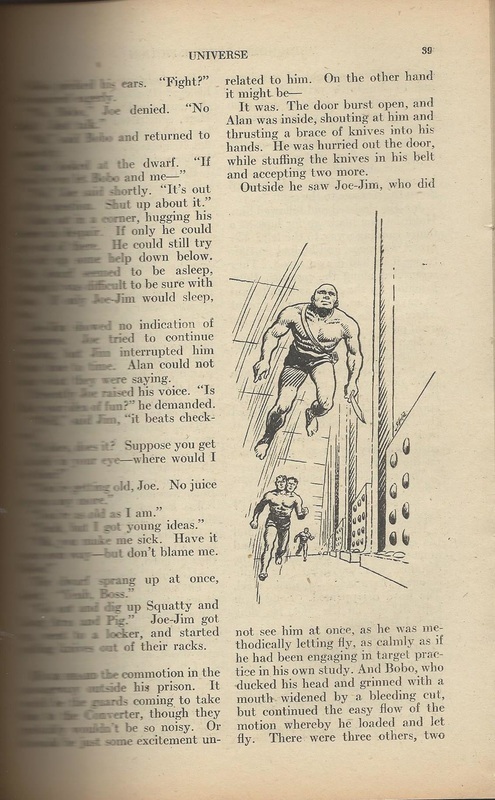 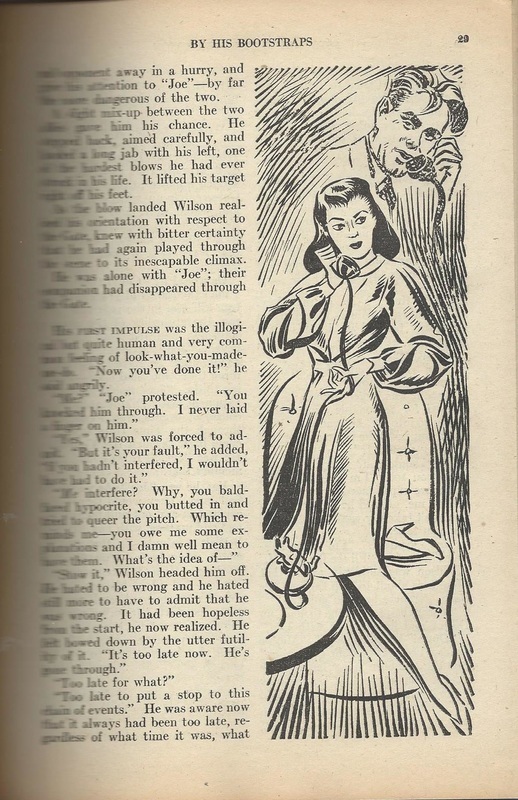 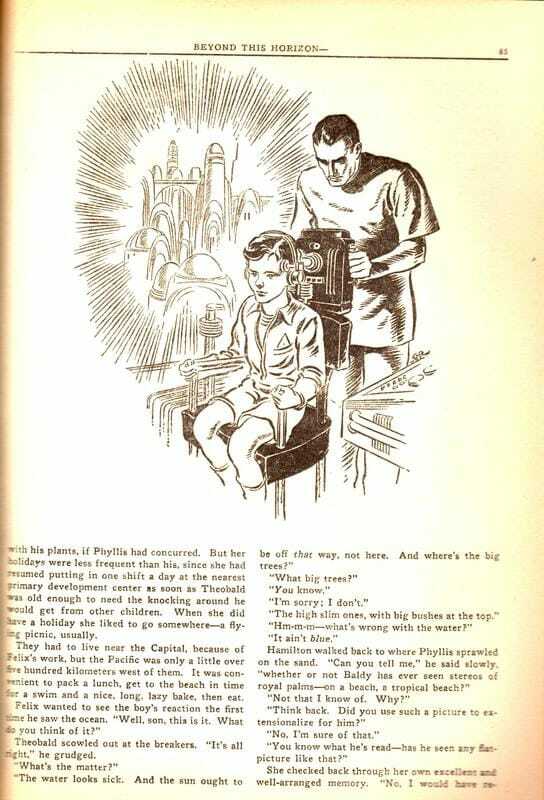 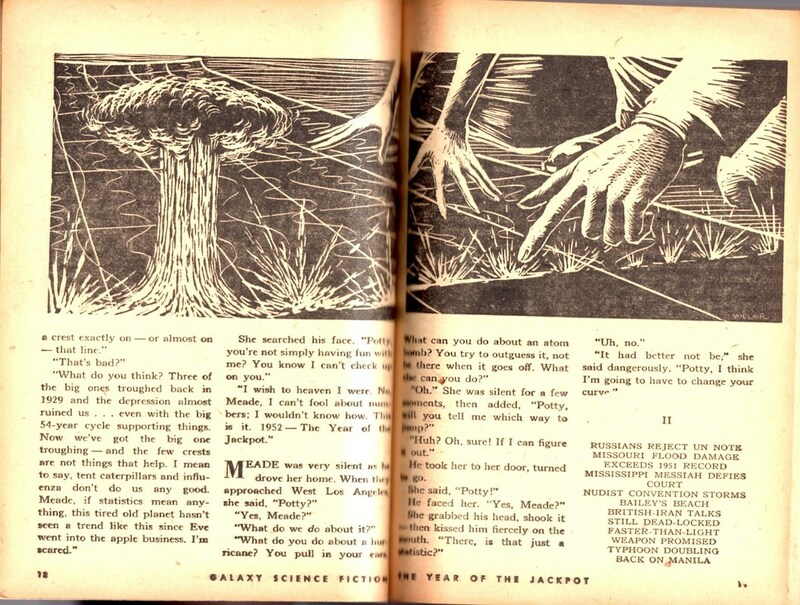 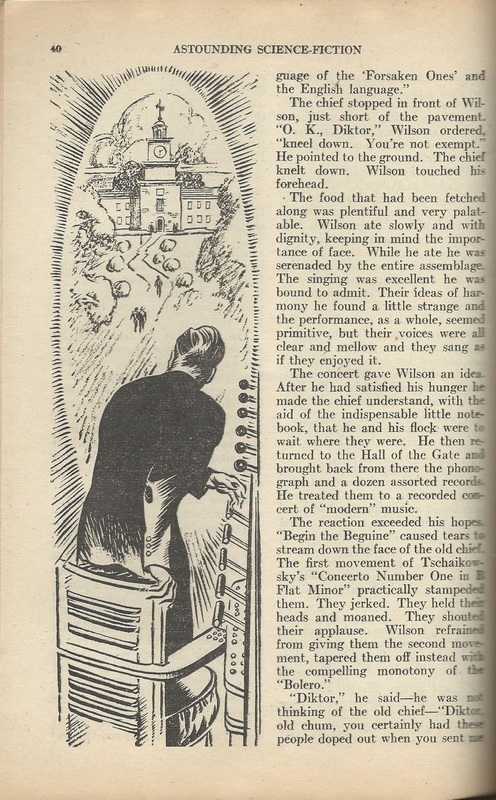 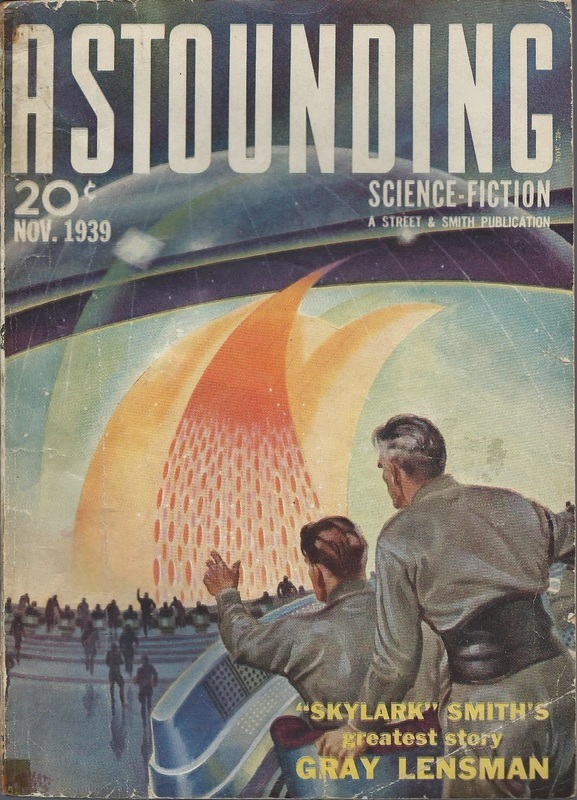 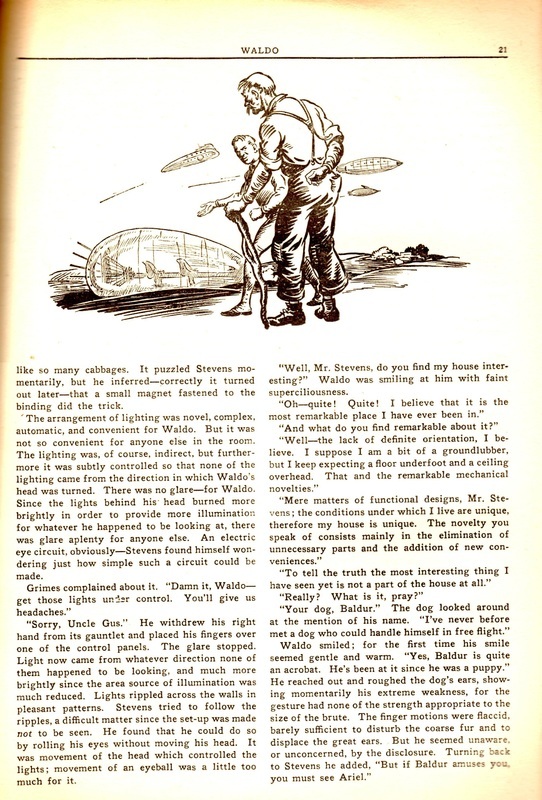 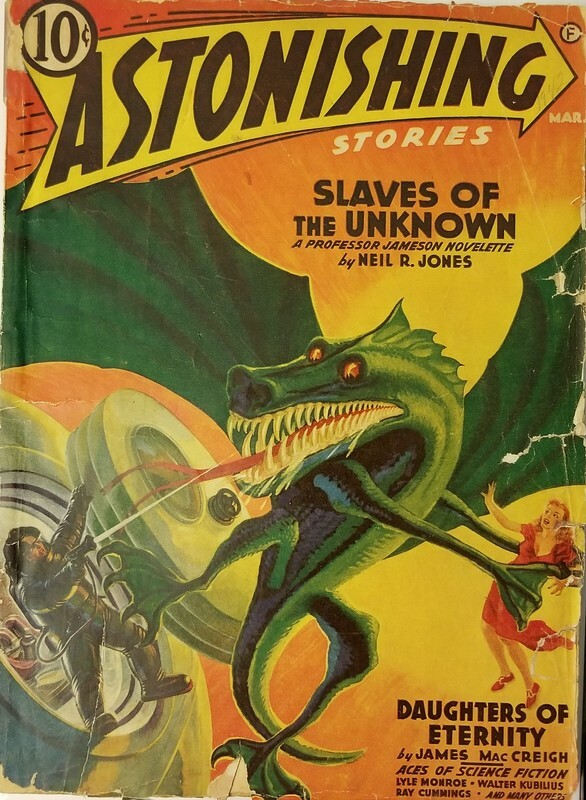 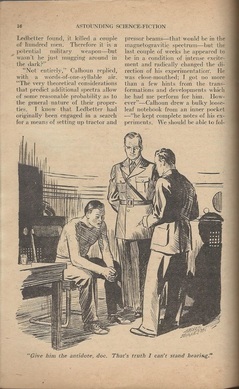 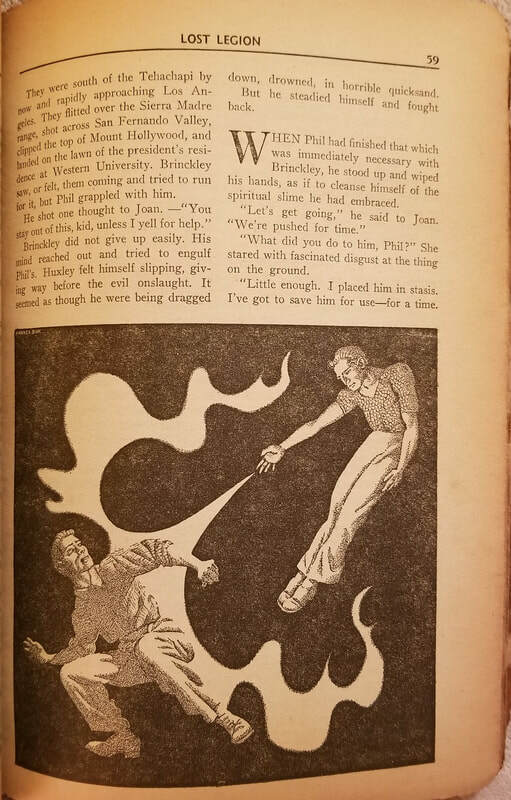 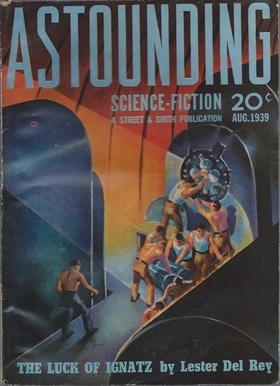 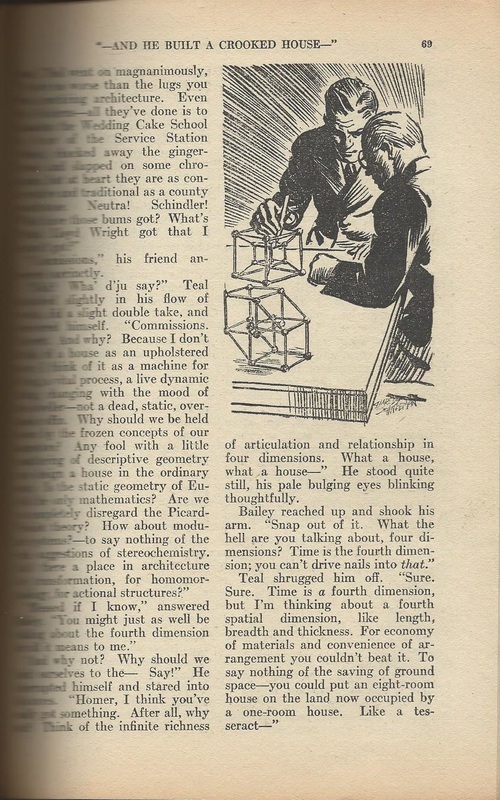 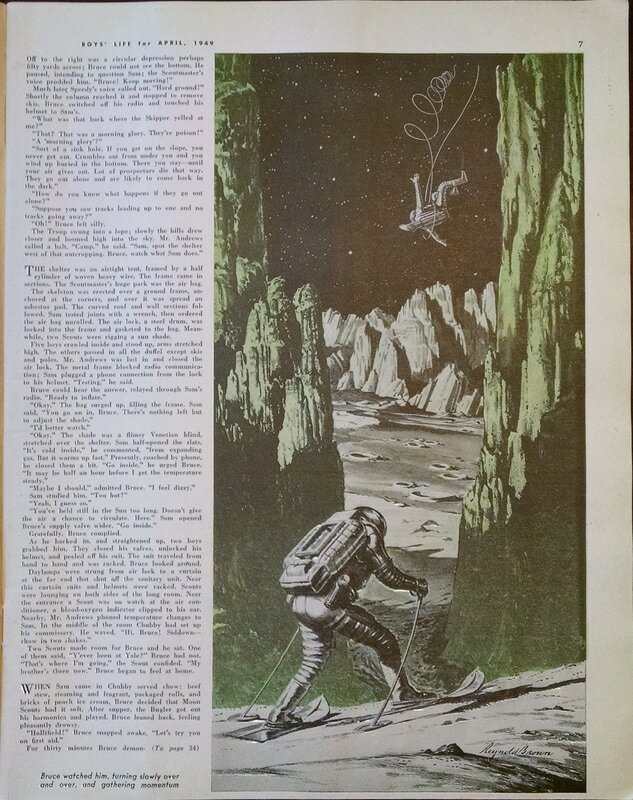 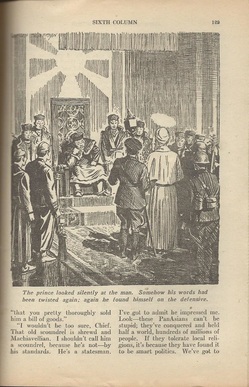 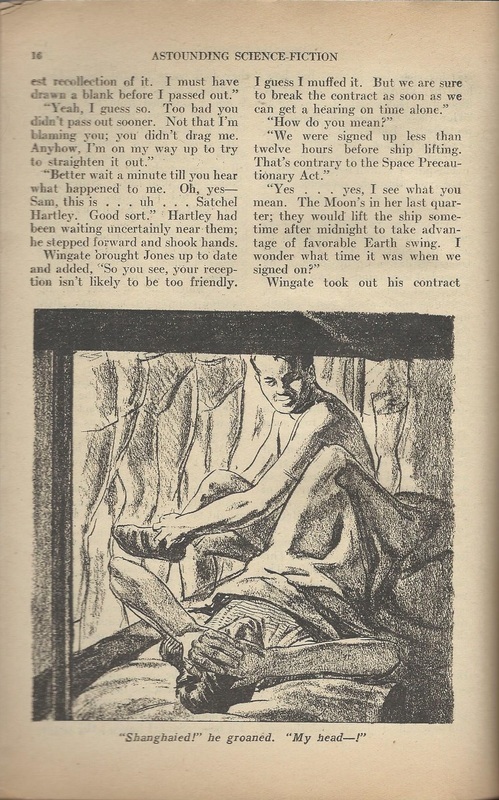 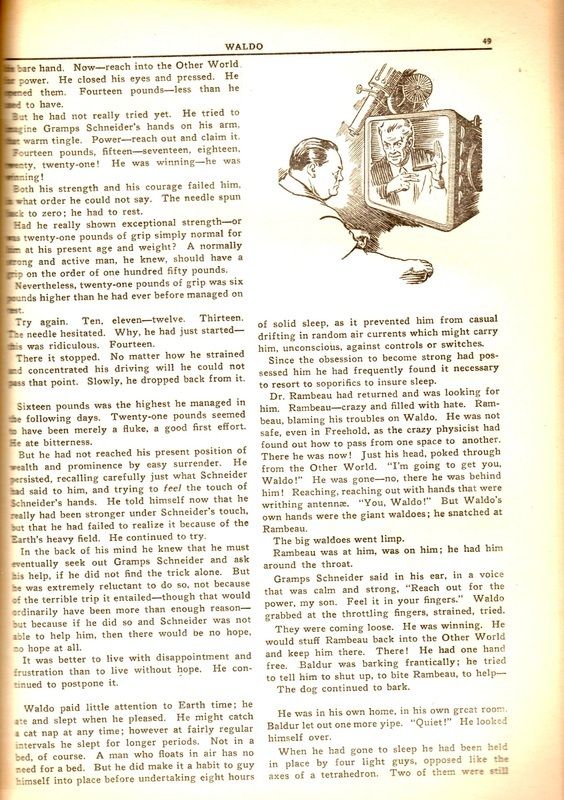 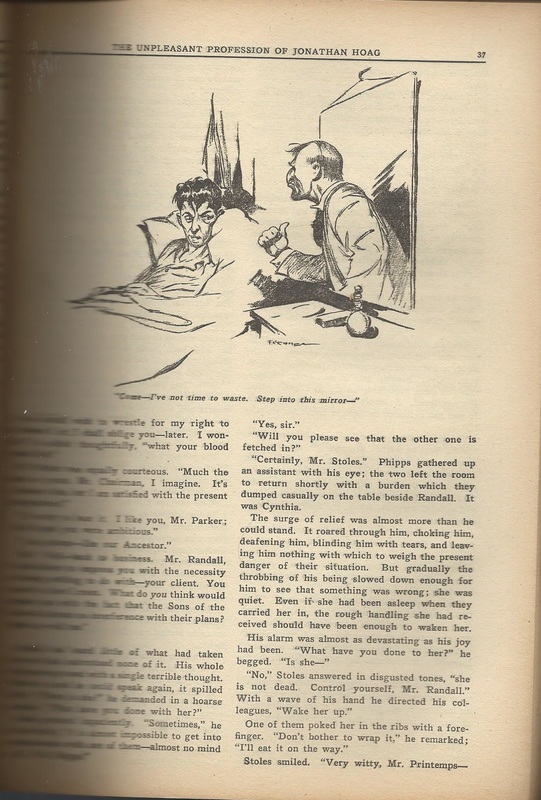 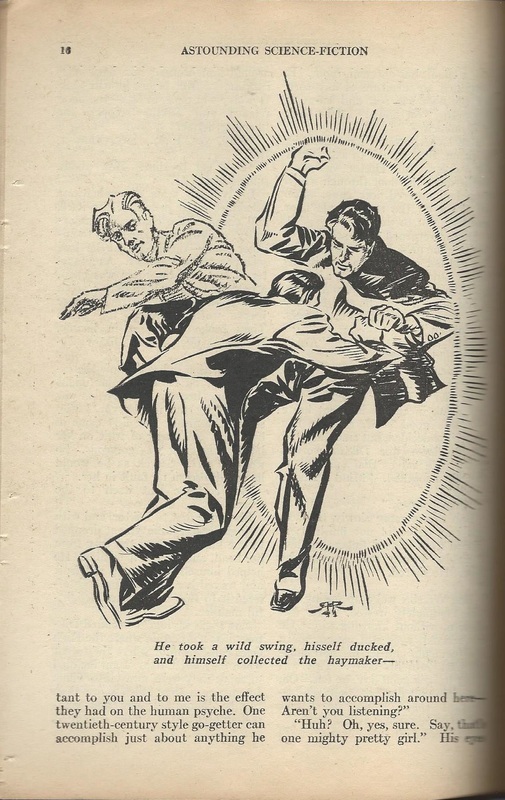 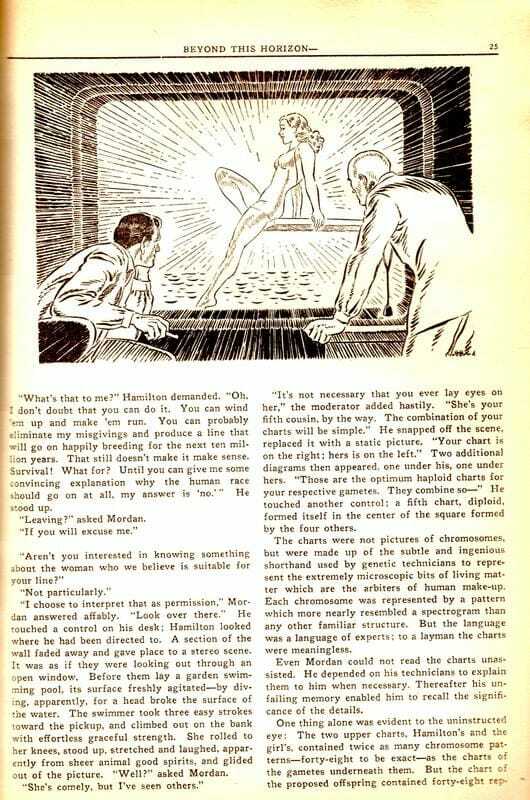 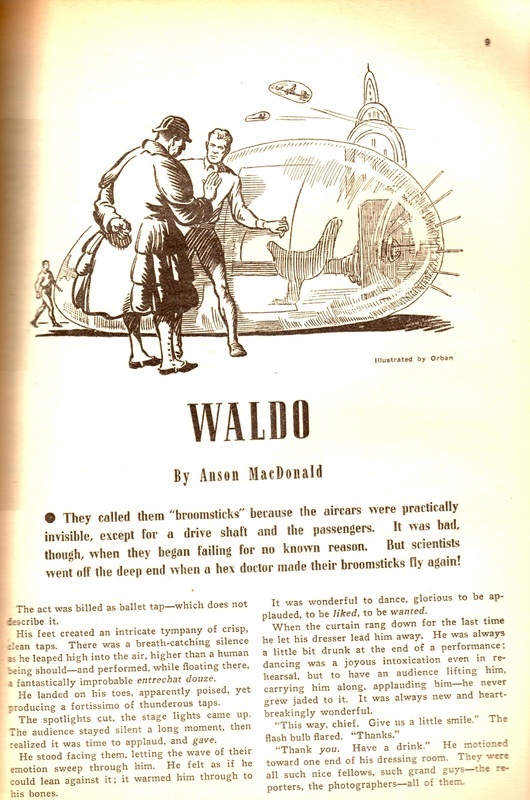 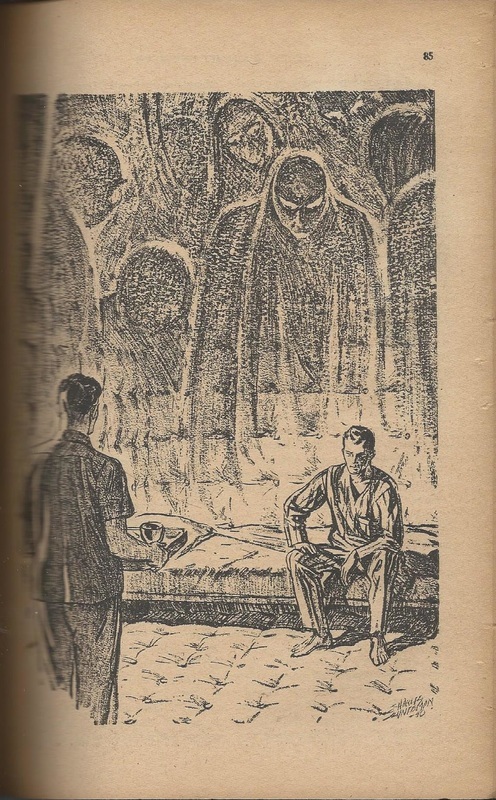 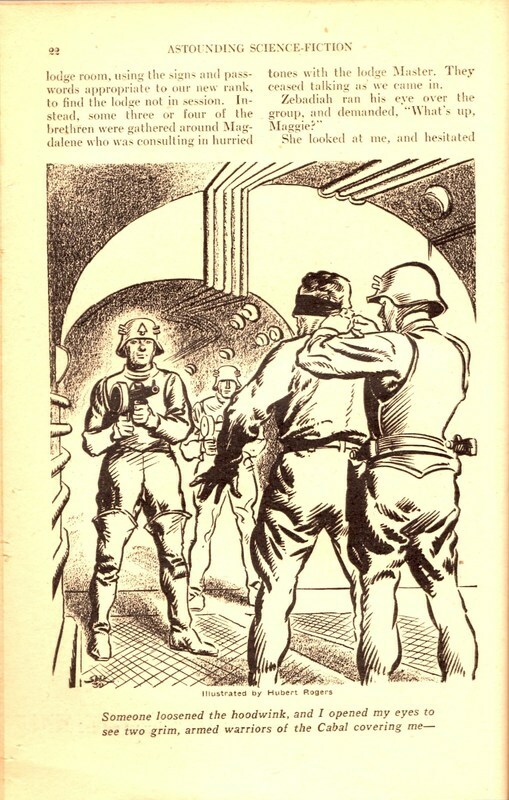 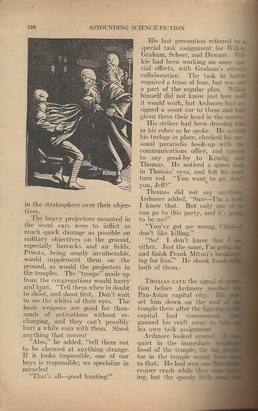 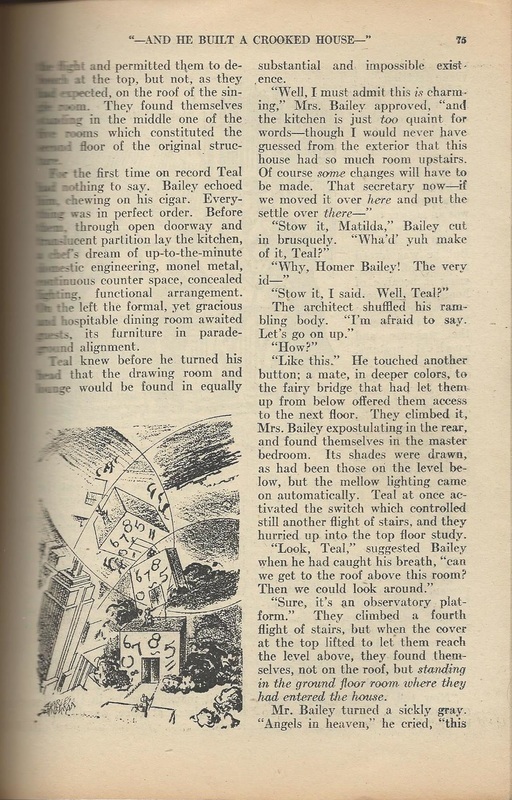 The Astounding Science-Fiction of the 1930s through mid-1942, however, are a beautiful 9.25 x 6.5 inches. 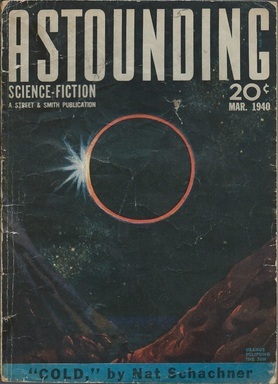 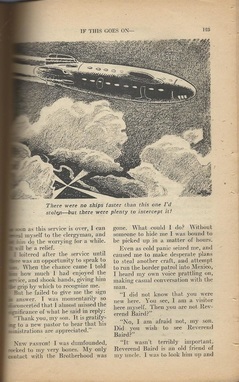 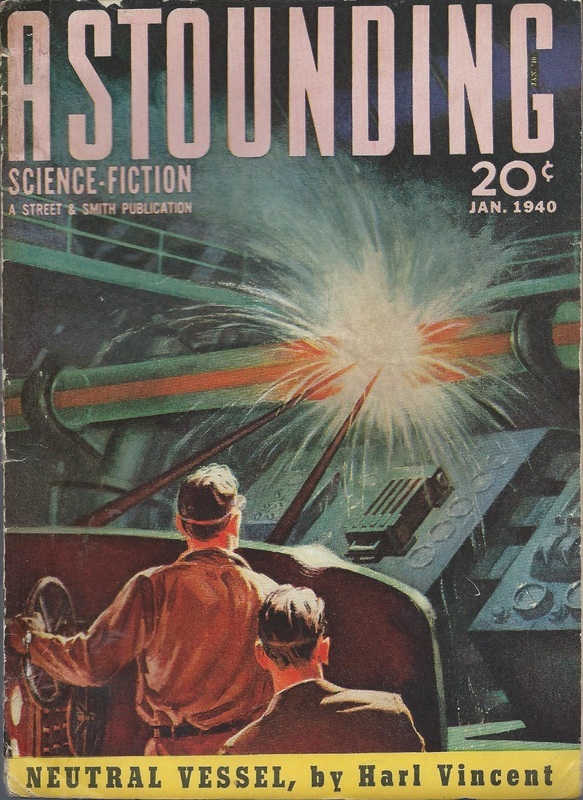 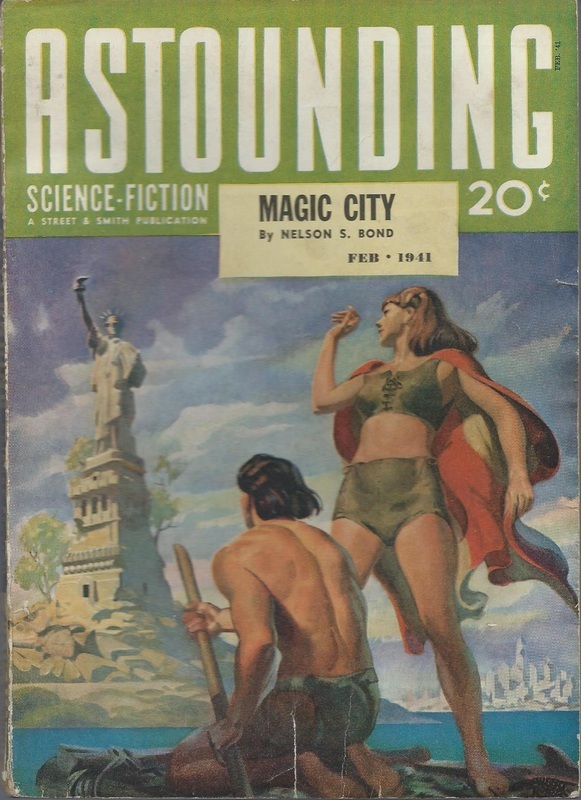 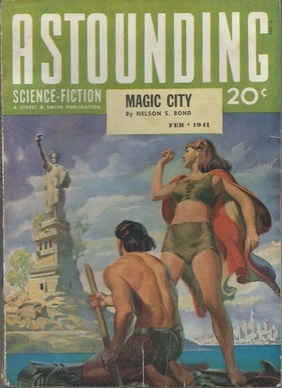 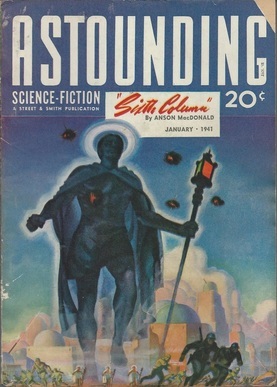 And yet Unknown of late 1942, and the Astounding of mid-1942, are a staggering 11.25 x 8.5 inches. 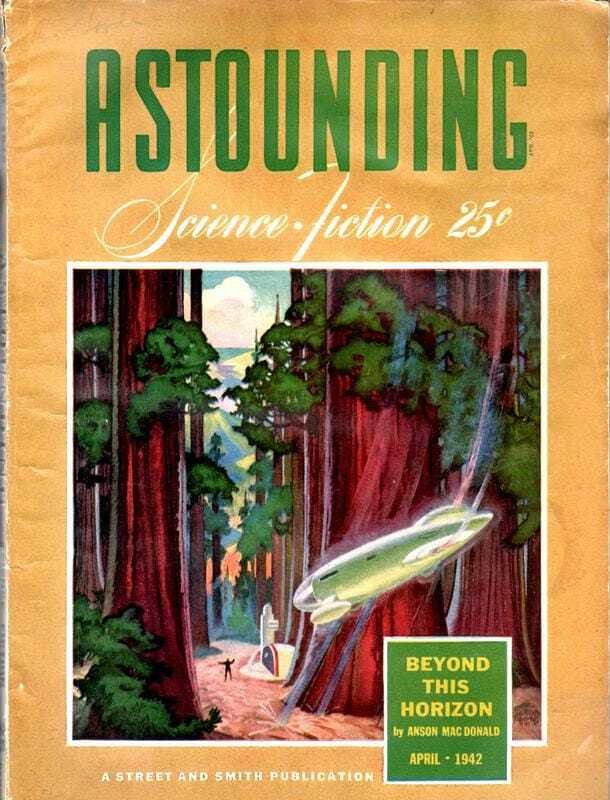 These can be, therefore, huge canvases for the SF art of a lifetime ago, and well worthy of our enjoyment and study. 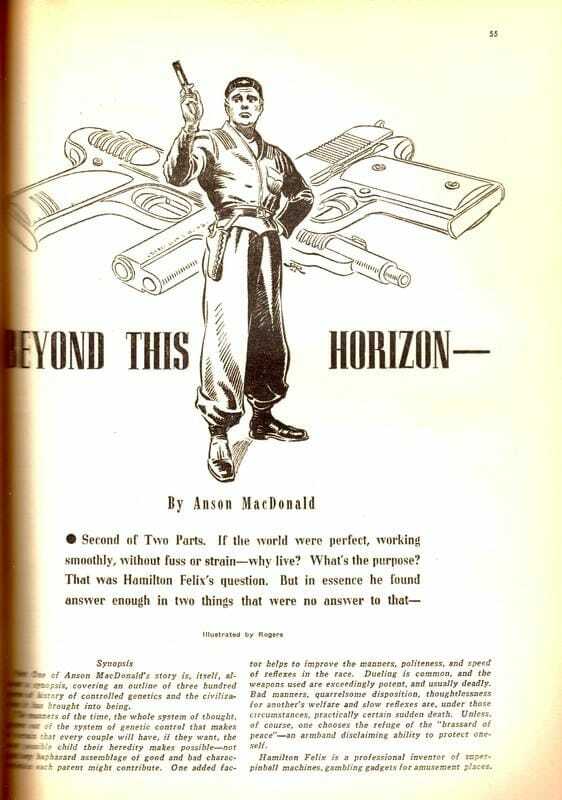 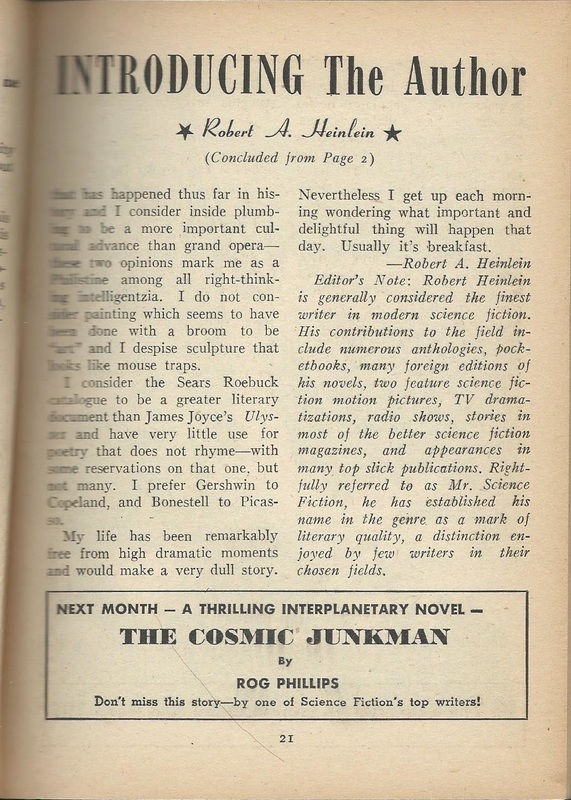 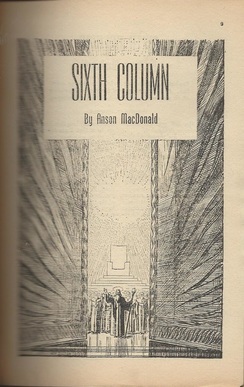 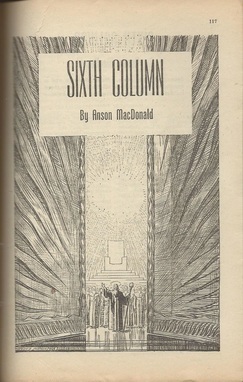 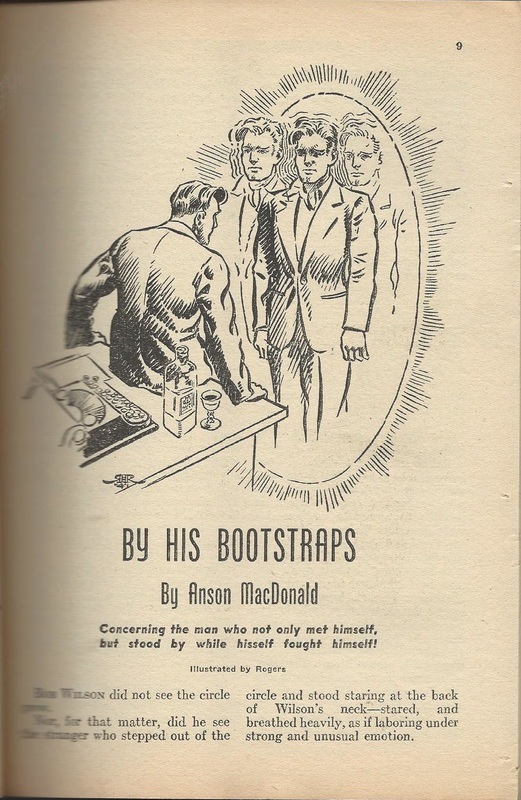 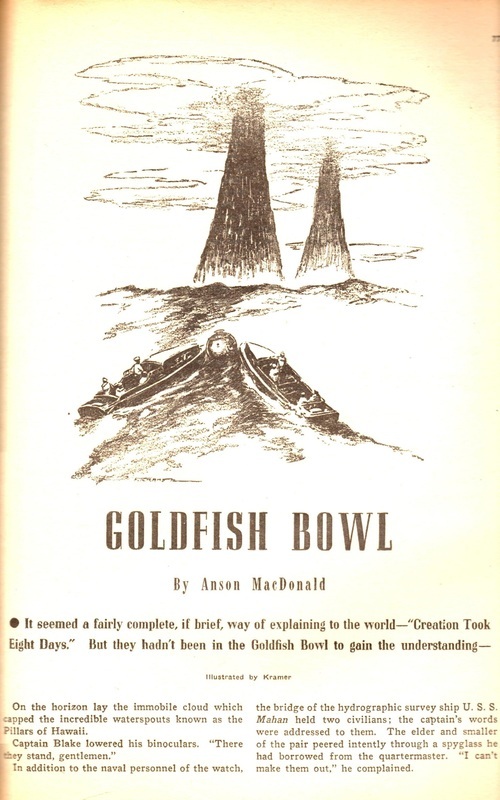 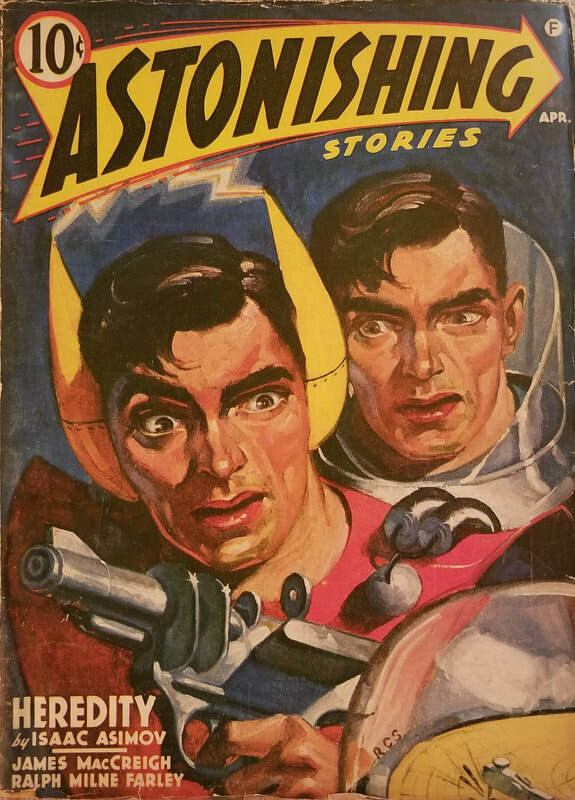 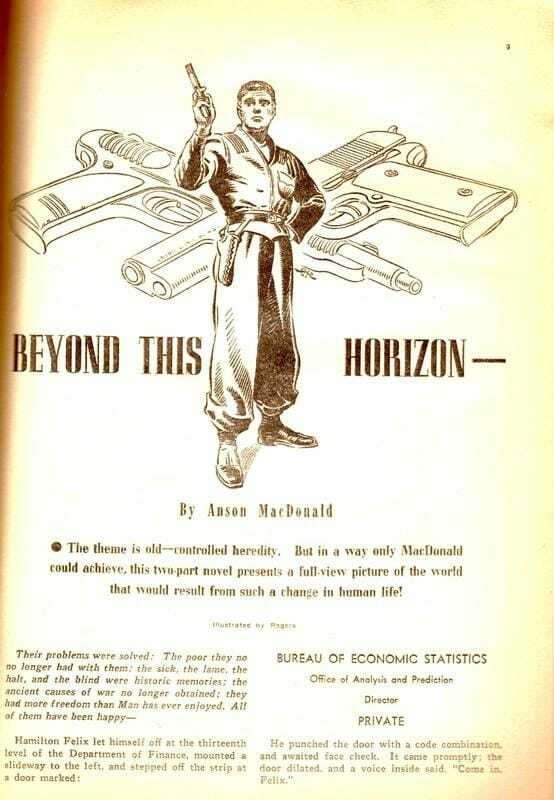 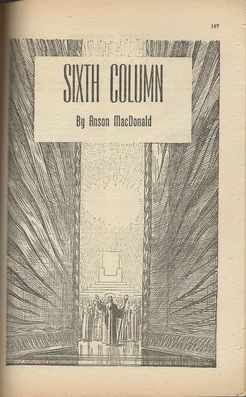 The bibliography in Grumbles from the Grave mistakenly says this was a pseudonymous Anson MacDonald, but it indeed had a Heinlein byline. 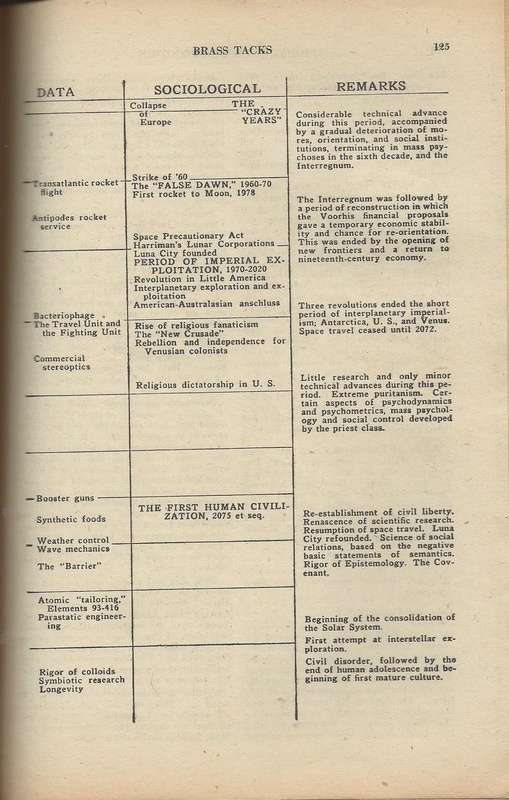 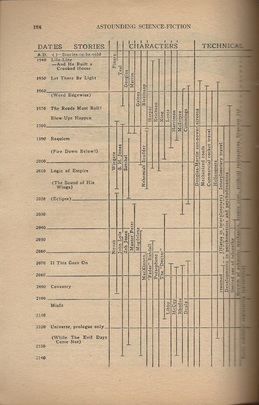 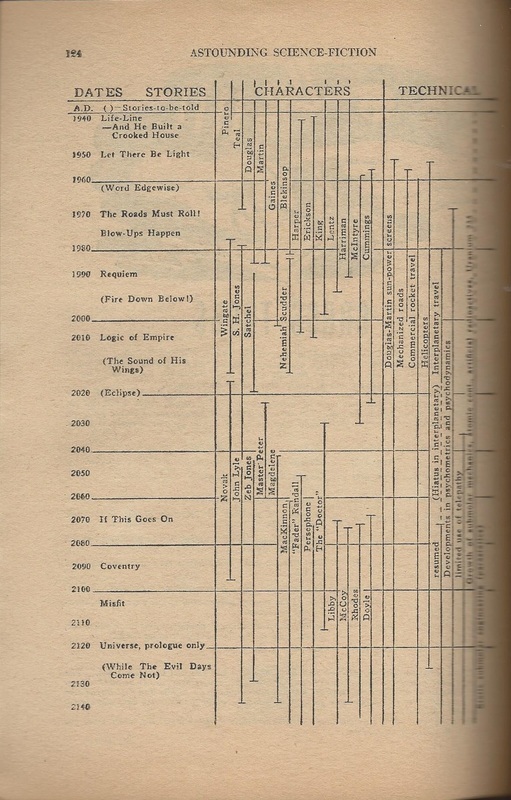 Is Heinlein’s “Future History” chart a piece of art? 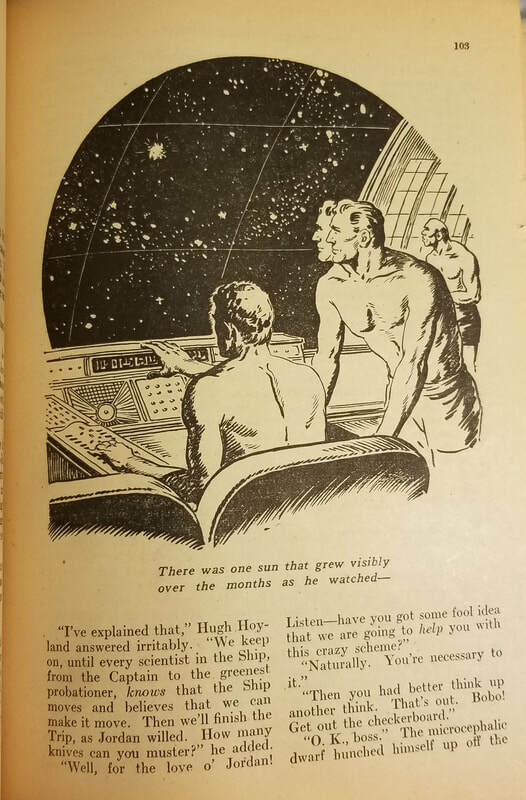 Perhaps so. 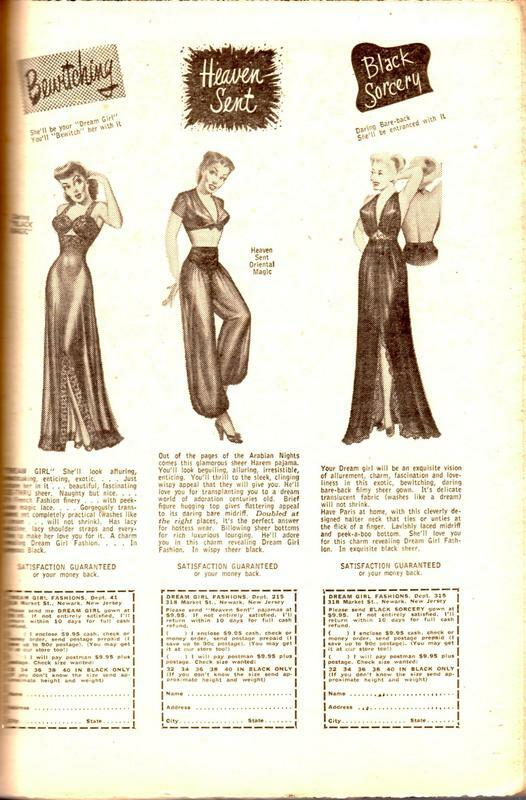 Here is its very first public appearance, from May 1941. 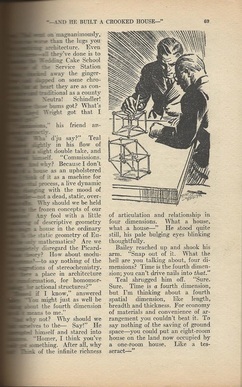 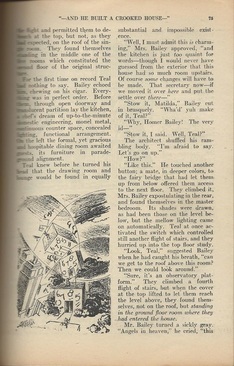 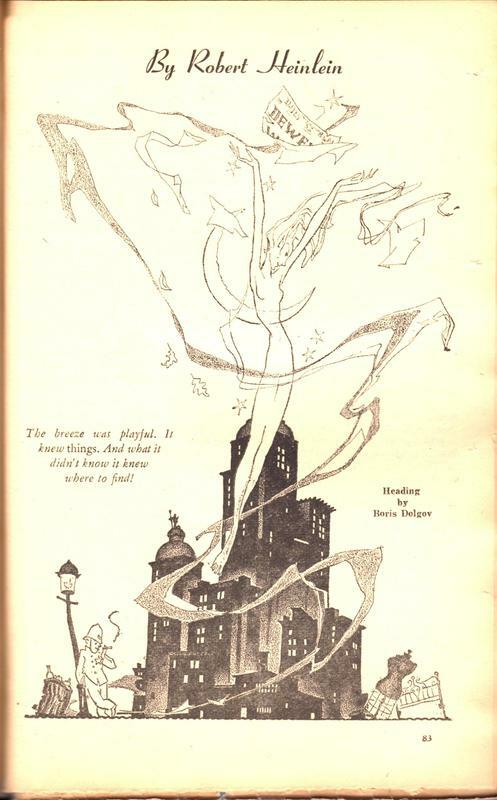 Note “ ‘—And He Built a Crooked House—’,” which disappears from later versions. 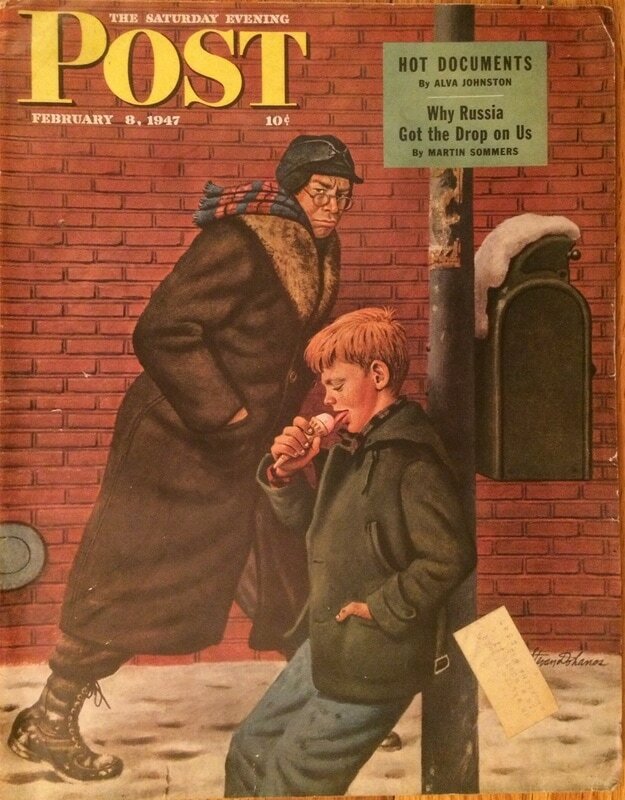 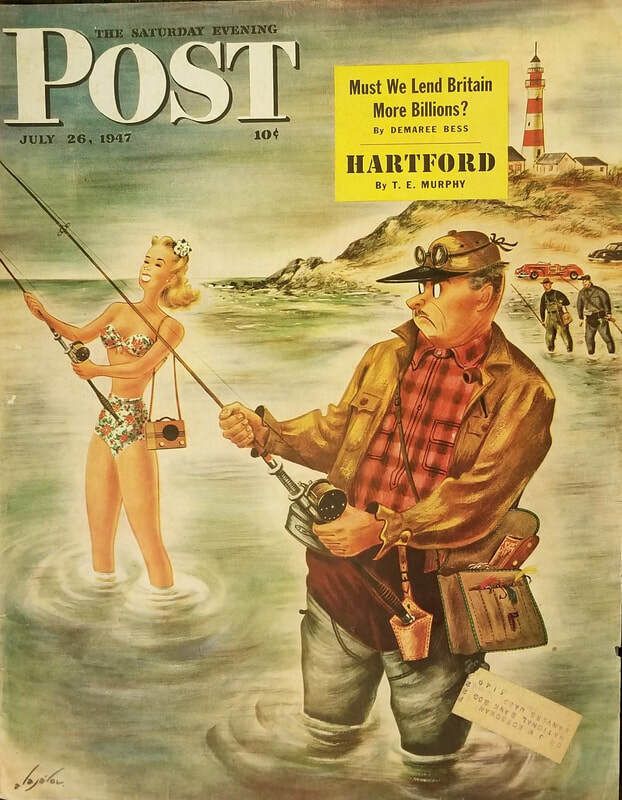 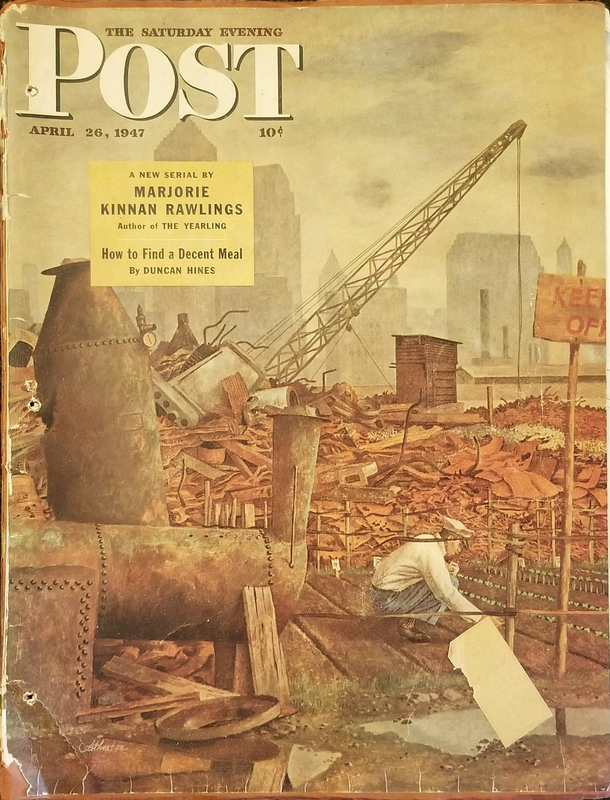 The Saturday Evening Post definitely is not a pulp magazine—it’s actually a “slick,” and in fact one of most high-end and respectable of the era. 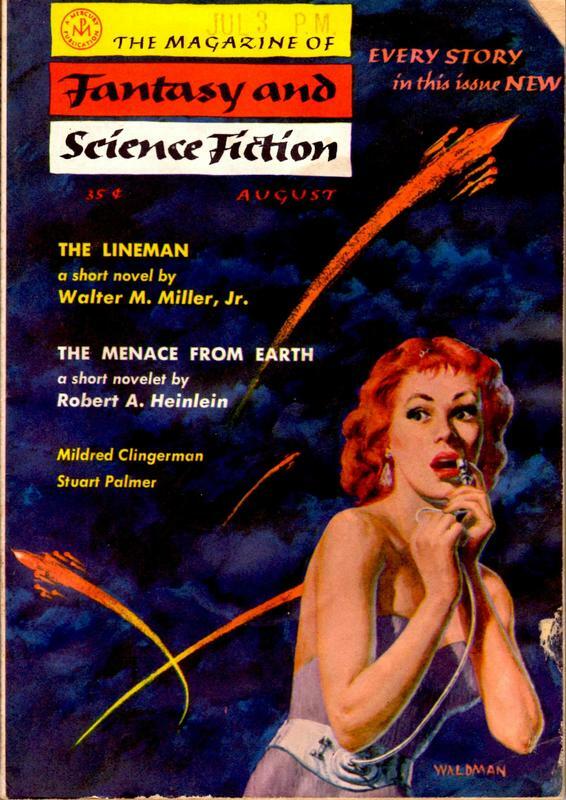 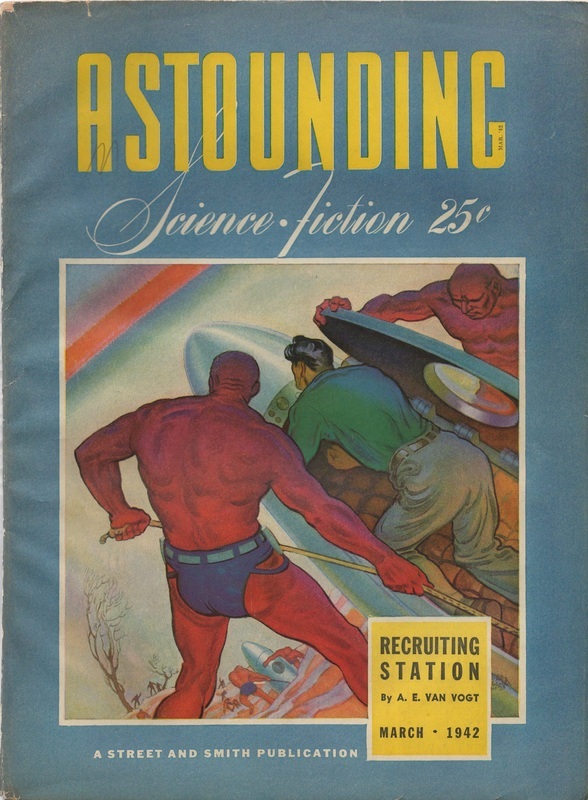 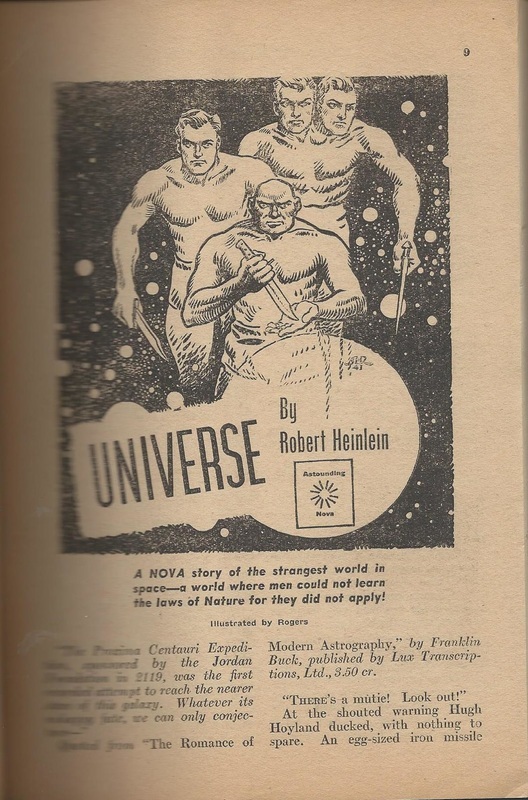 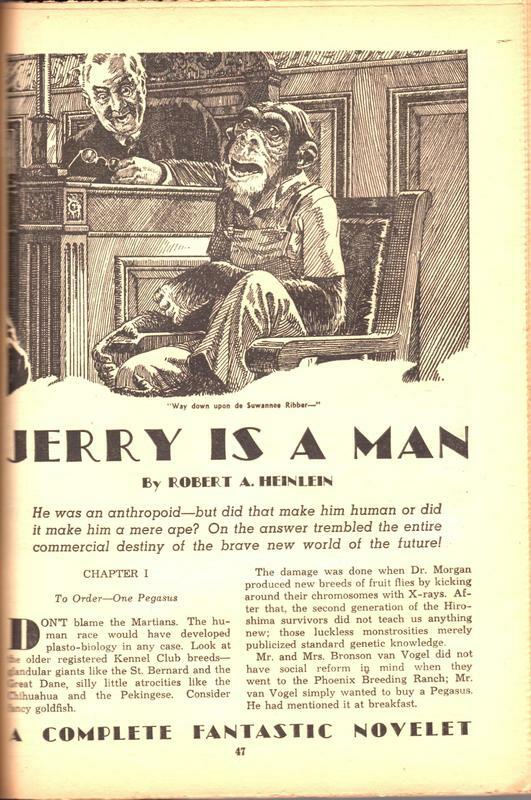 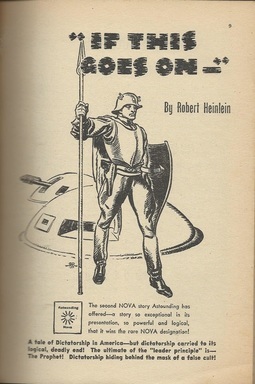 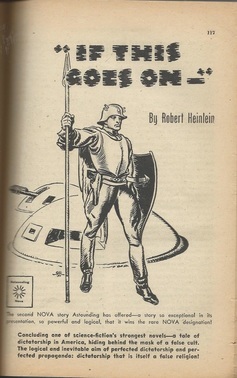 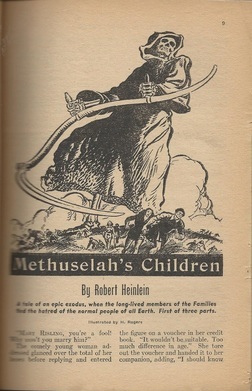 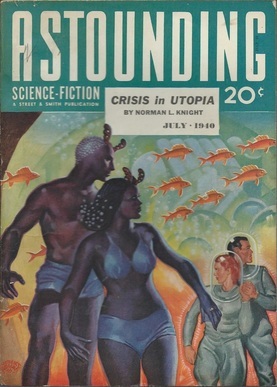 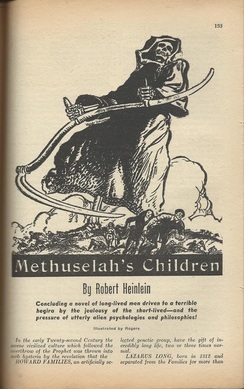 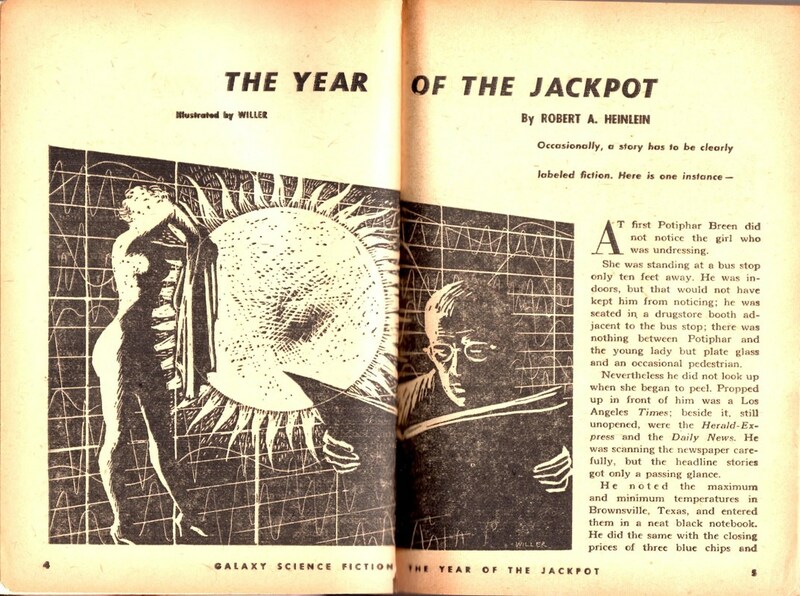 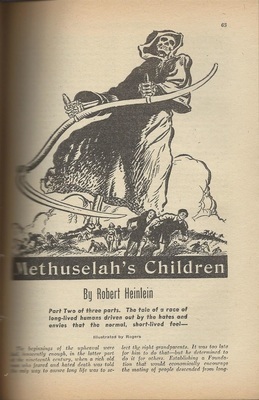 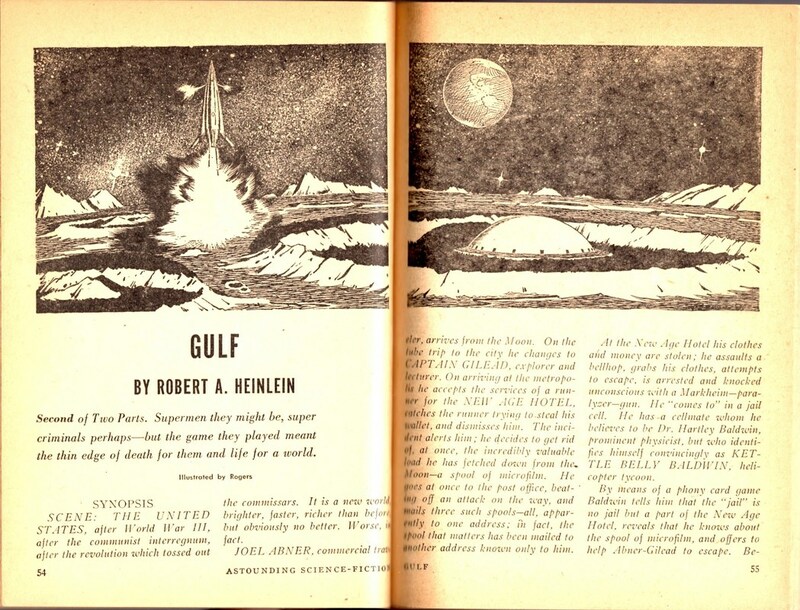 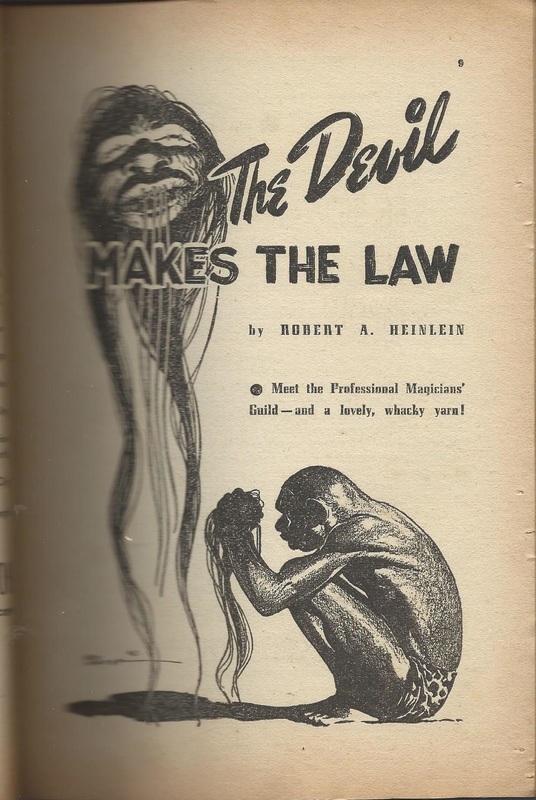 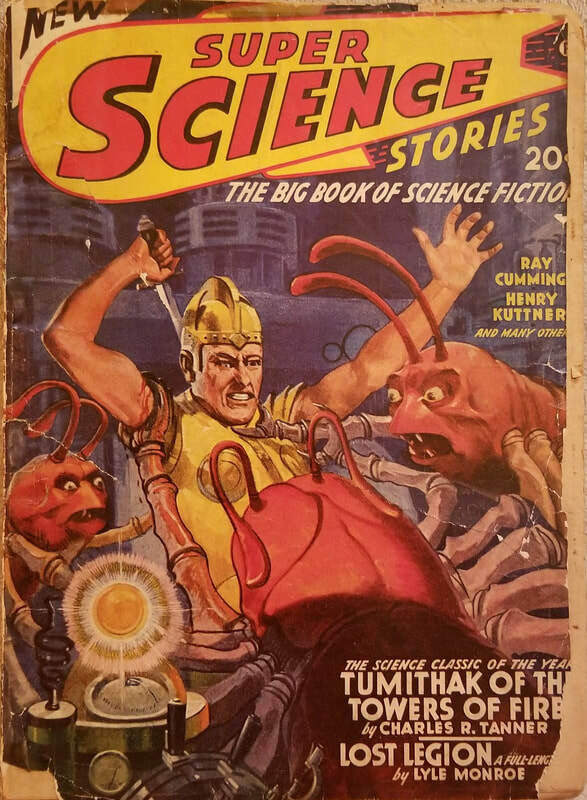 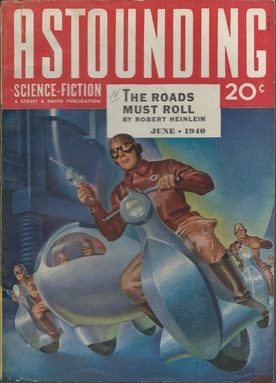 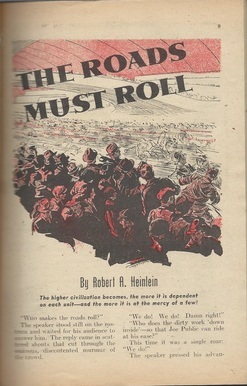 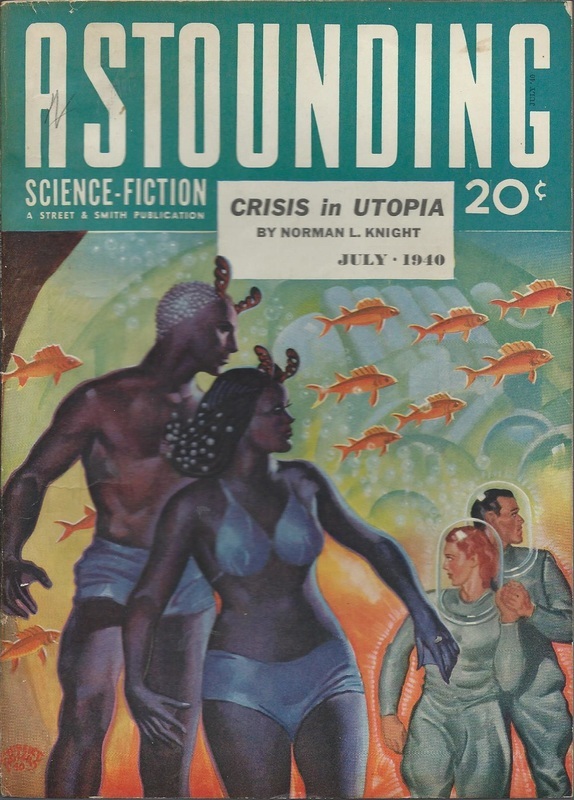 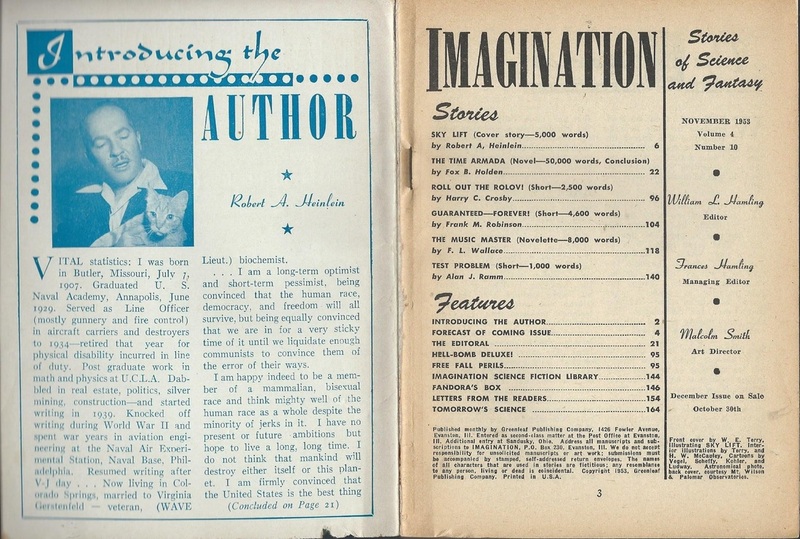 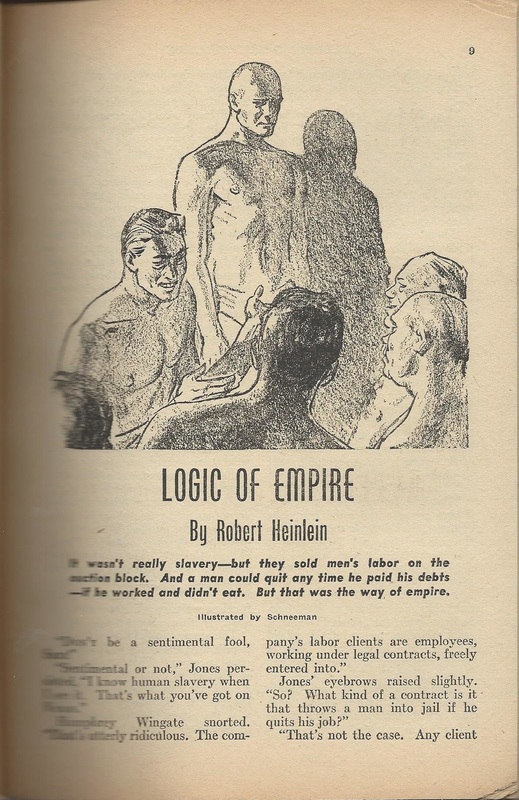 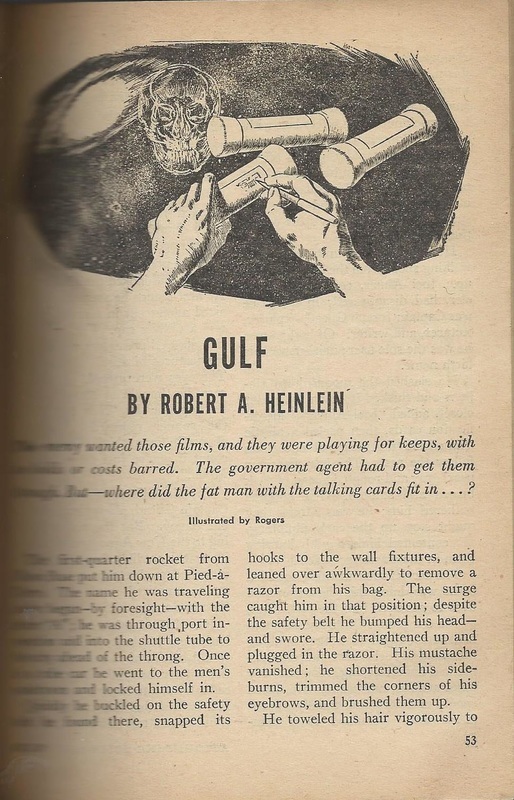 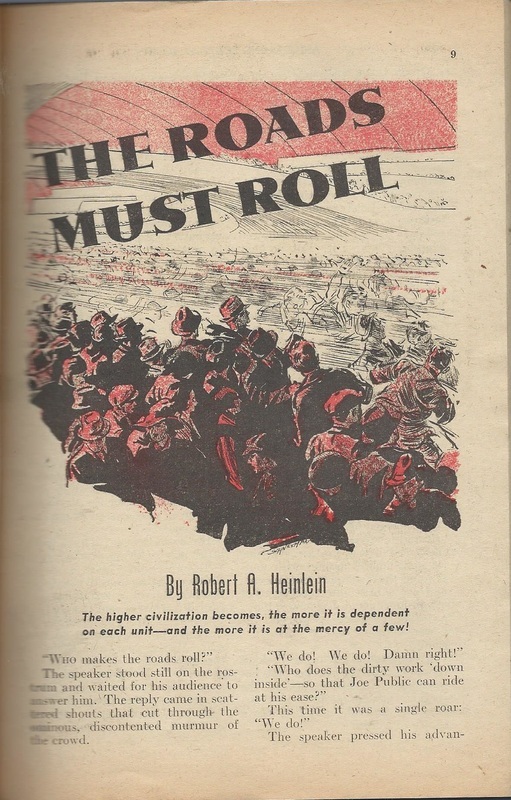 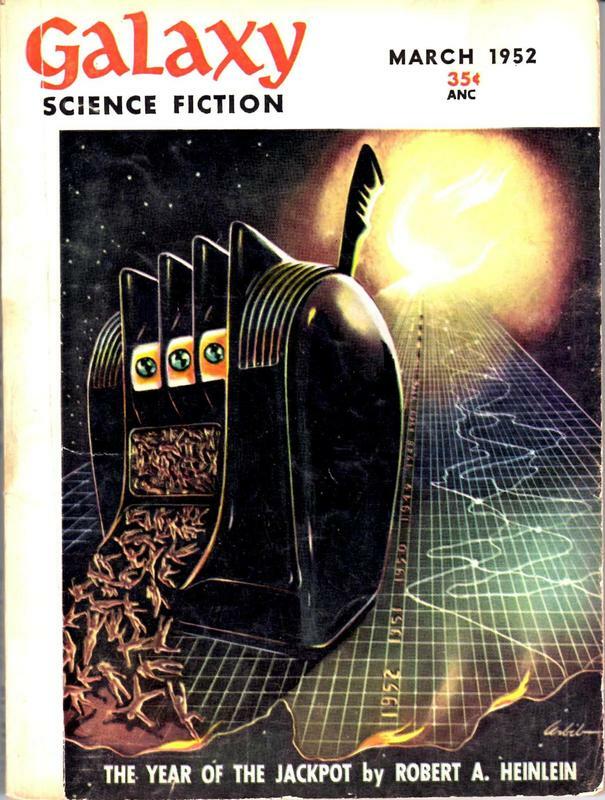 When Heinlein finally began having his stories publishing in the Post, Blue Book, and Town and Country after the Second World War, he started to bring science fiction out of its cheap pulp roots and into more mainstream literary culture. 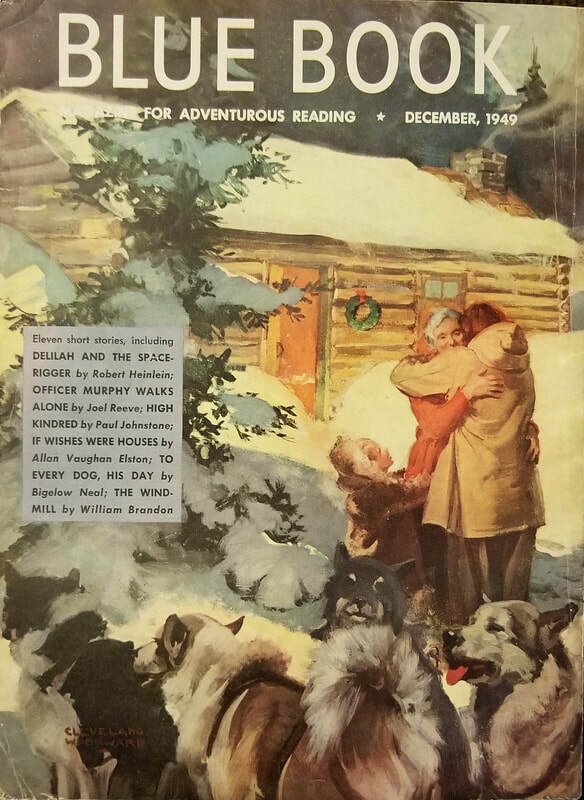 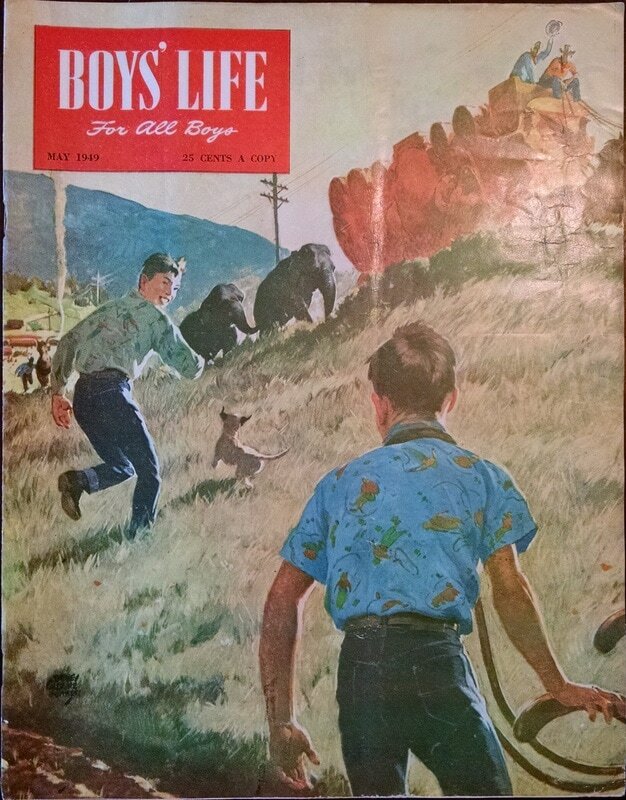 In any event, just as The Saturday Evening Post is no pulp magazine, neither does a single story in one issue either a serial or a novel make. 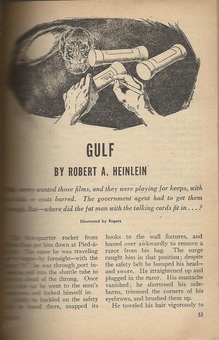 Rather than bend the definition of the “Serialized Novels” page, therefore, instead I’ll bend the definition here. 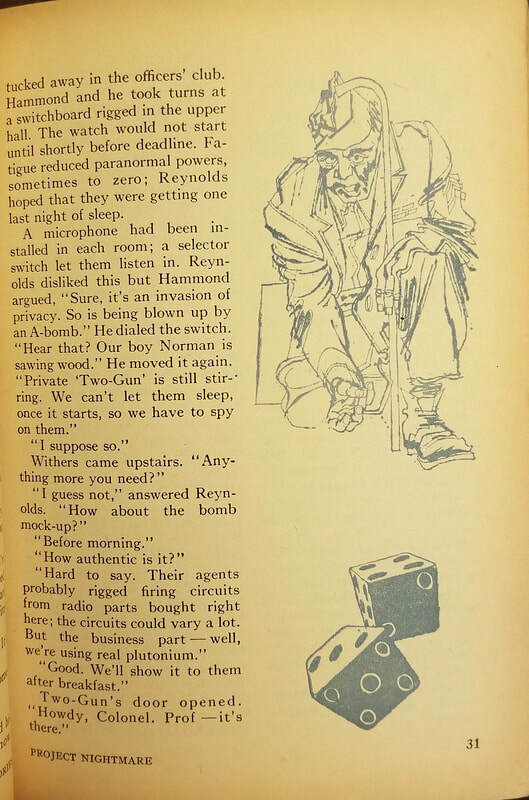 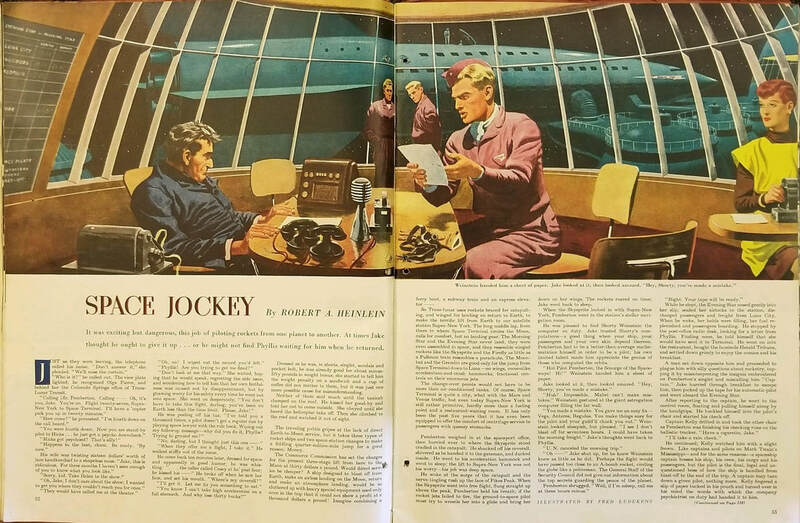 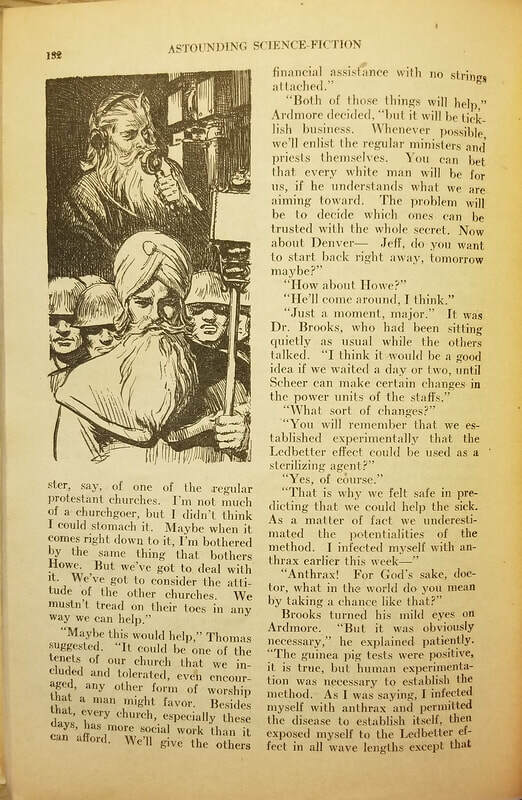 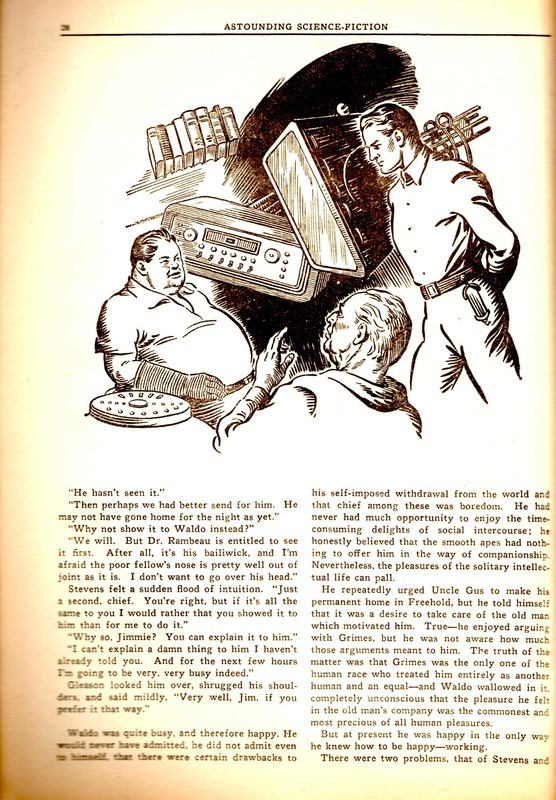 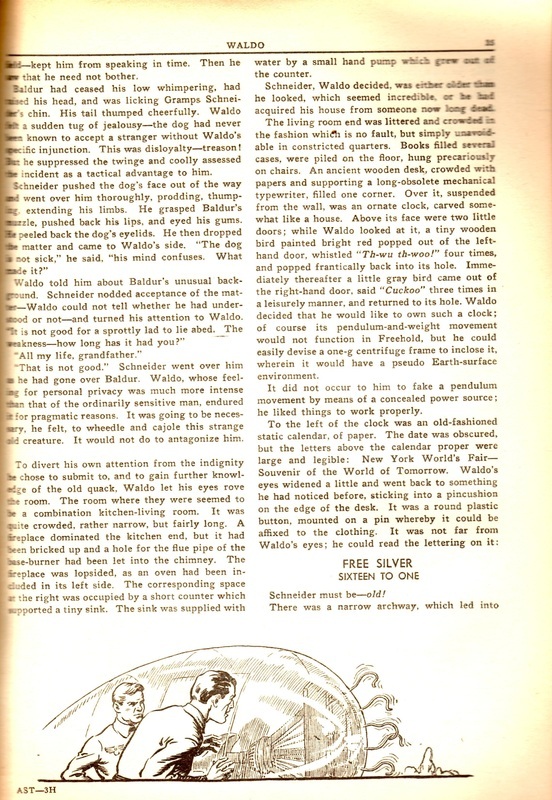 Further work in the ​“slicks”​—higher pay, wider audience, and more prestige than any of the earlier pulp magazines. 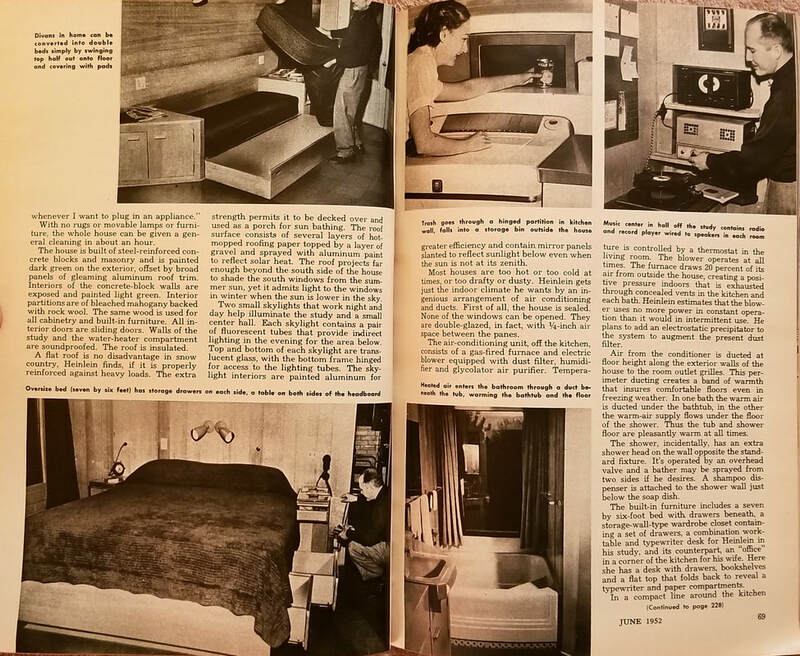 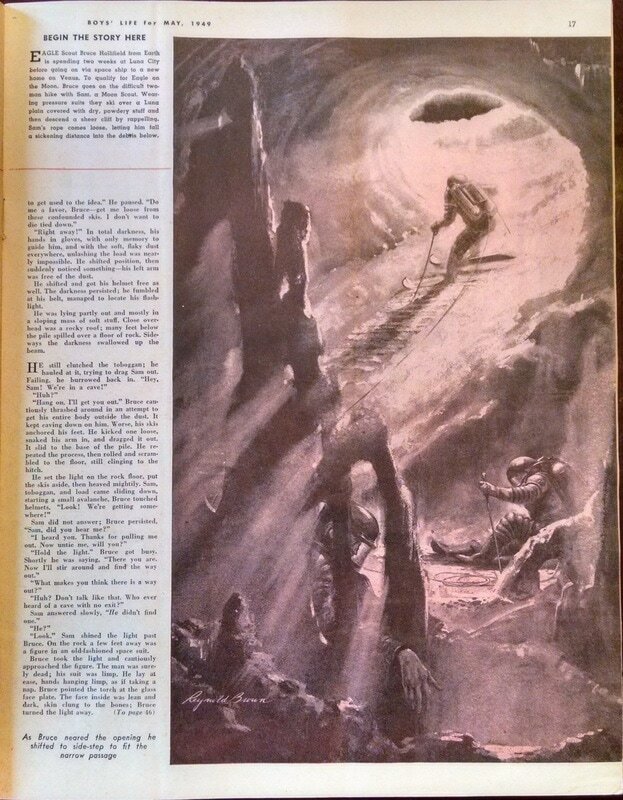 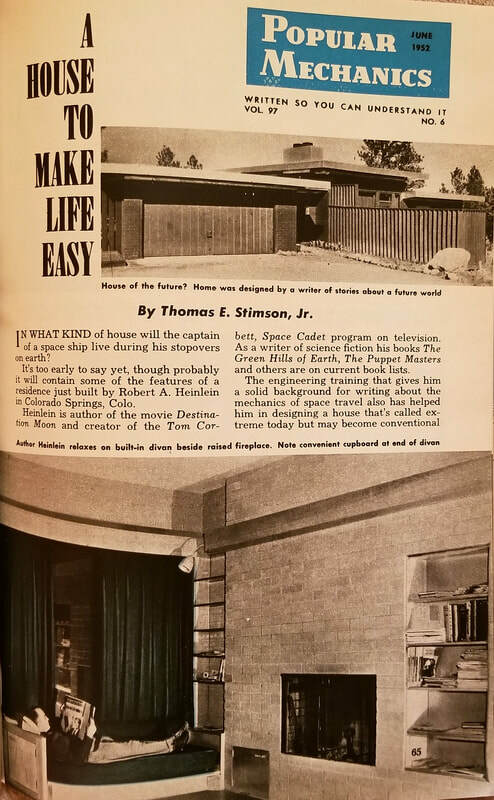 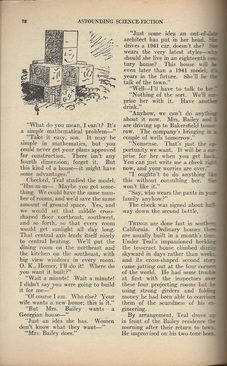 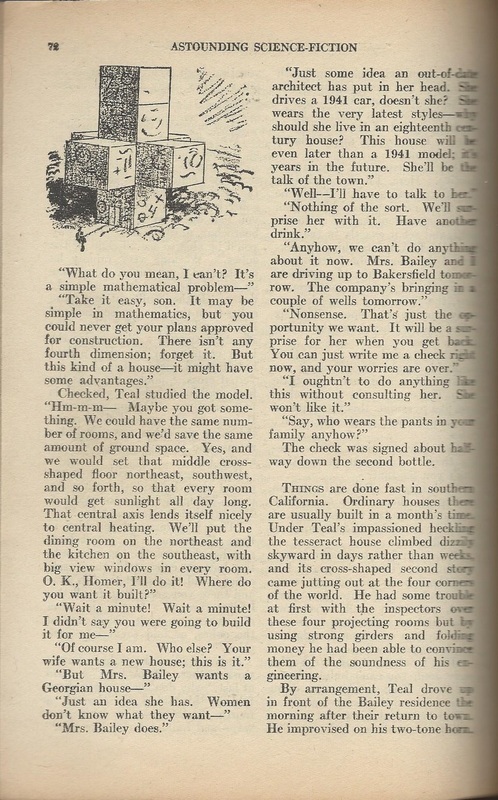 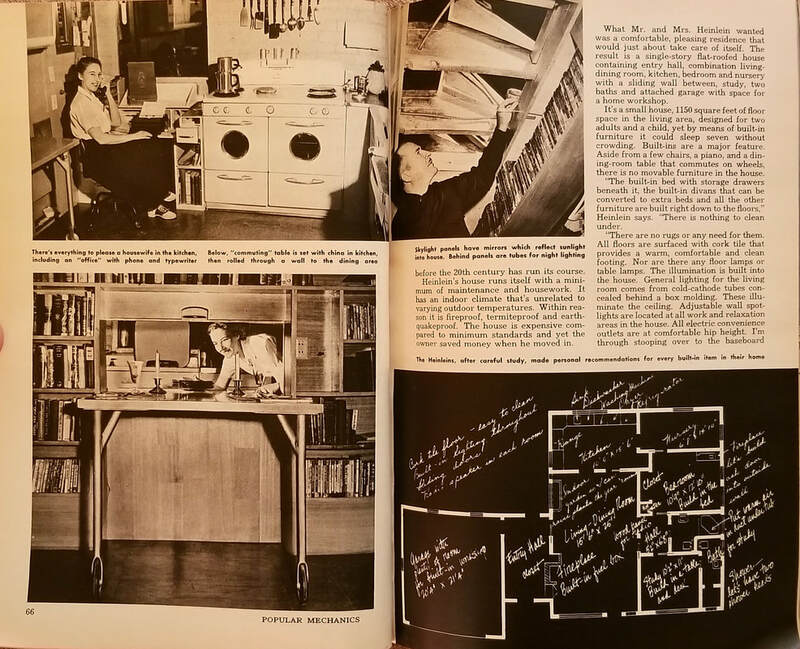 This is not writing by​ Heinlein, of course, but is an article about the house he had designed in Colorado Springs. 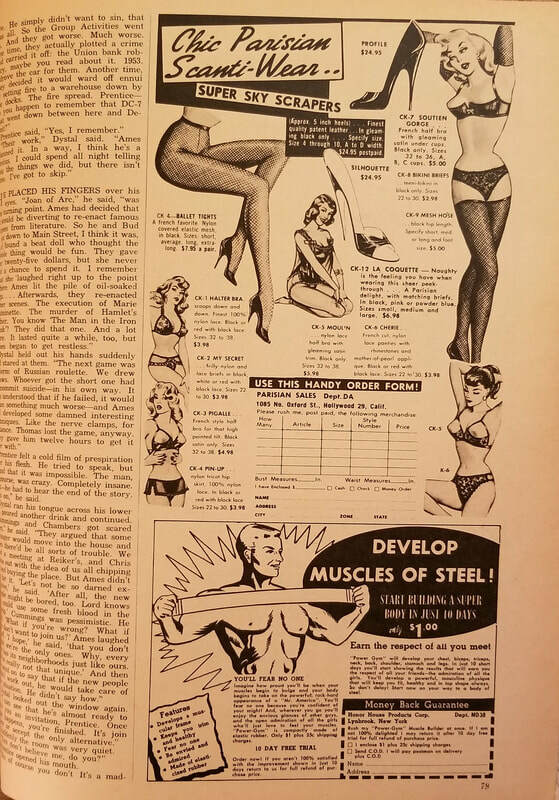 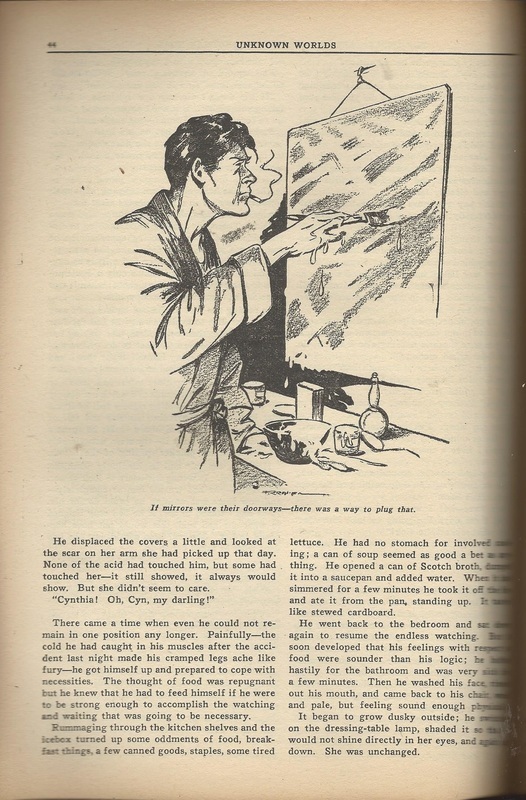 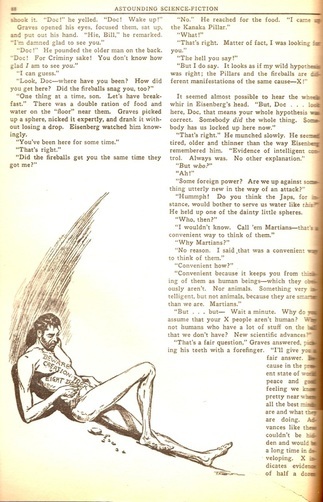 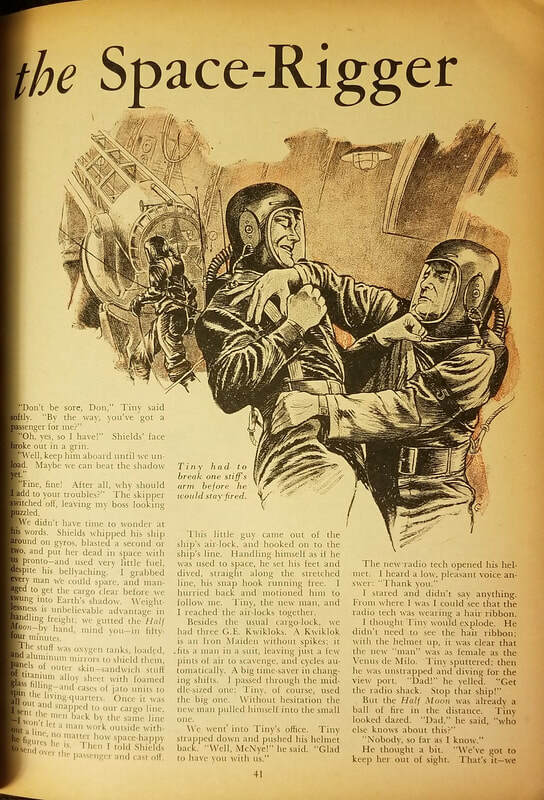 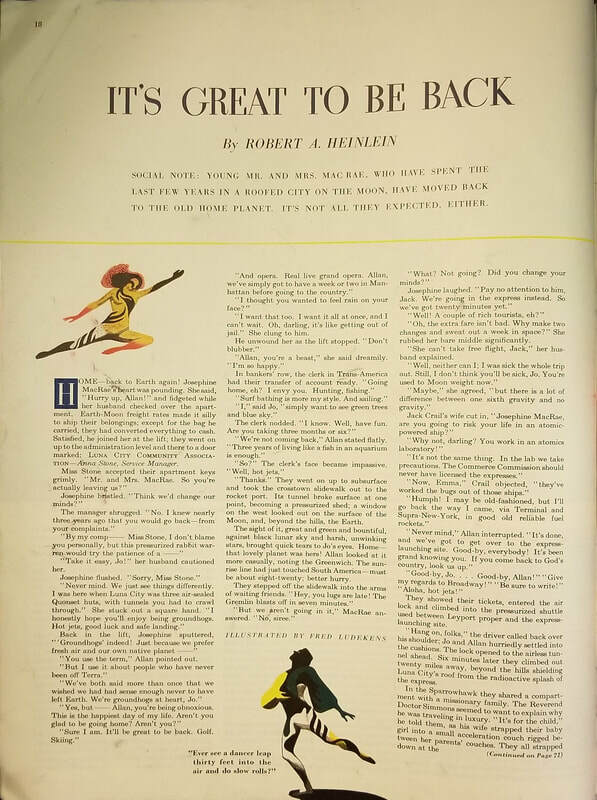 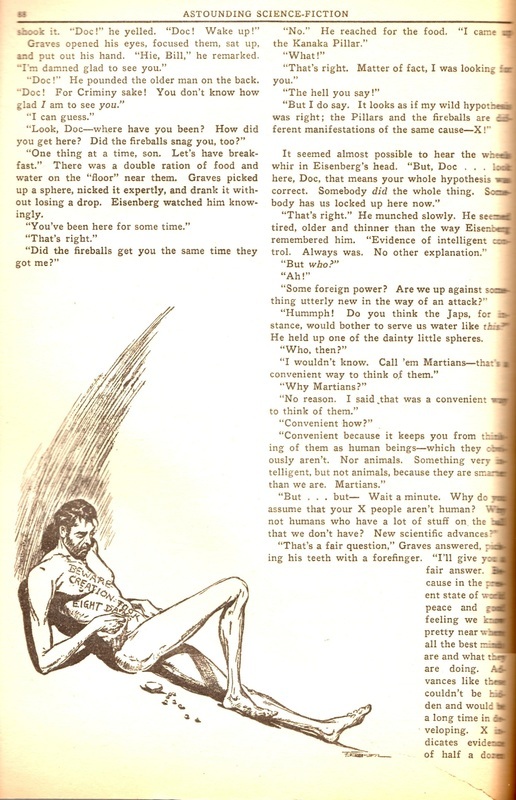 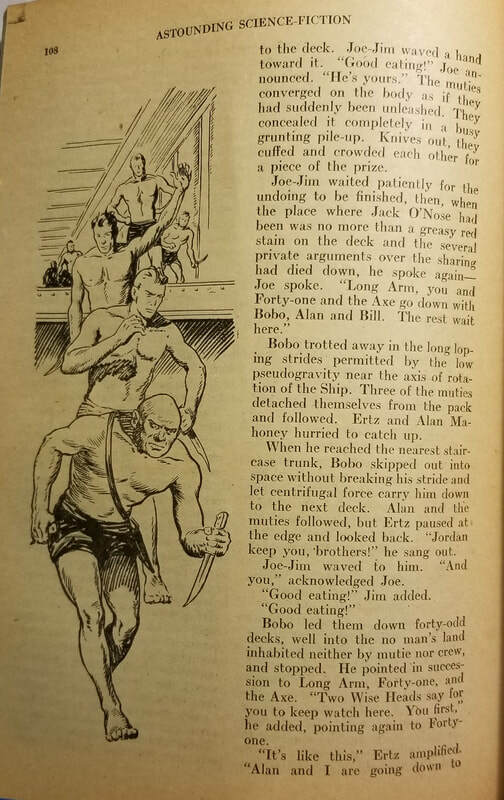 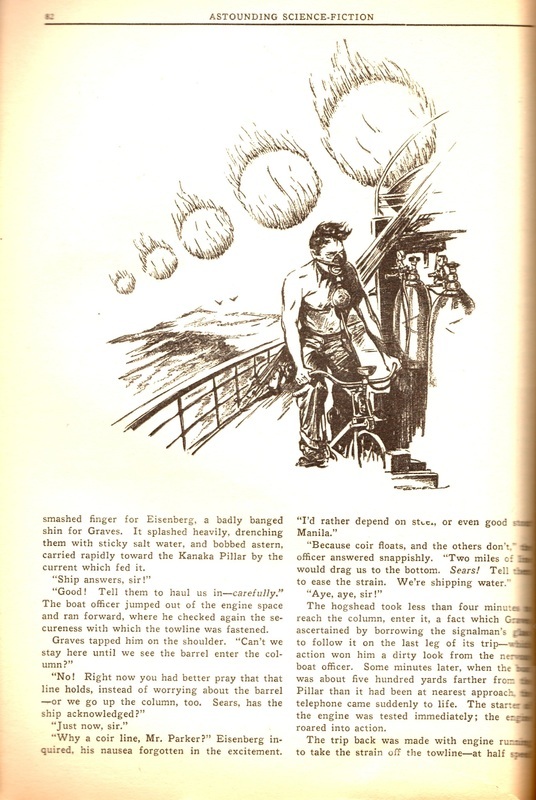 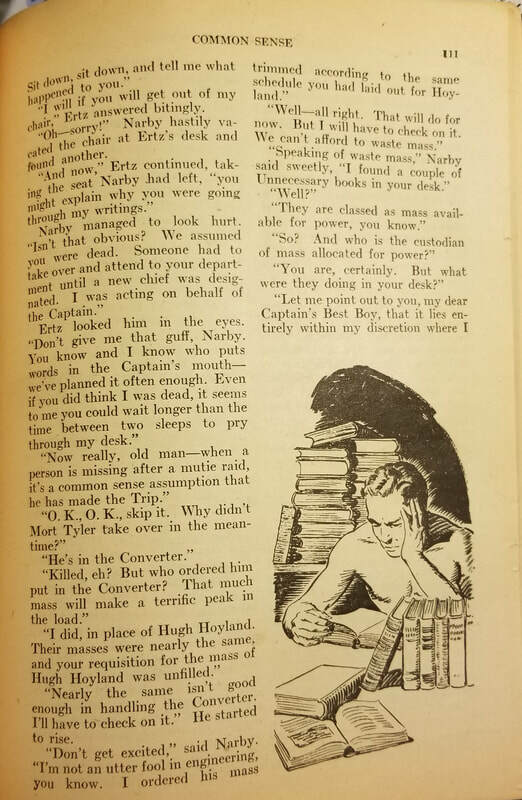 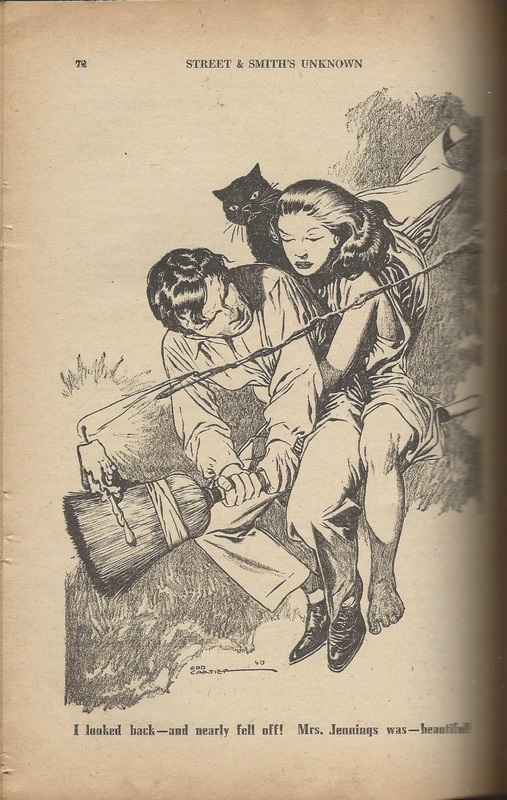 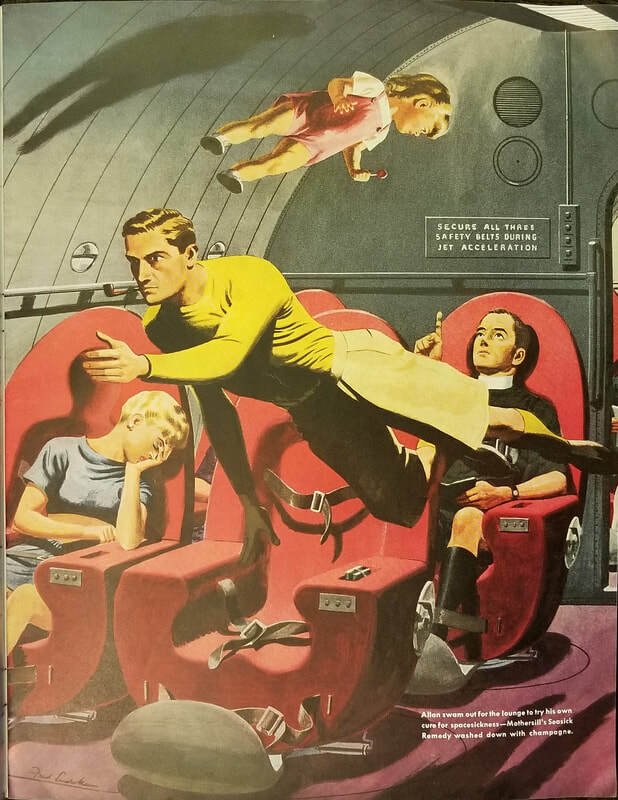 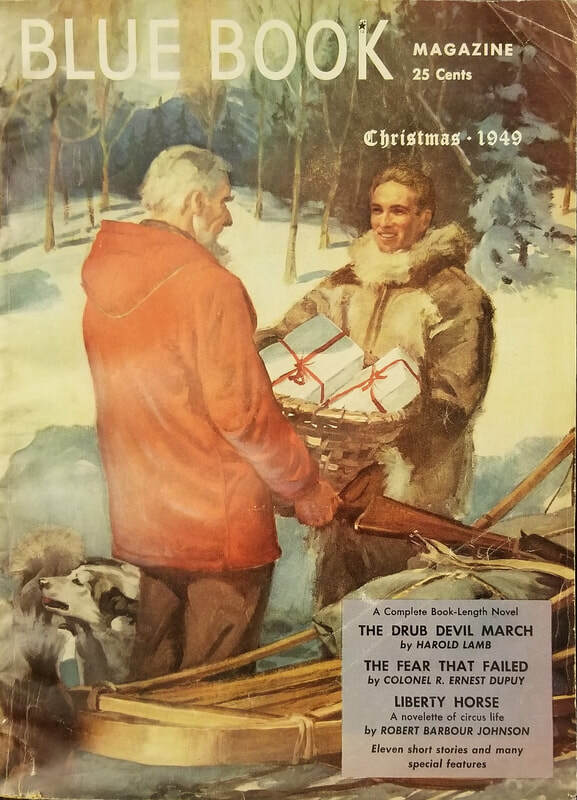 In case there was any doubt, Rogue for Men apparently indeed was, well, for men​... Interestingly, though, these photos really aren’t any more explicit than the painted or pen-and-ink illustrations of most science fiction or fantasy pulps of the 1930, ’40s, and ​’50s.